Brno experienced a building boom in the late 1920s that reflected the growing confidence of the city in the independent Czechoslovakia, created in 1918. 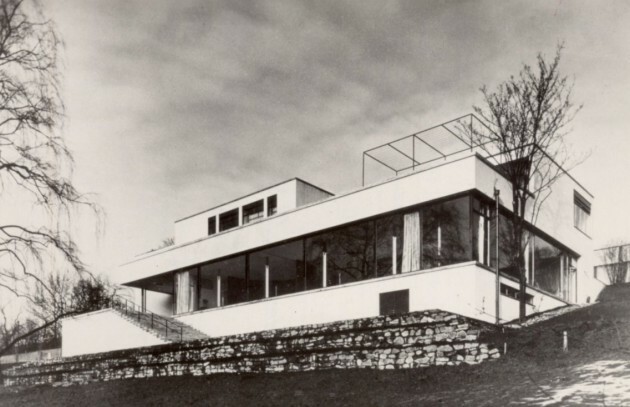 Between 1929-1930 the recently married Grete and Fritz Tugendhat gave Ludwig Mies van der Rohe free rein over the design and construction of their Villa in Brno, 209 kms from Prague. 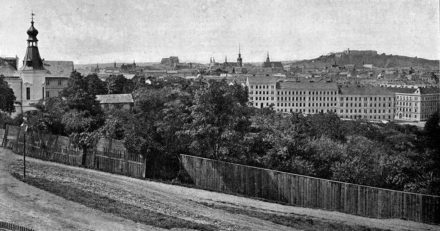 The land occupying an area of 2,000 m² on a southern slope of Černá Pole ( overlooking Brno Castles’ gardens ) was a wedding gift Greta had received from her father, an influential textile manufacturer of Jewish origin, Alfred Löw-Beer. Over eight decades since its completion this iconic work of art has undergone a complicated development as a building both in terms of its structure and the socio-political circumstances surrounding it. 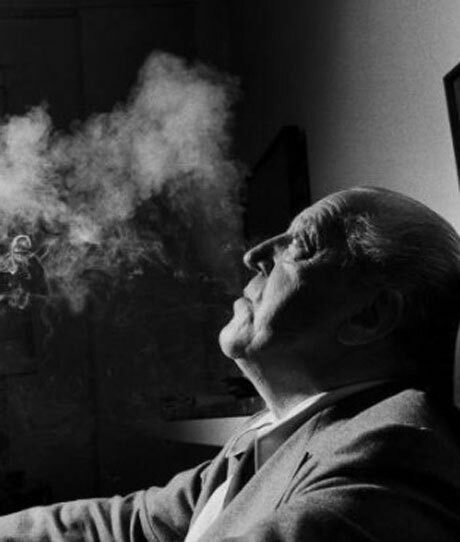 Mies van der Rohe’s ultramodern masterpiece has been many things: a family home, Gestapo headquarters, a dance school, a clinic, an inspiration for architects and the subject of a novel. 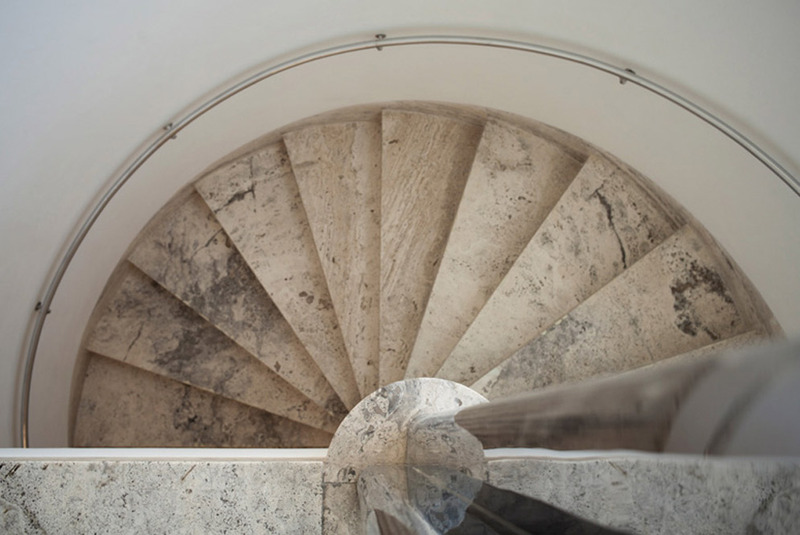 Now, after almost two years of renovation and restoration, Villa Tugendhat is once again ready to welcome visitors through its doors. Villa Tugendhat stands as a salient prototype of historic preservation. 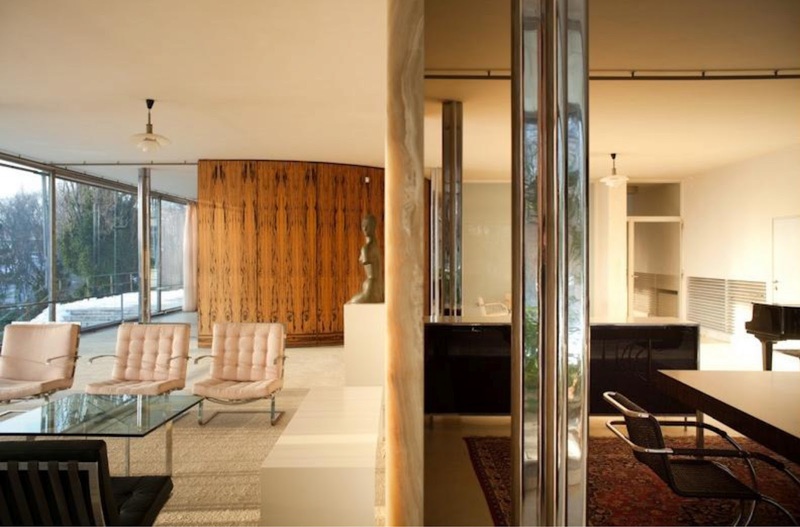 After an extensive research period that pieced together original construction plans archived at the MoMA and photographs of the home from the Tugendhat family, Mies’ masterpiece has been faithfully restored. Spread out over three levels, which seem to disappear into the slope of a hill overlooking the city, the enormous, 2,600-square-meter house featured pieces of specially designed furniture that are now icons of 20th-century design – ( the Tugendhat chair and the Brno chair, are still in production. ) There were no paintings or decorative items in the villa but the interior was by no means austere due to the use of naturally patterned materials such as the captivating onyx wall and rare tropical woods. 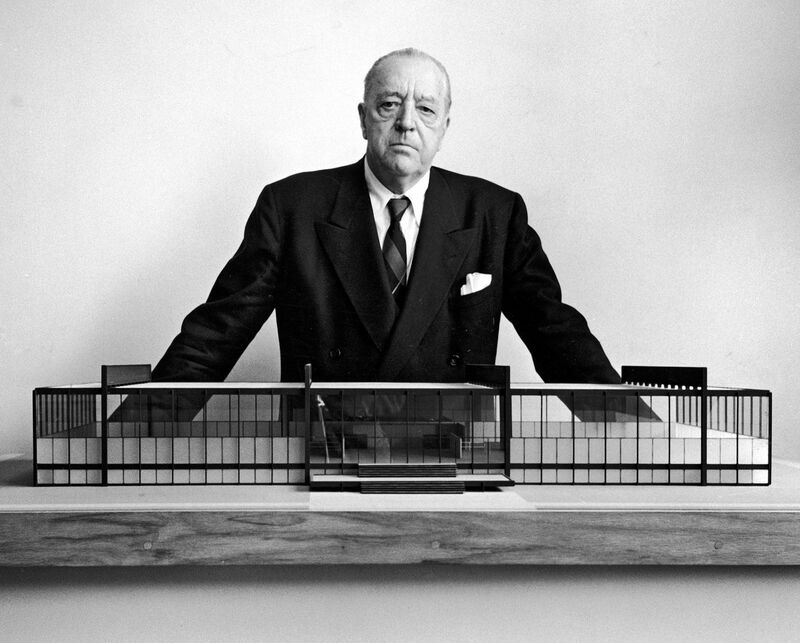 Mies’ created a fine example of early functionalism architecture, a groundbreaking new vision in building design at the time – a poetic union of glass, steel, marble and reinforced concrete that touts Mies’ “less is more” design philosophy through and through. 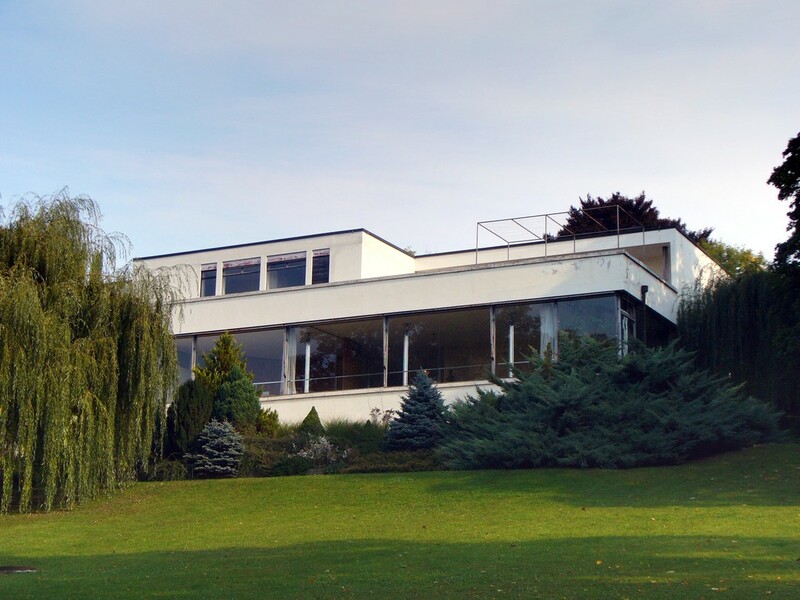 The Villa Tugendhat in Brno is one of the former, and occupies a position in the Mies canon that is worthy of discussion. 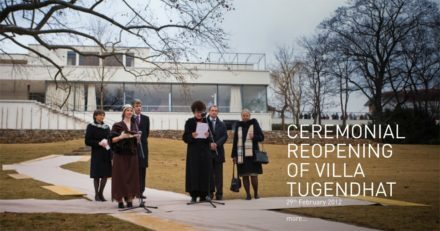 On Tuesday, 29th February 2012, Tugendhat House was ceremonially opened after the two-year monument restoration process. 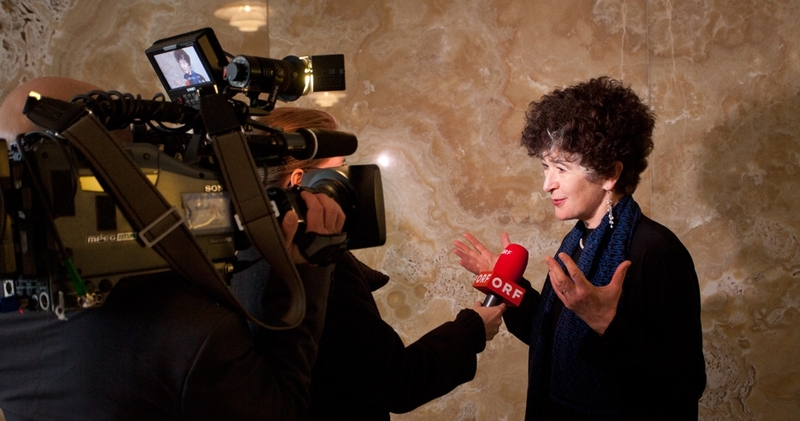 The opening of the house, the unique modern architecture landmark in the Czech Republic listed as the UNESCO world heritage site, was preceded by a press conference attended by the city representation headed by Brno City Mayor, Roman Onderka, Deputy Mayor Robert Kotzian, daughters of the Tugendhat commissioning the house construction, Daniela Hammer-Tugendhat and Ruth Guggenheim-Tugendhat, Ivo Hammer, Wessel de Jonge and Ana Tostoes for the international advisory committee THICOM, managing director of Unistav, Miroslav Friš, and Tugendhat House site manager, Michal Malásek, as well as representatives of the design team and the Museum of the City of Brno. The Tugendhats hosted functions and parties, including large scale bridge tournaments, the proceeds from which were used to help Jewish people fleeing persecution in Nazi Germany. 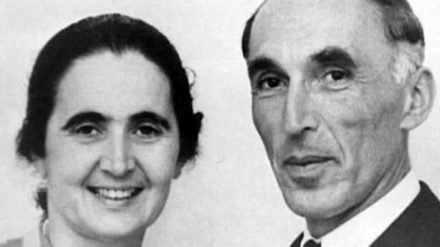 It was through these humanitarian activities that the Tugendhats became certain life for Jewish people would become more difficult in central Europe. Thanks to their contacts in Germany they were well informed about the current developments wherein remaining in Brno would have amounted to a certain sentence of death for the entire family. 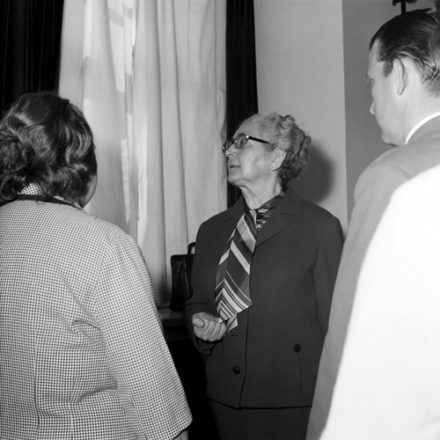 Grete had been involved in activities for the League for Human Rights starting in the year 1933, after Adolf Hitler’s rise to power, which provided financial and practical assistance for political refugees from Germany. 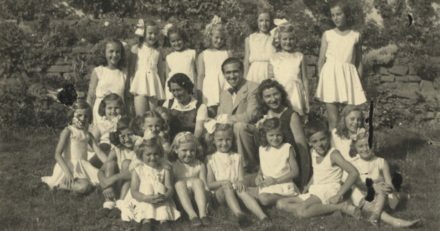 In May 1938, Grete and the children left firstly for Sankt Gallen in Switzerland, and then later for Caracas in Venezuala. Fritz remained in Brno with the governess Irene Kalkofen who helped him in preparing their personal things for transport along with certain pieces of furniture. After Germany’s annexation of Austria in 1938, the Tugendhats predicted rightly that Nazi expansion would continue and so decided to abandon the home. Because they left early, they were able to take many of their possessions, including some of the furniture. Fritz never returned to the villa. At the beginning of October 1939 the Villa was taken over by the Gestapo and from January 1942 became the property of Nazi Germany. The Gestapo were insensitive to the original design and made changes, including erecting several extra walls inside and outside and increasing the height of the chimney. 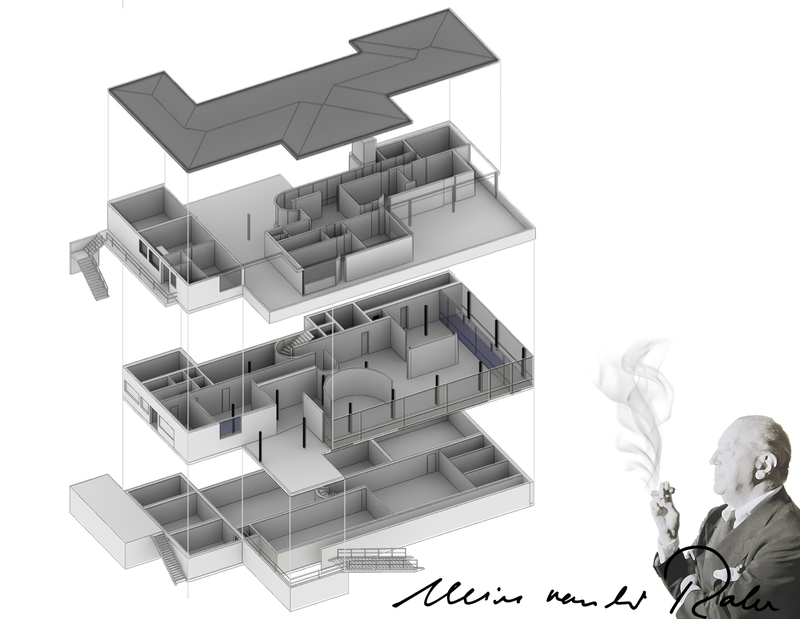 The house was used as an apartment and office; its interior was senselessly modified and many pieces disappeared. In the autumn of the year 1940 the German soldier and architecture student, Louis Schoberth, stayed in the Villa. He became friends with Gustav Lössl, the Tugendhat’s chauffeur who had remained in the house up until the beginning of September 1941. According to Schoberth’s account, the half cylinder from Makassar ebony was no longer in the Villa nor the majority of the furnishings as of the autumn of the year 1940. Radical construction changes came about in the early 1940s when Walter Messerschmidt, director of Klöcknerwerke in Brno, had his flat and office here. He had amongst other things the glazed milk glass wall bricked up at the street façade and the entrance way from the upper terrace. He also increased the height of the chimney and had additional inner walls inserted into the interiors. 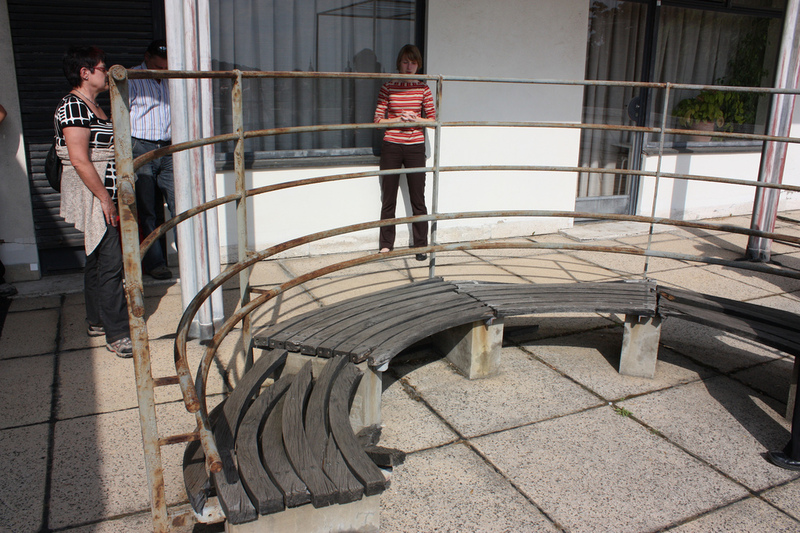 It also housed the design department of the aircraft engine manufacturer Flugmotorenwerke Ostmark. It suffered considerable damage during combat operations at the end of World War II and later, when it shortly served as quarters and stables for the Soviet military. The cavalry regiment of Marshal Malinovský contributed to the devastation of the house upon the occasion of the liberation by the Soviet Army in April 1945. …. The glazed walls were broken as a consequence of the pressure waves during the bombardment. The removal of the damage was entrusted to the Brno architect Albín Hofírek. The broken window panes were temporarily glazed while the linoleum in the main living area was replaced with red wood wool cement board. The private dancing school of Karla Hladká, a teacher at the Brno conservatory, functioned here as of 1st of August 1945. 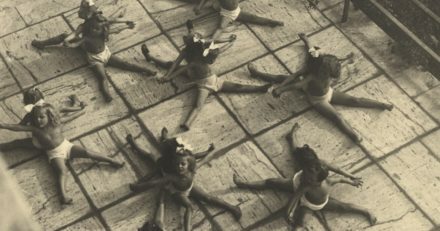 The courses in dance and rhythm in the Villa were mostly attended by girls, with some boys, of a wide spectrum of ages: from the youngest three-year-old children up to adolescents. The private dance school was disbanded on 30th of June 1950. 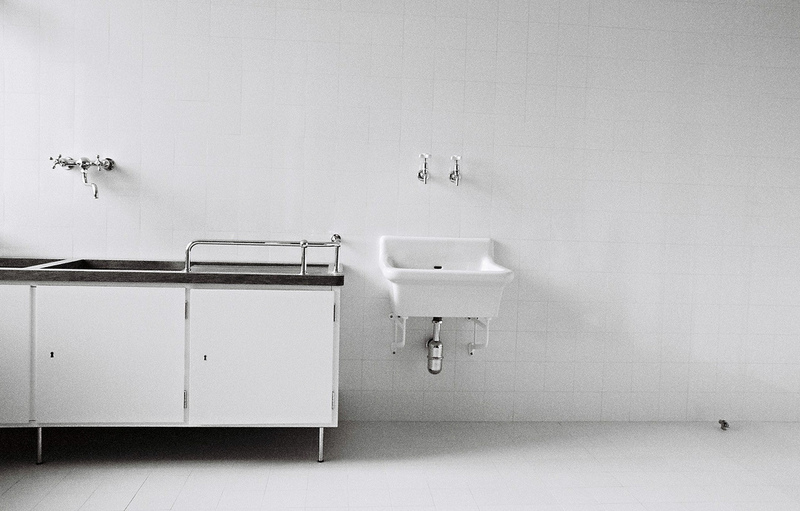 The structure was placed under the ownership of the Czechoslovak state in October 1950 and a rehabilitation centre for children with spine defects was established here as part of the nearby children’s hospital up to the end of the 1960s. Attempts at renewal and a reasonable use for one of the most famous villa structures in the world received a more concrete form at the beginning of the 1960s. 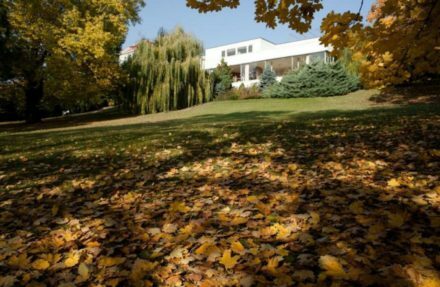 Thanks to restoration efforts championed by Brno-based architect František Kalivoda, the villa was listed as an object of cultural heritage and has been protected since 1963. 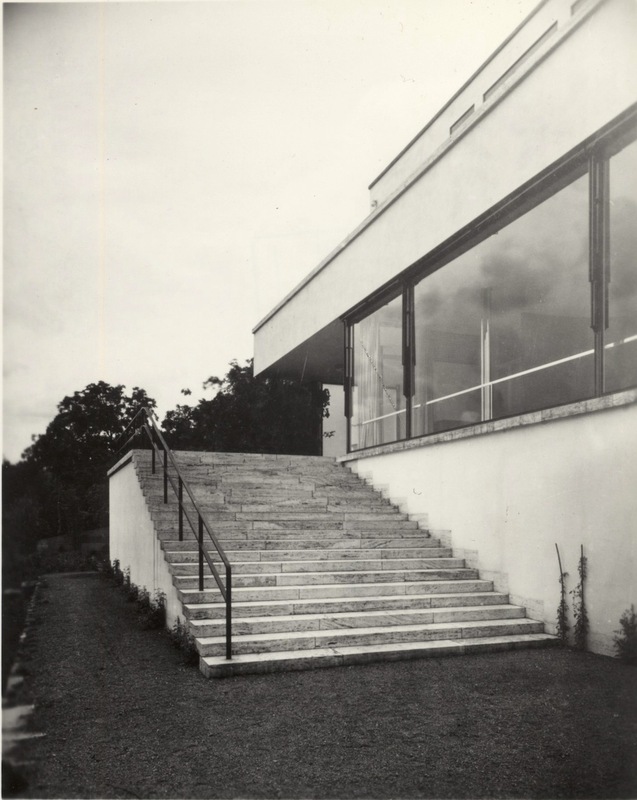 The first concrete step was in December 1963 with the registration of Villa Tugendhat on the list of architectural cultural monuments. The main force behind these activities was the Brno architect František Kalivoda (1913-1971). 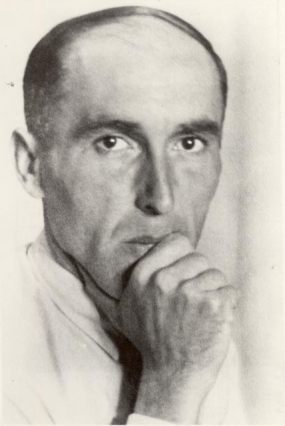 He was capable of implementing and realizing numerous excellent projects in various areas of culture, from publications up to organisation of international events dedicated to renowned figures of Brno such as Viktor Kaplan or Adolf Loos even within the political and social atmosphere of Socialist Czechoslovakia of the time. 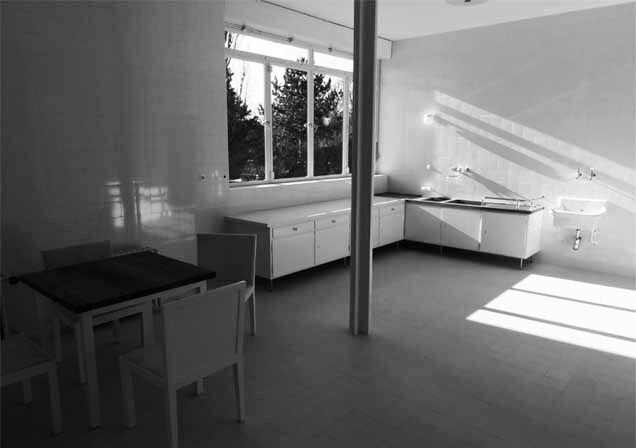 Thanks to his specialised training in the area of architecture along with his remarkable personal contacts with world respected figures in the branch, he succeeded in intense work on the rehabilitation of the Villa. He established a personal correspondence with Grete Tugendhat who lived in Sankt Gallen in Switzerland at the time. She consequently visited Brno at his personal invitation in November 1967. 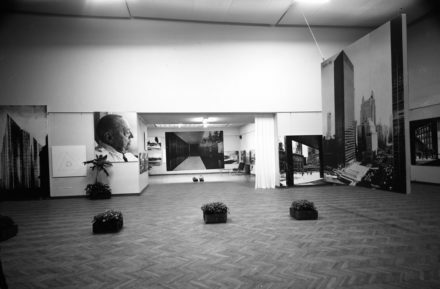 An exhibition on the work of Ludwig Mies van der Rohe took place in the Brno House of Arts from the 20th of December 1968 up until the 26th of January 1969 which had been prepared in two identical collections in Chicago and West Berlin. It came to Brno thanks to the initiative of the monument institute as well as the personal involvement of František Kalivoda. 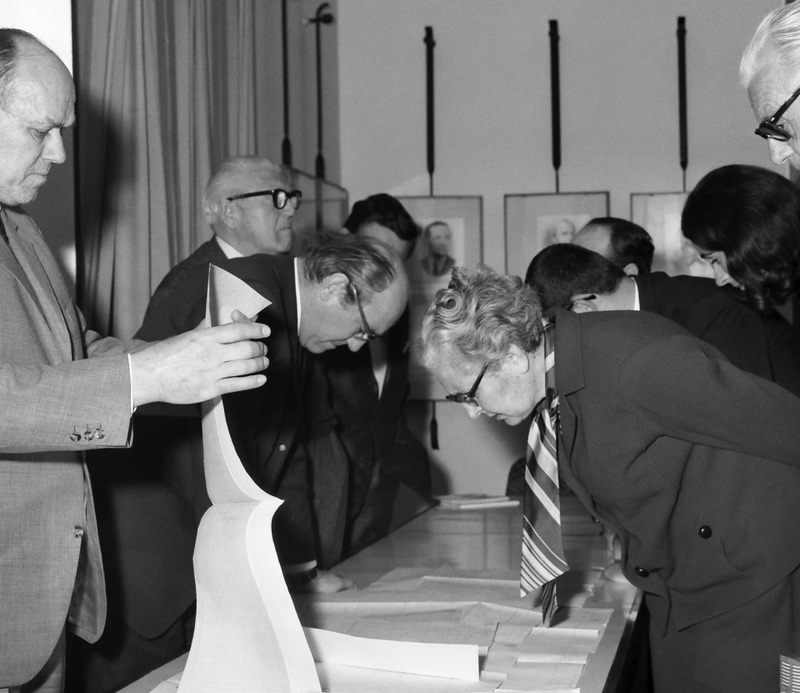 A one-day international working conference along with a lecture evening in the House of Arts that same day took place as part of the exhibition on the 17th of January 1969. Grete Tugendhat spoke at the event with a speech rendered in Czech on the circumstances and course of the construction of the Villa, concerning the interiors, the materials and the technical furnishings along with the communication between the commissioners and the architect. 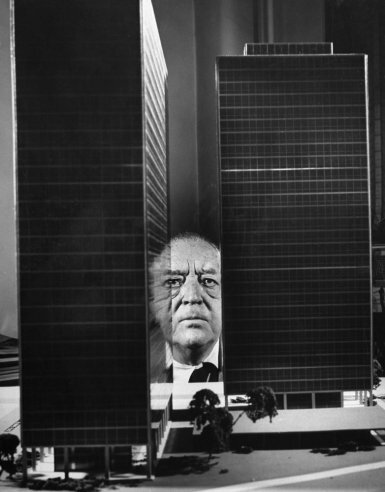 Here mention was made once again of Mies’ ‘I will not build’. The personal participation on the part of Grete Tugendhat along with the architect Dirk Lohan, the grandson of Ludwig Mies van der Rohe, who could not come to Brno at the time, created high hopes for the renewal of the Villa. 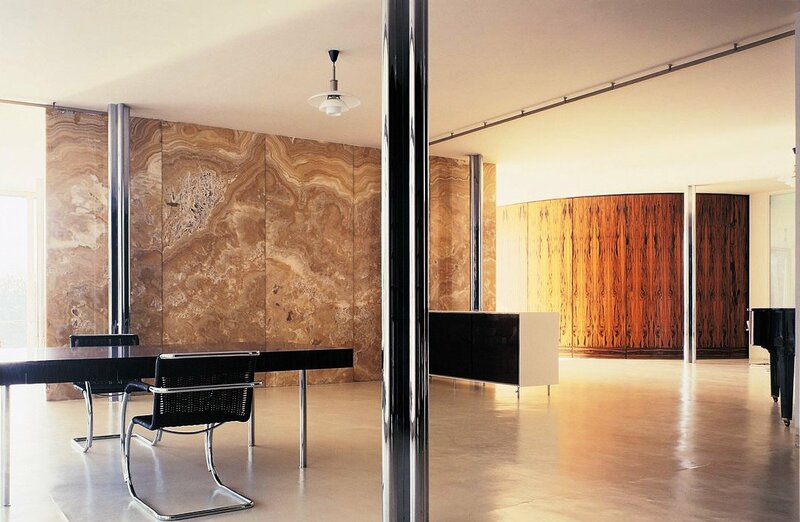 Mies’ Chicago office was prepared to cooperate on restoration of the Villa. 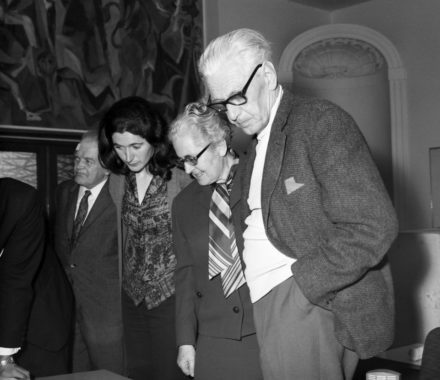 František Kalivoda discussed the renewal of the garden with the co-author of the project Markéta Roderová-Müllerová in April 1969 who was ready to prepare a plan for planting the garden in accordance with Mies’ concept. 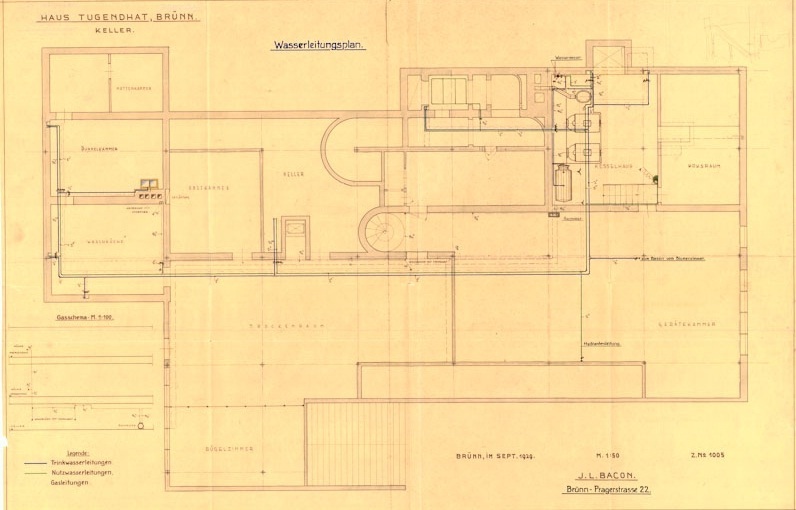 There were also considerations regarding a plan for connecting the Tugendhat Villa garden with the garden of the Löw-Beer villa, this having originally made up a territorial whole, although not an architectural one. After the occupation of Czechoslovakia in the year 1968 and in particular after the emergence of the political lines in the year 1969 the situation changed dramatically with the liberalized conditions brought to a halt. 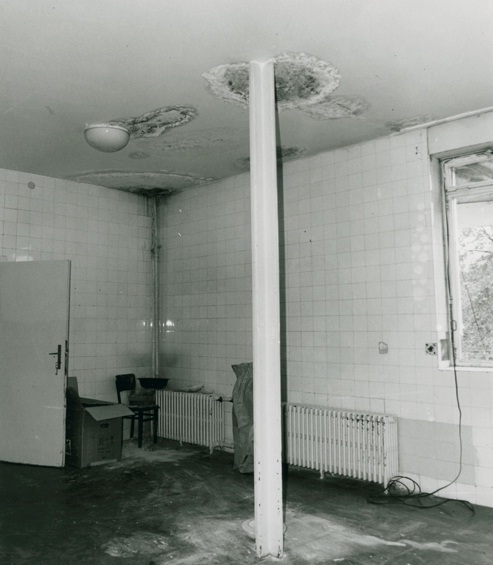 Despite the fact that Grete Tugendhat was able to visit Brno several more times up until April 1970, attempts at renovation of the Villa were discouraged. A definitive full stop to this stage came about with the deaths of the main protagonists of all the activity (Ludwig Mies van der Rohe passed away in August 1969, Grete Tugendht in December 1970 and František Kalivoda in May 1971). 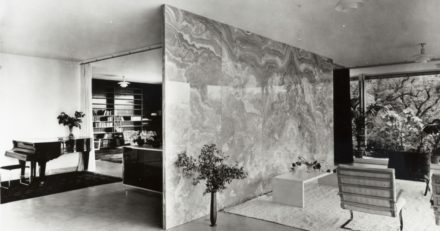 The architect’s daughter Georgia van der Rohe was even forbidden to carry out shooting in the Villa for a film about the life and work of her father in the year 1979. 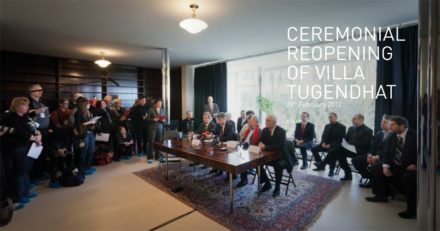 Villa Tugendhat moved from the property of the state to the property of the City of Brno in the year 1980 with a new stage in its history consequently beginning. This consisted of a compromise, but a necessary and beneficial step in the end. The Brno exhibition also presented reconstruction plans for the villa; these were not implemented until 1985, based on designs by Kamil Fuchs and Jarmila Kutějová. By that time the villa was already owned by the City of Brno, whose representatives used the villa as a conference centre and accommodations for important visitors. The villa first opened to the public in 1989 following the Velvet Revolution, and three years later hosted the talks that led to the split of Czechoslovakia. 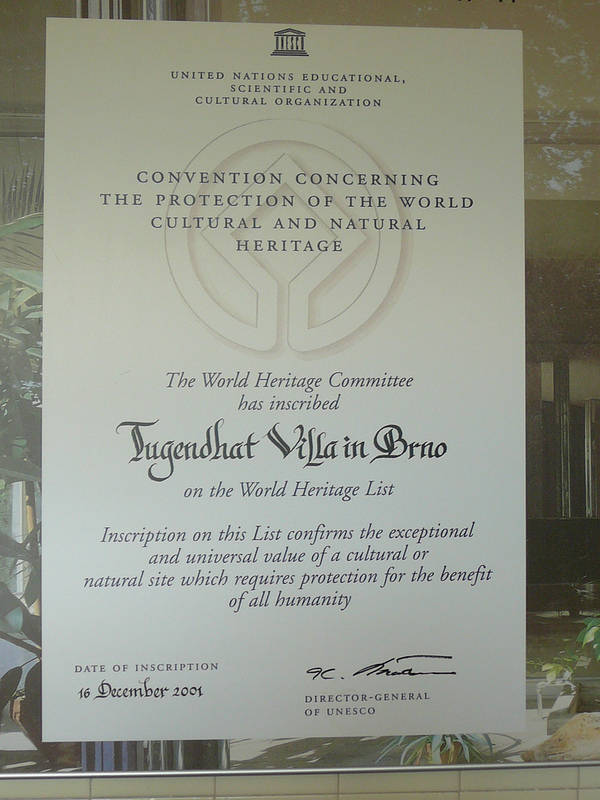 It was inscribed on the National List of Cultural Heritage in 1969 and restored after 1980. In 1992 the political leaders of Czechoslovakia met there to sign the document that formally divided the country into the present separate states of the Czech Republic and Slovakia. Since 1994 the villa has been open to the public as a museum administered by the city of Brno. The city of Brno disputes that. At issue is the question of whether, under restitution law, a home can be considered a work of art. Brno City hall. 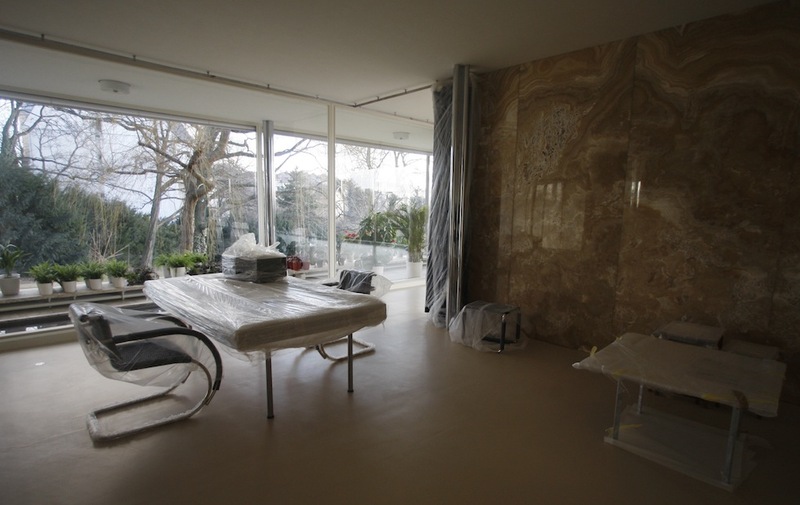 “By our definition of the law, Villa Tugendhat is real estate, not a work of art. A work of art would be a painting, for instance, or something you can move around. 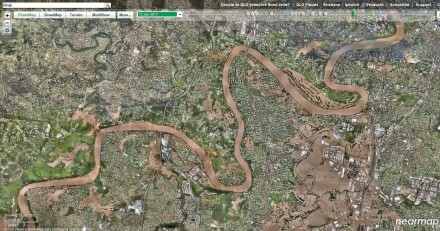 It’s not a piece of land or a building on it. And for that reason, we can’t consider returning it. 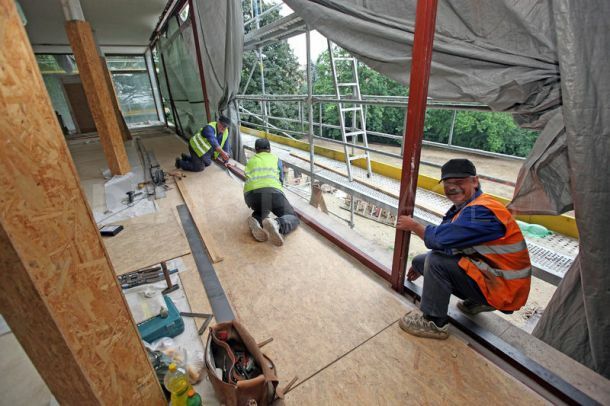 The City of Brno now owns the villa and they arranged ( under the supervision of an international team of experts) a reconstruction and restoration of the villa at a cost of approx $ 8.8 million. 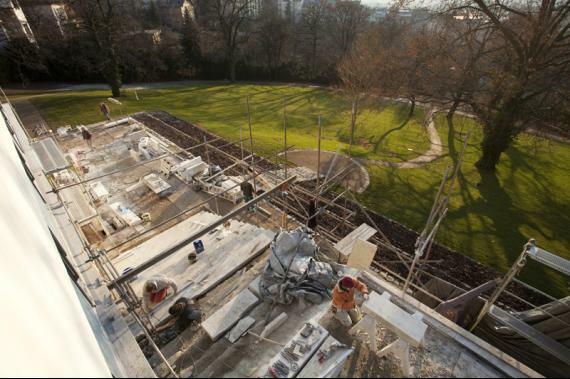 This reconstruction started in Feb 2010 and finished in Feb 2012, with the Villa reopening to the public on the 9th Mar 2012. 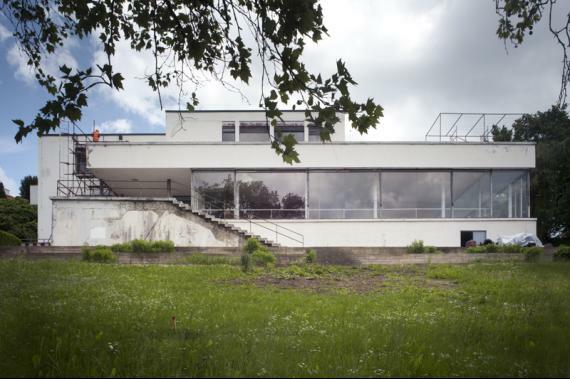 “It has been an incredible fight,” says Daniela Hammer-Tugendhat, daughter of the original owners, adding that she has been trying for decades to return the house to its former splendor. 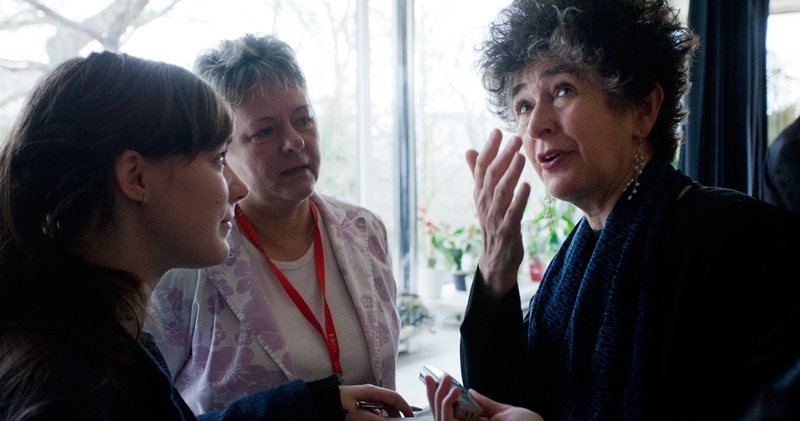 Following the fall of communism in 1989, Ms. Hammer-Tugendhat and her surviving siblings considered their options. After receiving some of the contents back as restitution starting in 2006, the family initiated efforts to get back the house “in order to save it,” she says. A lawsuit was never brought, but she believes that legal rumblings and the family’s objections to the house’s condition helped pave the way for restoration. 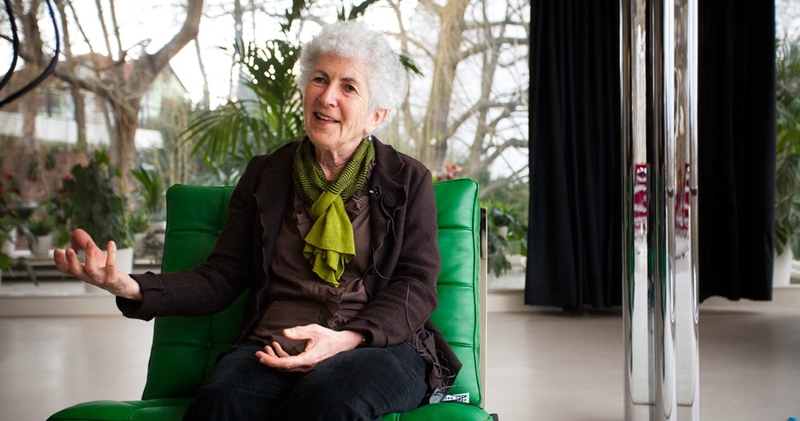 Born in 1946 in Caracas, Venezuela, where her family had sought refuge during the war, Ms. Hammer-Tugendhat is now an art historian based in Vienna. 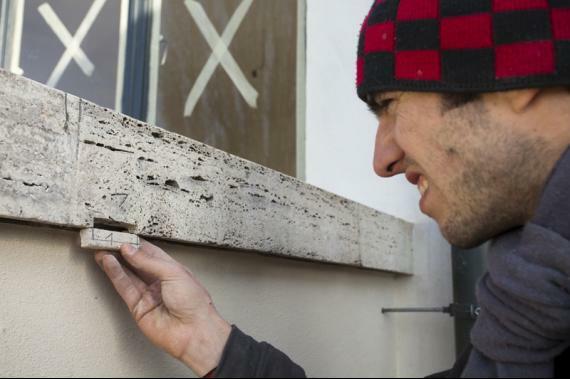 She and her husband, the architectural conservator Ivo Hammer, actively participated in the restoration process, which was devoted to using original materials and techniques. 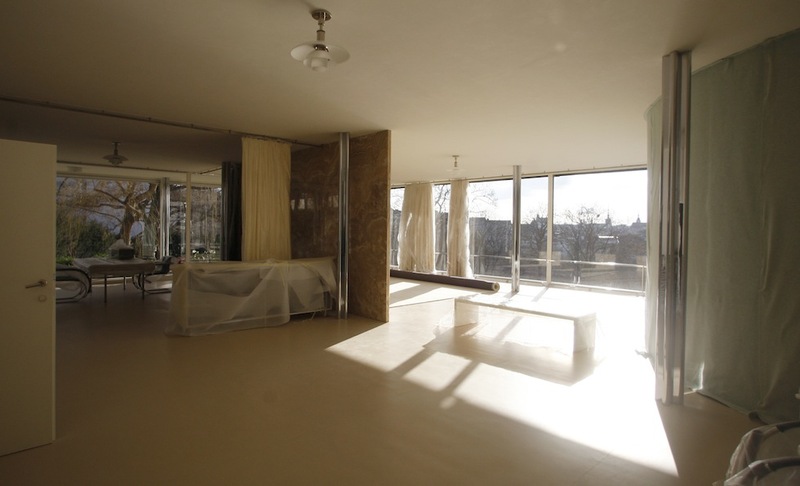 Built of reinforced concrete, Villa Tugendhat soon became an icon of modernism. 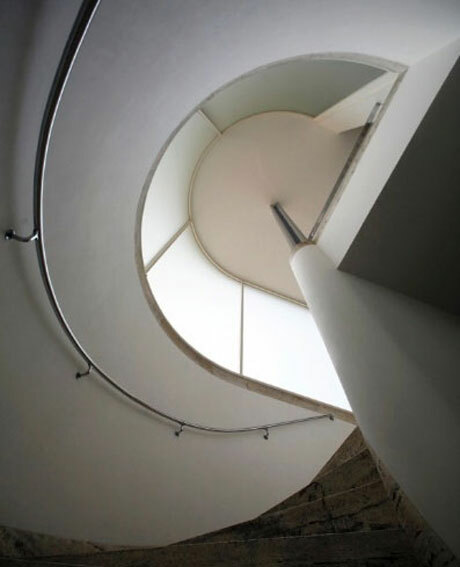 The 3 storey house became famous as one of the pioneering prototypes of modern architecture – in terms of the structural system, layout, interior furnishing, services and the integration of the building into the natural environment. The innovative and progressive design of the house is immediately apparent upon entry. It’s easy to forget that it was built in the late twenties because it feels like a building from a later decade. You enter at the top and descend into the large open living space. This inversion of traditional design is the least of Mies’ departures from conventional architecture. The architect presented the completed design for the villa by the end of 1928. His design was based on the concept of Germany’s pavilion for the international exhibition in Barcelona, which he adapted to the needs of his customers in Brno. 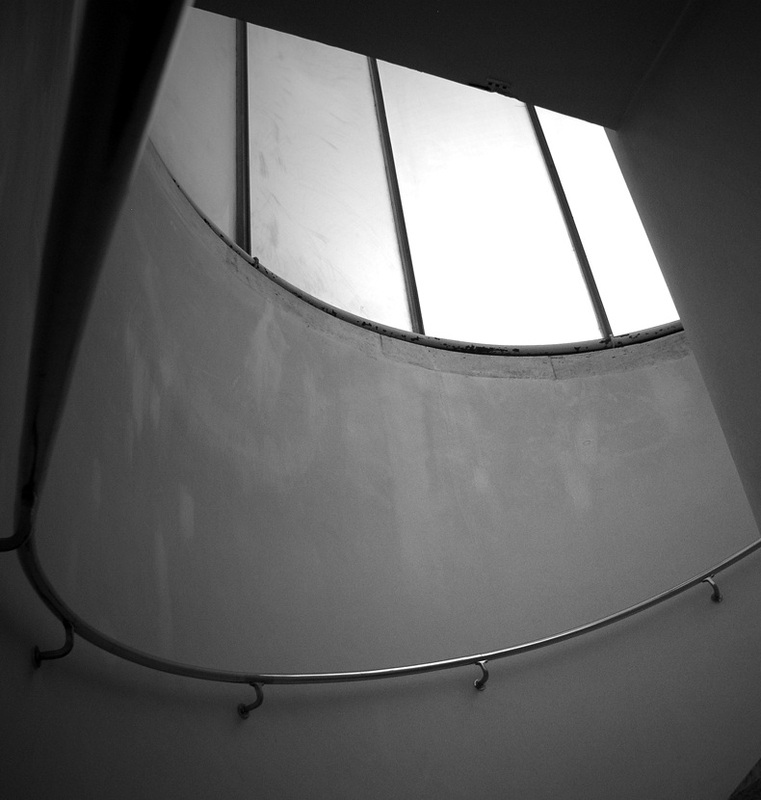 The uniqueness of the design lies in the use of a steel support structure (the first time it had been used for a detached house), which enabled unlimited ways of handling the interiors as well as the generous glazing of the facade. The design produces the free-flowing space in the main residential hall and its merging with the exterior through large sliding windows. His revolutionary approach started with the support. Twenty-nine steel columns hold up the house. This frame eliminates the need for load-bearing walls in the living area, so it is open, light, and spacious. 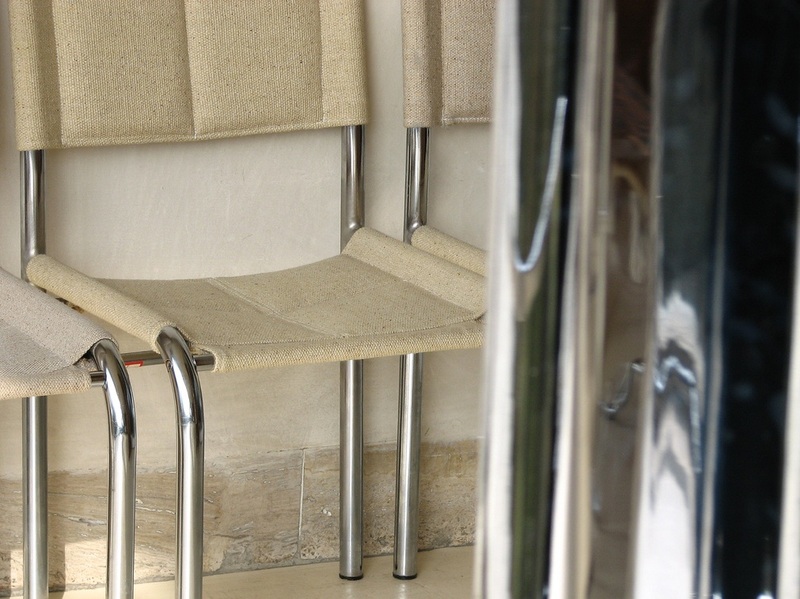 The columns, still in their original stainless steel casings – now polished to a mirror shine, also form part of the interior decor. 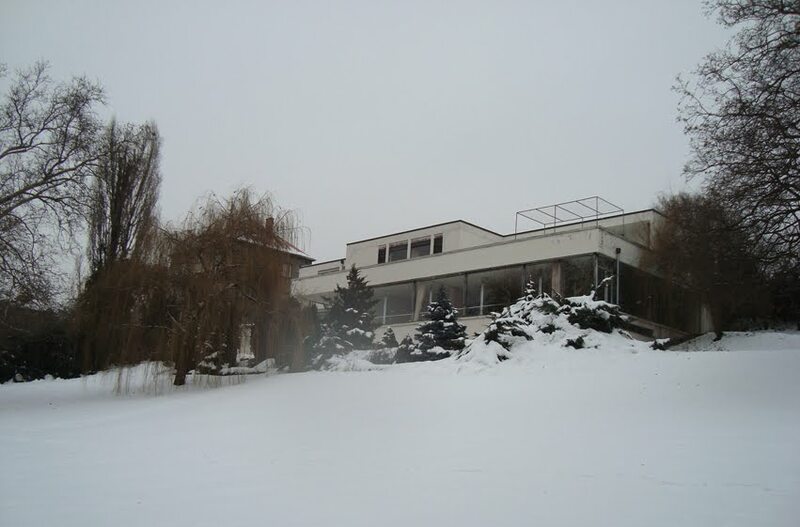 The construction company of Mořic and Artur Eisler of Brno commenced the work in June 1929 and, under the architect’s supervision, completed the villa in eighteen months. The 3 storey villa is set on a slope and its main living spaces face southwest towards the garden. 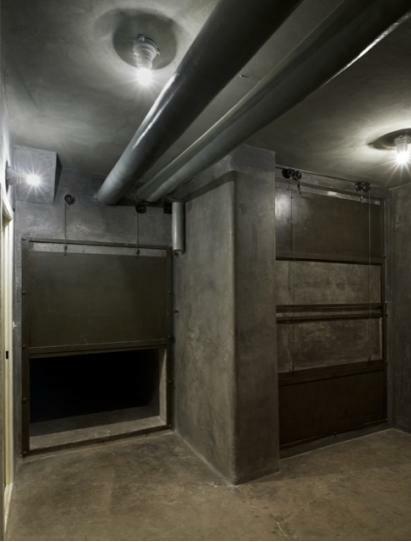 1) The first storey, the basement, contains the utility facilities. 2) The second storey, the ground floor consists of the main living and social areas with the conservatory and the terrace as well as the kitchen with facilities along with the servants’ rooms. 3) The third storey, the first floor, has the main entrance from the street with a passage to the terrace, the entrance hall, the rooms for the parents, children and the nanny with appropriate facilities. The chauffeur’s flat with the garages and the terrace are accessible separately. Therefore, the street facade consists only of the third level with a gracefully sunk entrance door and the garage with the chauffeur’s apartment, the volume of which on the entrance terrace frames a view of the city with their shared roof. The entrance hall leads to the bedrooms of the parents, children and governess; these rooms also have access to the upper terrace overlooking the garden. A spiral staircase descends to the second floor with the flowing living space, which, owing to the generous glazing and conservatory, visually merges with the exterior. 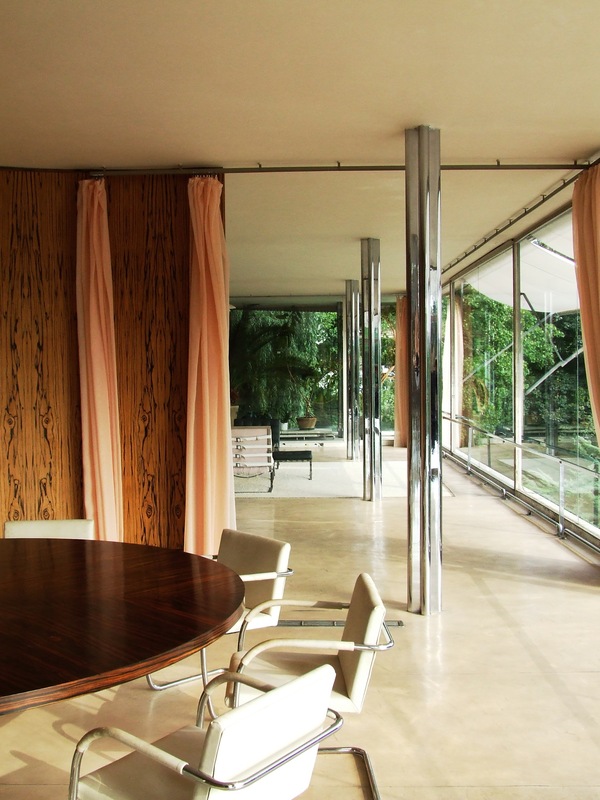 The villa’s individual functional zones are merely hinted by impressive partitions or curtains. The dining corner is separated from the rest of the free space by a round ebony screen; the study and the sitting space are separated by a wall of Moroccan onyx which colours the room red at sunset. 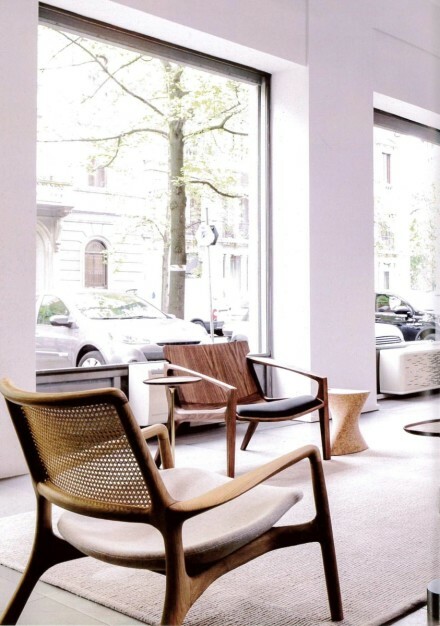 The architect designed the interior furnishings along with his collaborators Lilly Reich, Hermann John and Sergio Ruegenberg; these involve bent tubular furniture (the Brno chair, the Tugendhat and Barcelona armchairs) and built-in wooden furniture from fine hardwoods manufactured by Jan Vaněk’s interior design company Standard. 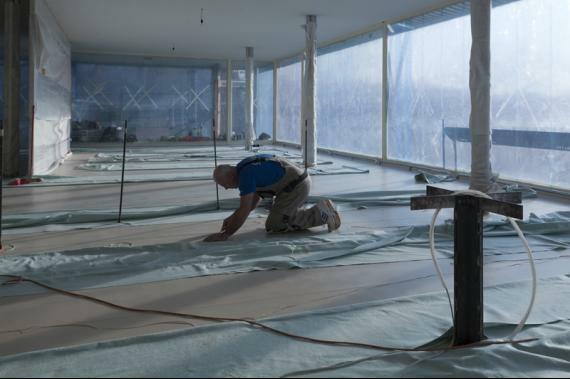 The highlights of the entire residential space involve its technical equipment including the ingenious air conditioning system which cleans the air and freshens it with sea salt and the large windows in metal frames, which can be fully rolled down into the floor. The dining area provides direct access to the terrace with the staircase and the garden designed by Mies and Brno garden designer Markéta Roderová-Müllerová. The service areas of the villa are accessible via a separate entrance from the street and consist of the kitchen and domestic staff rooms on the second floor as well as vast technical facilities on the ground floor. And yet, the professional response to the architectural work was varied. 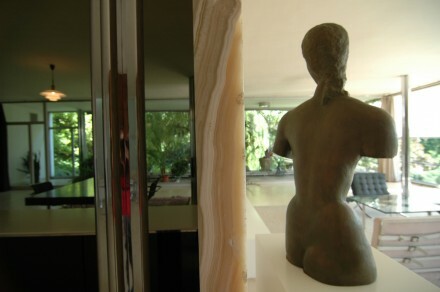 While Philip Johnson, the American architecture theoretician, who held an exhibition of Mies’s works in the Museum of Modern Art in New York in 1947, compared the villa to the Parthenon in Athens, “domestic architects, at that time preoccupied with issues of affordable housing, reproached its pomp and luxury represented by the expensive materials and excessive spaciousness”. Czech theoretician Karel Teige dubbed the villa “the peak of snobbery and held it to be the dead-end of modern architecture“. The house is supported by a huge supporting concrete wall at the site of the street level, thereby creating an expansion between the high edge of the terrain at Černopolní street and the actual structure. The construction of the plastered structure consists of a steel skeleton, reinforced concrete ceilings and brick masonry. The subtle supporting columns of a cross-shaped profile are anchored in concrete bases and partially lead through the masonry and partially through the spaces of all the floors. Shiny chrome classing is employed in the living area. 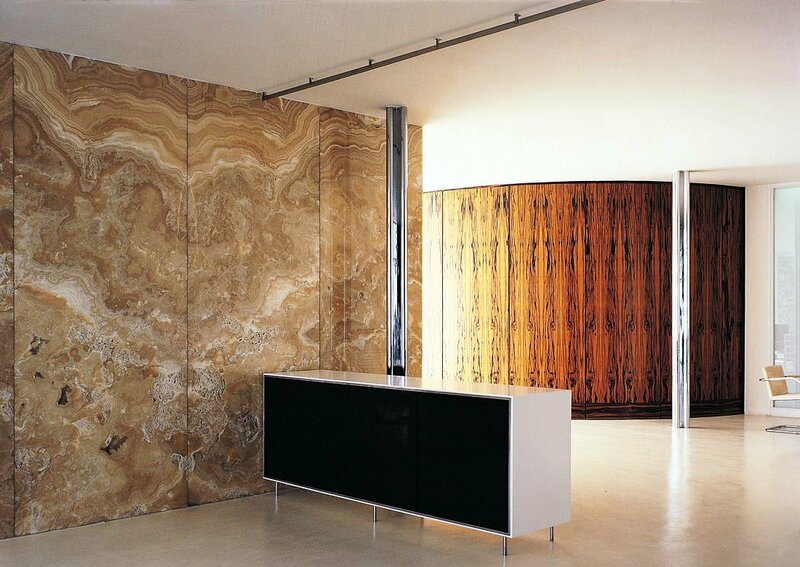 The individual functional zones within the area are divided up by the wall from honey and yellow coloured onyx with white veins from the foothills of the Atlas in Morocco and the half-circular wall originally from Macassar ebony wood mined on the island of Celebes in south-east Asia. An additional separate room could be entered through drawing back curtains made from shantung silk and velvet. The most prominent feature of the ‘flowing’ living area was the grand seating arrangement in front of the onyx wall and the dining room demarcated by the half-cylinder from Makassar ebony. The interior could be connected up with the garden through suspension of the two large window panes. The office with the library and the adjoining winter garden was behind the onyx wall. Behind the ebony curved wall was a seating area next to a wall from milk glass which could be lit up. 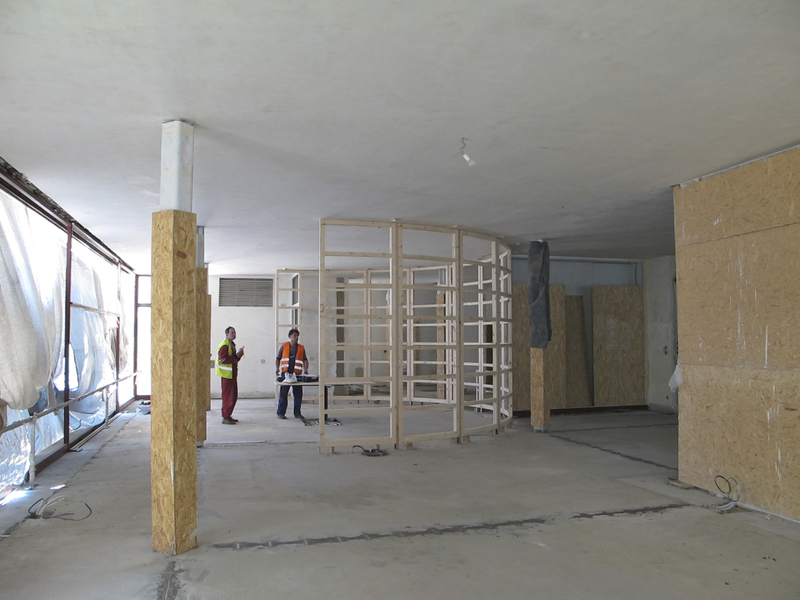 The structure was realized, under the supervision of the author and with the participation of a number of domestic and foreign companies, by the Brno construction company of Artur and Mořic Eisler. It was completed in December 1930 when the Tugendhats finally moved into the house. 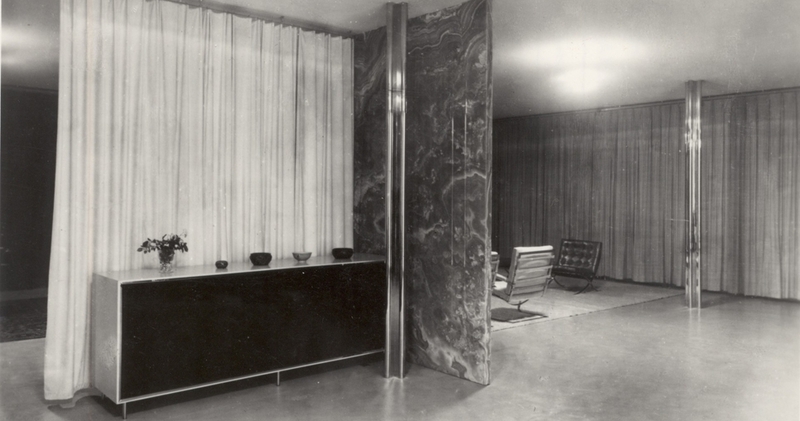 Mies didn’t stop at the aesthetics of the space. He wanted the home to be comfortable. 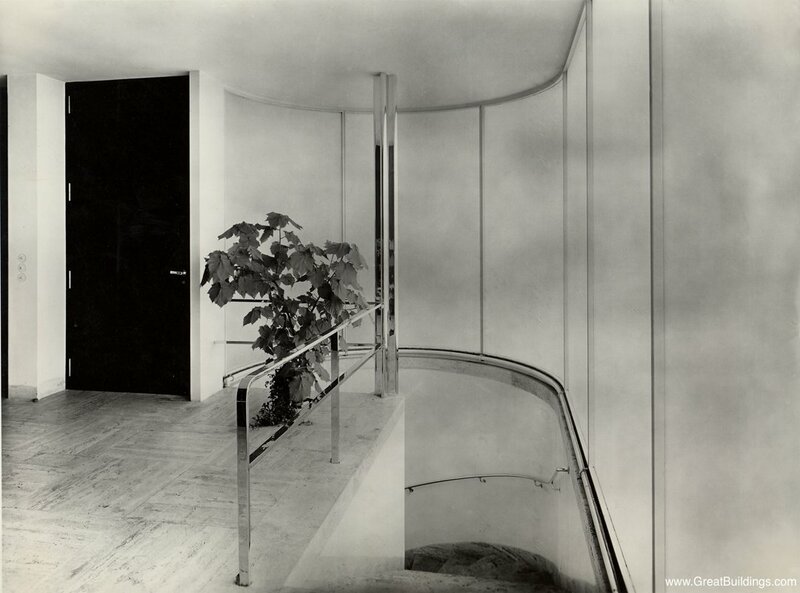 For all its technical and artistic marvels, the Villa Tugendhat was first a foremost a family house. Fritz and Grete enjoyed afternoon tea in the living room and games of bridge in the library. The children made full use of the large garden, which had ample room for sledding and skiing in winter. In the summer time, the family would get together with Grete’s parents, who lived in the adjacent villa below, to sunbathe and relax. The utility and technical equipment of the house were completely innovative for the time. Among the most spectacular features are the two large (5m x 3.5m) windows which lower at the push of a button. The two large windows could be retracted via electric motors all the way to the floor. The original mechanisms are still in use. The Tugendhats’ comfort was further ensured by an air-conditioning system, again another first for a family home. 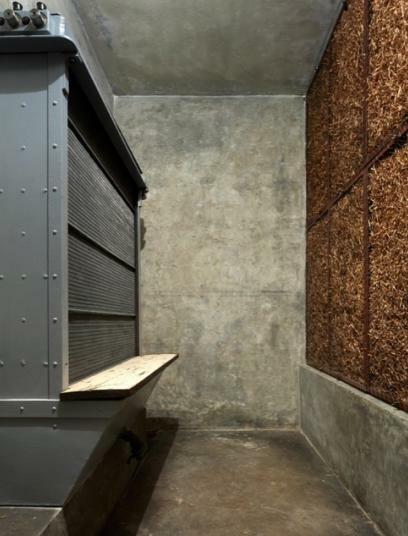 The ventilation, which is unobtrusively incorporated into the walls, is controlled down in the cellar by a system of switches, allowing the occupants to control the temperature in different parts of the house. An additional degree of comfort was ensured by the air filtration system. The air passed through a steel mesh, which constantly moved through a bath of oil, so to remove dust and pollen. The air then flowed through cedar wood chips to freshen it. 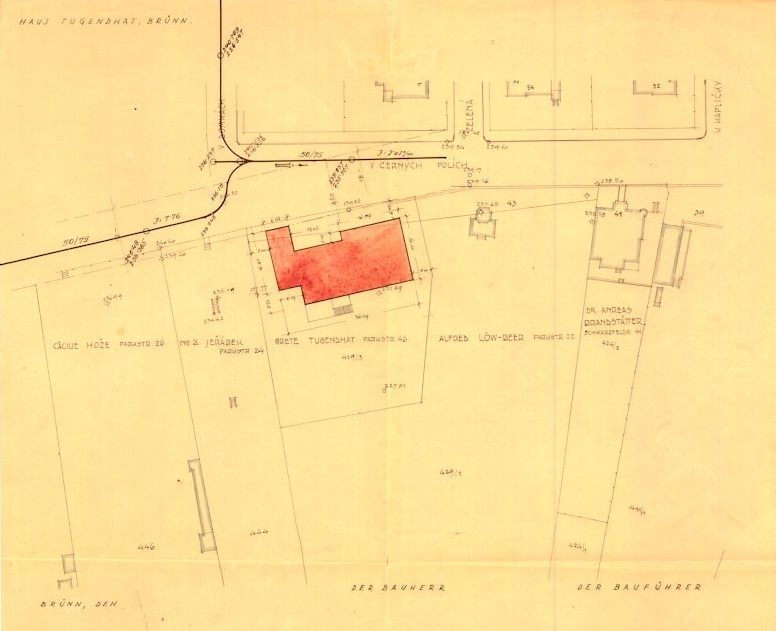 The boiler room and storage areas for coke, the cellar, spaces for garden furniture and tools, rooms for fruit and vegetables, wash room, drying room, ironing room as well as the “moth room” for storage of fur coats were in the basement. 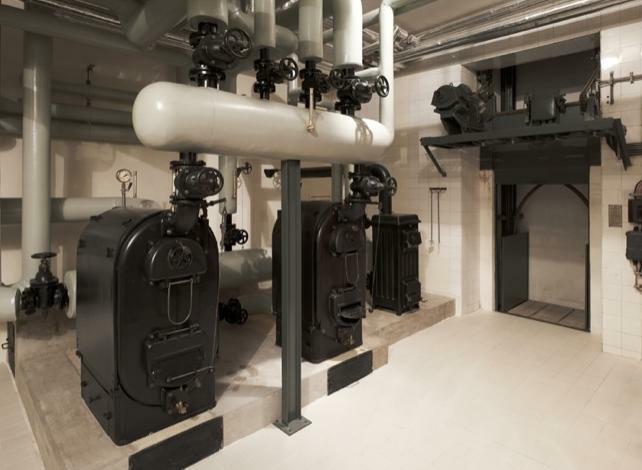 There was a distribution system for drinking and utility water as well as an air system, involving a combination of heating, cooling and humidification. 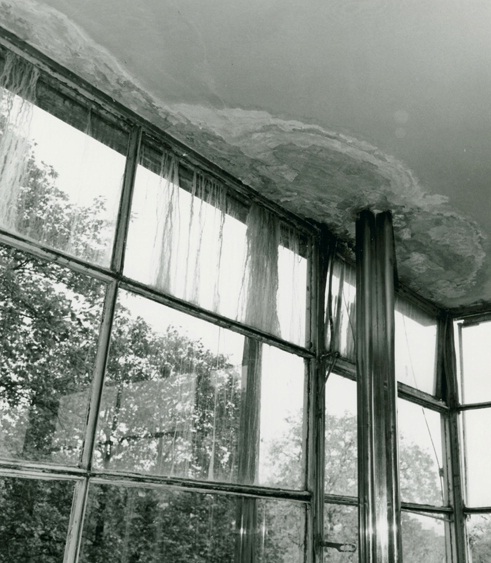 The destruction of the only preserved glazing of the retractable window ranks among the most discussed moments in the renewal and reconstruction of the Villa in the 1980s. It was preserved due to it having been retracted to the floor at the time of the bombardment at the end of World War Two, thus being protected from the pressure wave in the engine room behind the plaster of the enclosure walls. The project contained a requirement for the provision of glazing for this plate along with retouching of the frame construction and consequent placement of the original plate back. “When we came that time on the supervision day, I still remember it as if it were today, the plate was no longer there, there were not even any broken shards of glass”. These are the words of Ing. Josef Janeček describing the situation at the time. This irreplaceable loss, often blamed on the designers, was only definitively solved quite recently. 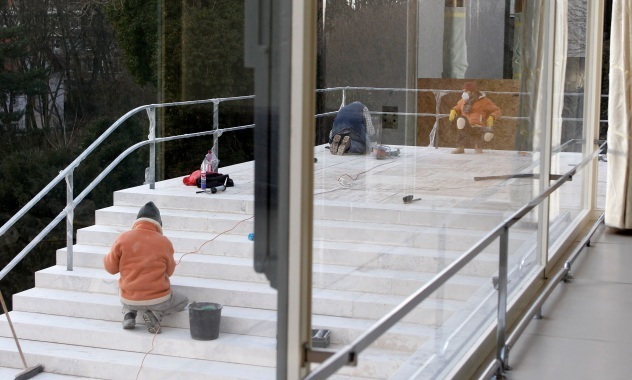 According to an account of one of the employees of the Construction Company of the City of Brno, who worked at Villa Tugendhat in the 1980s, the window was destroyed during the final phase of construction at the order of the investor. The reason behind this being the fact that the ‘old’ window did not ‘fit’ with the new glazing in terms of its colour scheme and the absence of a dividing seam and therefore the new glazing of the garden façade had to be ‘made uniform’. 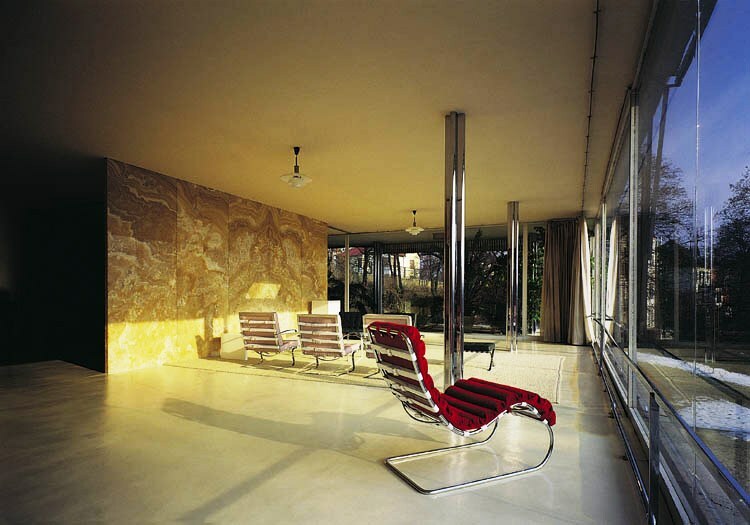 The inner furnishings of the house were designed by Ludwig Mies van der Rohe along with his colleagues Lilly Reich and Sergius Ruegenberg. 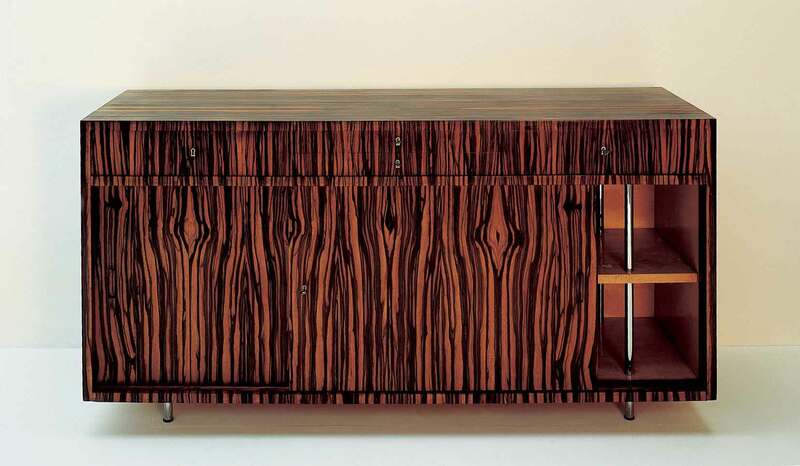 The furniture was primarily from tubular and strip steel as well as from noble woods (rosewood, zebra wood and Macassar ebony). Three ‘Tugendhat’ armchairs stood in front of the onyx wall upholstered in silver-grey ‘rodion’ material, three ‘Barcelona’ armchairs and a stool in emerald green leather, a glass table and a white bench. A colour accent was provided by a reclining chair with ruby red velvet upholstering. 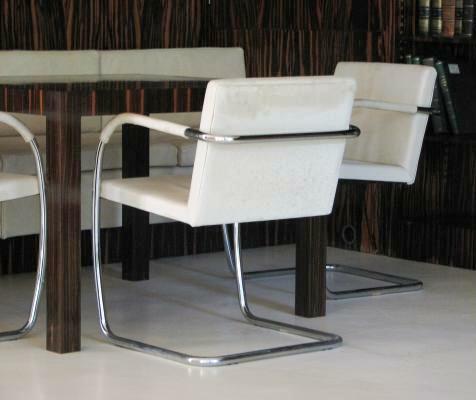 ‘Brno’ chairs made from tubular steel and upholstered in white sheepskin were situated around the round dining table from black polished pear wood. Chairs were placed next to the glazed milk wall and in the library. Two ‘MR 20’ wicker armchairs faced one another next to the writing desk behind the onyx wall. The majority of the metal furniture was produced in Germany (Berliner Metallwerke Josef Müller and Bamberg Metallwerkstätten). 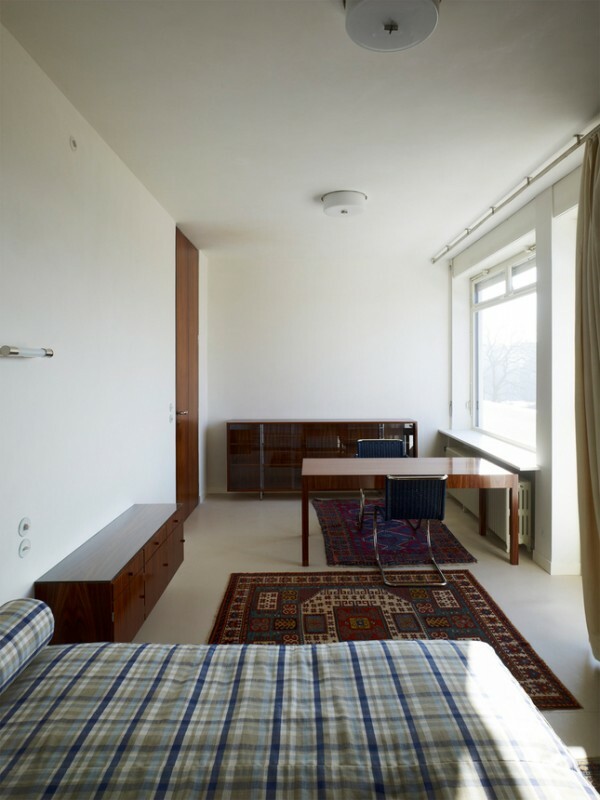 The built-in furniture and part of the free-standing items were produced in the Brno firm Standard Flat Company of the architect Jan Vaňek which at the same time realized part of the interiors of the Müller Villa in Prague by Adolf Loos. 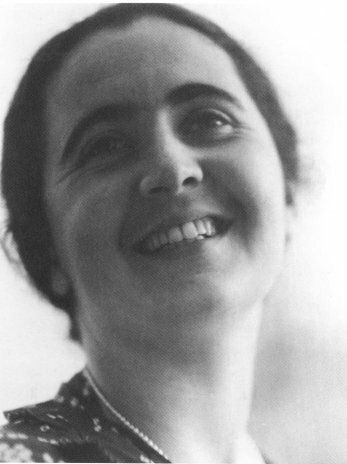 The architect and designer Lilly Reich contributed significantly to the conception and design of the interiors. 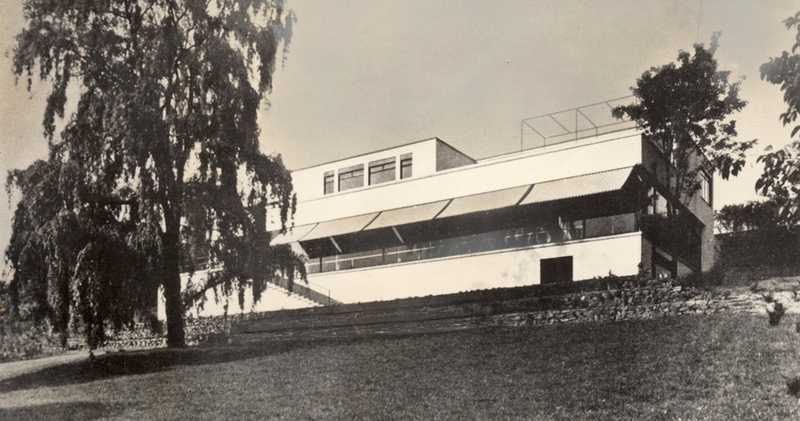 She cooperated with Mies on the exhibition for the German Werkbund ‘Housing’ at the Weissenhof housing estate in Stuttgart as well as on the exhibition of fashion and silk in Berlin in the year 1927. A turning point in their cooperation became the design for the World Exhibition in Barcelona in the year 1929. 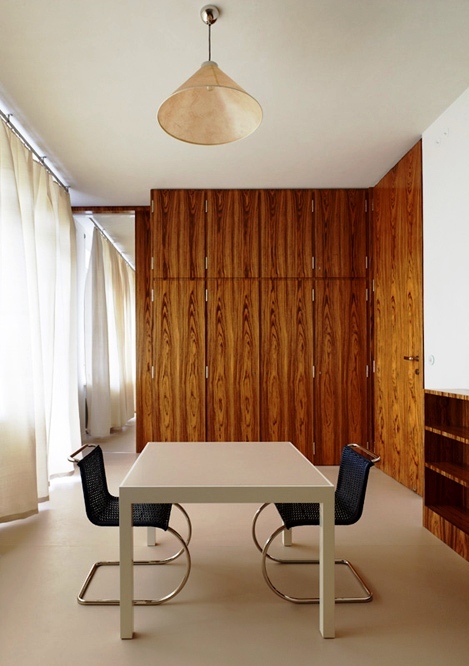 Reich created the furnishings of the flat for Mies’ house in Weissenhof where the floor surfaces were covered in linoleum in red, blue and white colours while the particular spaces were separated by light curtains which served to regulate the lighting of the interior. 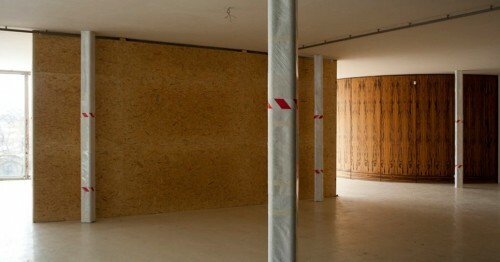 The principle of ‘flowing’ space from the exhibitions in Berlin and Barcelona was consequently applied in the Brno Villa. The selection of materials and the colour scheme of the textiles were fully supervised by Lilly Reich. 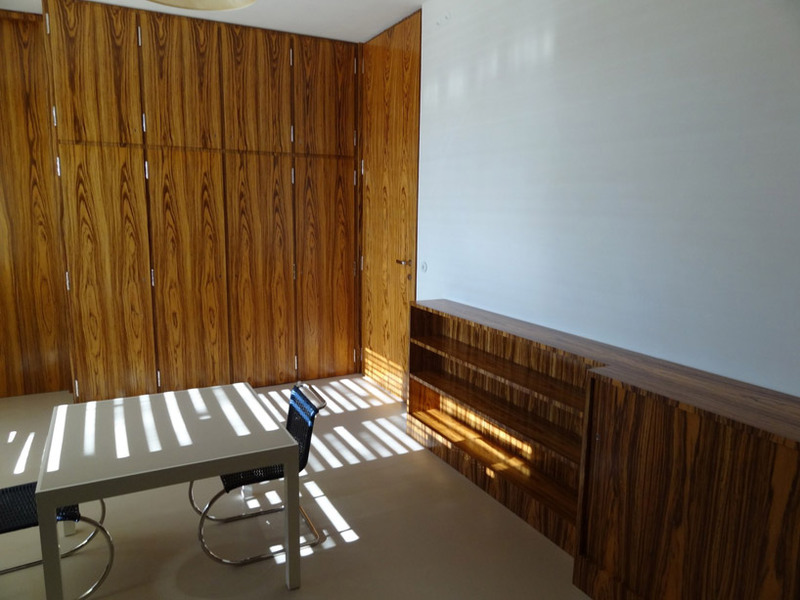 The authorship of the book shelf behind the writing desk in Fritz Tugendhat’s room has also been attributed to Lilly Reich, as a writing desk next to a window with a low bookshelf behind it was a typical interior composition a la Lilly. She was also apparently the author of the white cabinet with dark glazing in the main living area the construction of which reflects the principle of the steel structural system of the house. The creative contribution of Sergius Ruegenberg is less apparent. He produced a number of drawing designs for the house including for the interiors. 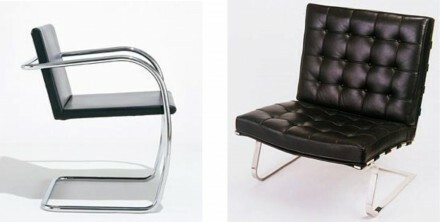 Mies entrusted him, for example, with developing a suitable armchair for the Barcelona pavilion, the model for which was Mies’ earlier designed stool. A range of Ruegenberg’s sketches have survived, in which one can observe, amongst other things, the shape of the ‘Tugendhat’ armchair. 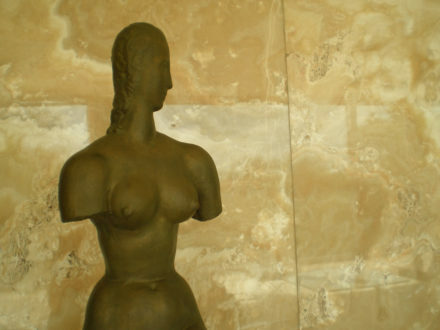 The only art work in the interior was the statue of a female torso by Wilhelm Lehmbruck from the year 1913. After consultation with Mies it was chosen instead of the originally planned statue by Aristid Maillol and soon became very popular with the Tugendhats. 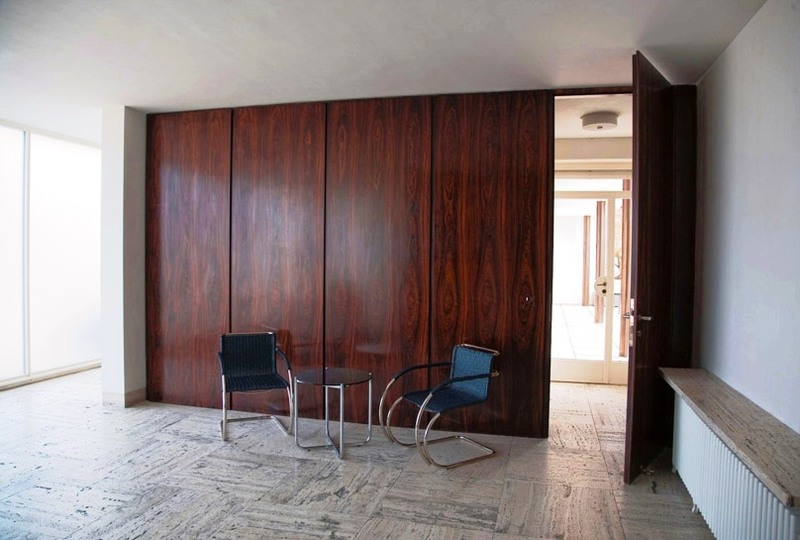 Furniture restoration in the Villa Tugendhat, originally designed by Mies van der Rohe, was aimed at restoring some of the remaining interior doors and reproduction of the original wooden built-in and freely positioned furniture, including metal furniture. Regarding restoration and manufacturing of wooden furniture, we have explored all available resources such as period photographs, project documentation in museums (such as MOMA), literature and contacts with the families of the original owner and architect. We also visited numerous buildings designed by Mies van der Rohe in Europe and the USA. From this comprehensive survey, we have prepared a rather extensive documentation which served as a basis for subsequent manufacturing. 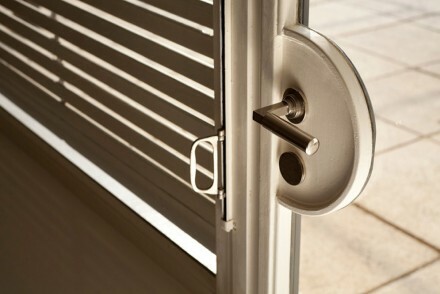 We had to make replicas of locks, hinges and parts for assembling of cupboards, tables or cabinets. 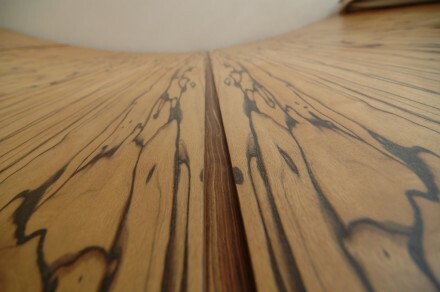 We used only original materials such as wood panels, plywood and veneers. We have never used contemporary standard sheet materials, but rather historical connecting materials, including bolts and screws. We have adjusted details to our latest knowledge until the very last moments. We have used such rare materials as 100% zinc plate, solid steel, chrome, flexible tubular steel, brass, hand-tanned leather, parchment, opaque glass, black glass, crystal glass, rubber and leather straps, green marble, a number of textile covers, many wooden materials as well as European and tropical veneers. As a final finish for maple, rosewood, pear, beech, oak, zebrawood and macassar veneers we used synthetic oil with alkyd resins, determined by research as the contemporary coating material. It was specially made for the renovation according to original recipes. For the upholstery of sofas, beds and other interior parts we used only original materials such as jute, horsehair, African grass and traditional metal springs. 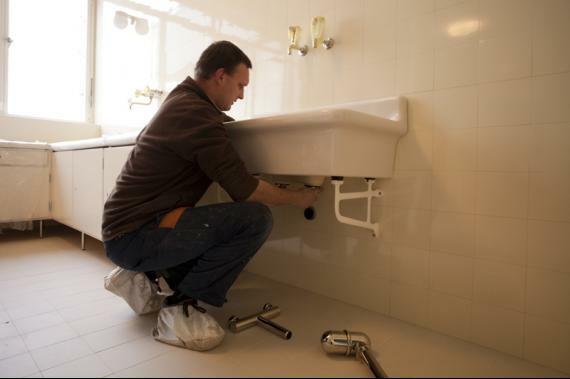 All special works were carried out either by qualified renovators or under their supervision. 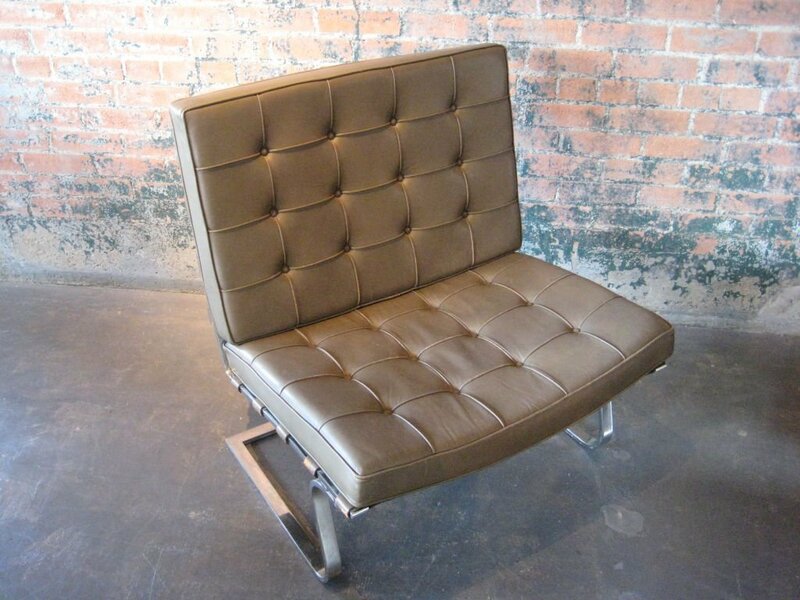 The upholstery was often made from materials that are either unusual or no more used. We also found out that the professions needed for the realization of the interior are no more available. It was necessary to equip the villa with metal replicas of the original furniture that had to be made individually. Returning of the round macassar dining wall to the villa turned out to be crucial. The wall disappeared from the building in 1940 and was considered to be completely lost. 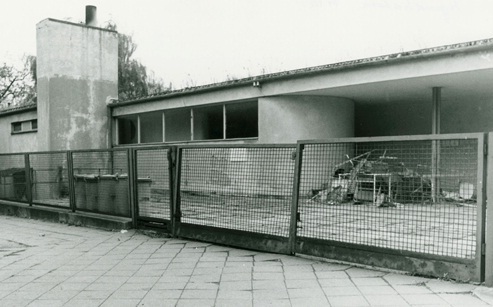 Art historian Miroslav Ambroz announced the discovery of the wall in a busy university canteen in Brno in 2010, where it served as a wall cladding for 70 years. 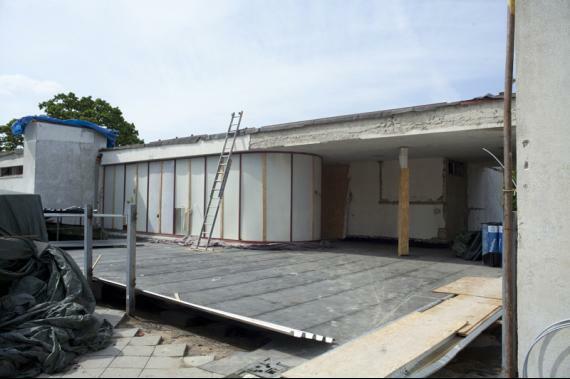 The panels were removed in 2011, restored, new sections were added and the wall was returned to the villa. This is one of the most interesting stories of the restoration. Thousands of people have watched the panels for years while nobody realized the context. 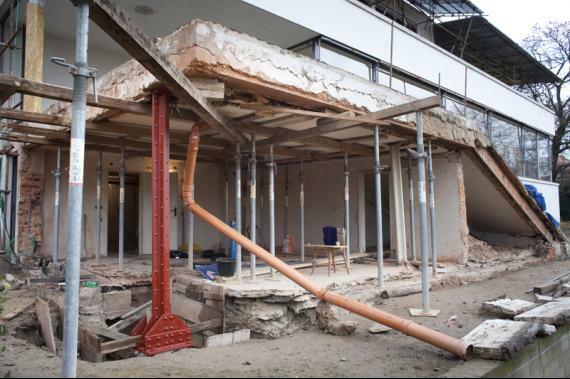 The returning of the wall to its original place was an emotional experience even for the Tugendhat family. Renovated metal furniture in the original 1930s versions is now placed in the villa. Such furniture is not available on the market anymore. 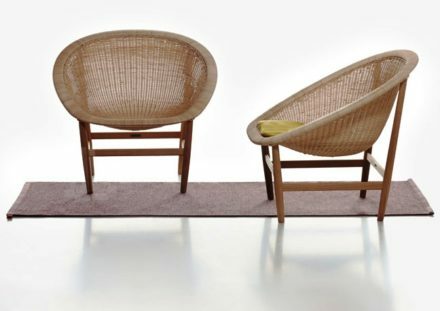 Given the fact that many chairs and tables were created in the year when the villa was built or designed specifically for the villa, many were prototypes modified for various reasons in the years before World War II. The reasons were usually structural and practical (lack of experience with new designs). The furniture had not been tested and it was thus impossible to determine its real-life properties and durability in advance. After World War II, the simplifications and modifications continued. Technological, material, dimensional and assembly modifications meant that many products changed substantially compared to their 1930 versions. 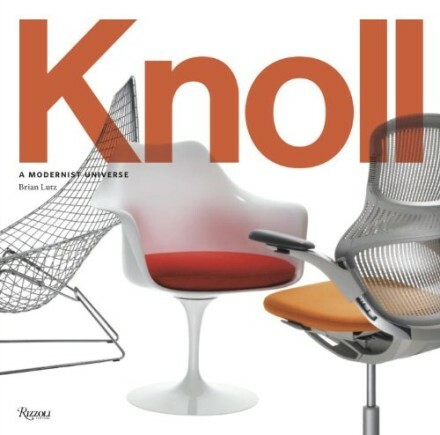 KNOLL USA began to produce the furniture in the 1950s and subsequent decades using completely new drawings supplied by the Mies van der Rohe studio and their own designs, using for example new, non-metric cross-sections for steel. New developments and changes are still taking place. 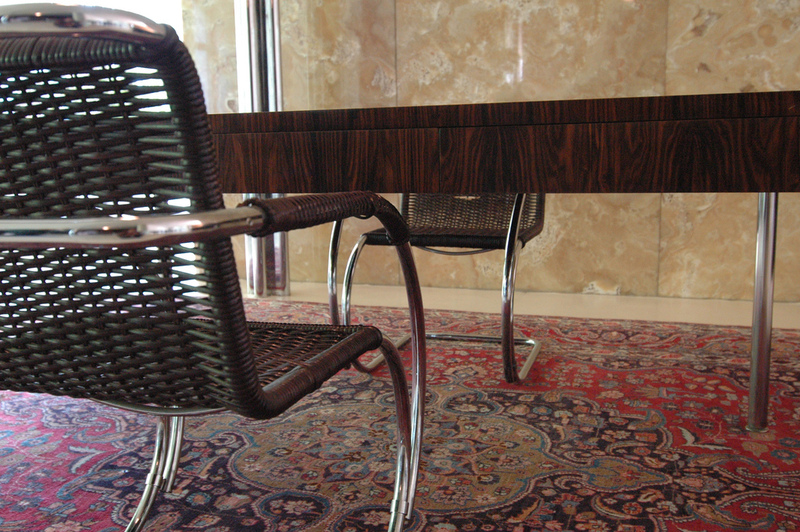 Some metal furniture in the villa was not even designed by Mies or he did not design it by himself. For example, the MR chairs were made, with the family and the co-author Lilly Reich´s consent, by TECTA, while the serving trolley was originally made by Thonet (discontinued a long time ago). The influence of the assistant designer Sergio Ruegenberg on the subsequent appearance of the furniture has not yet been significantly determined. 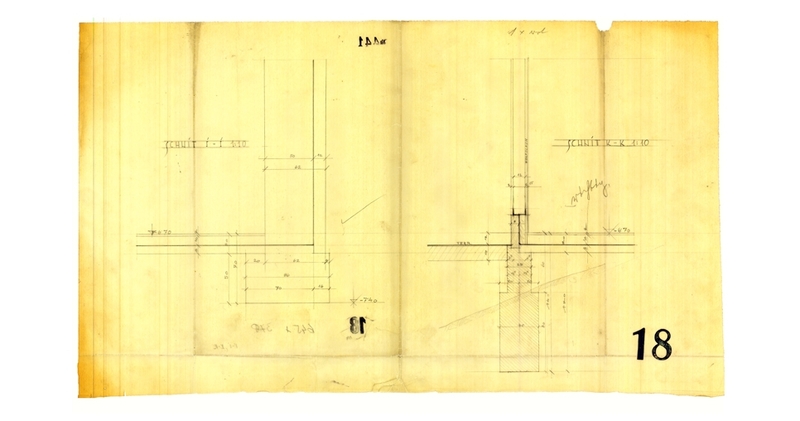 Entirely new manufacturing drawings for the existing original chairs were prepared for the villa restoration, with references to Mies’ original documentation, and the procedure was approved by the contracting authority, designers and THICOM. 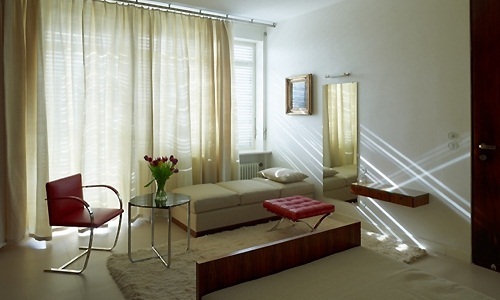 A significant part of the original metal furniture (Barcelona, ottoman, Brno flat chair, Dessau table, chaise lounge, table MR) is owned by the Brno Municipal Museum, the Tugendhat family and the Mies family. 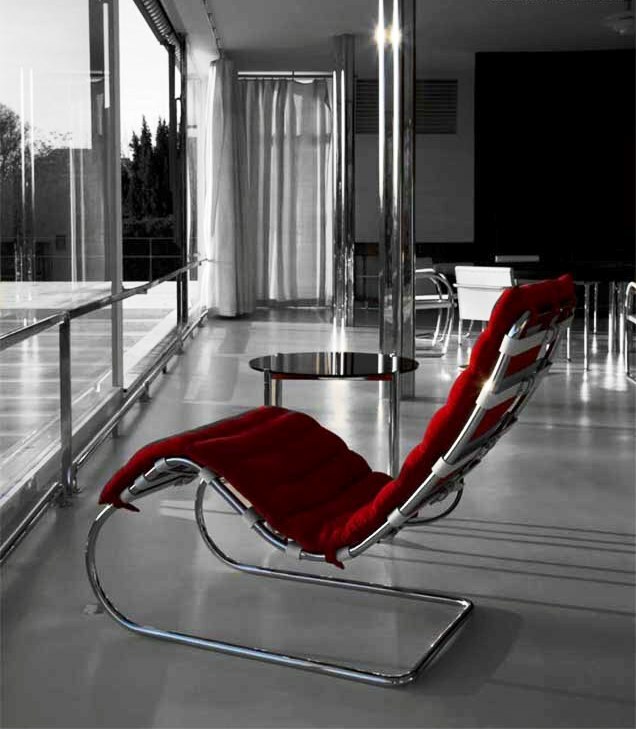 The Tugendhat chair (model number MR70) is a modernist cantilever chair designed by Ludwig Mies van der Rohe in 1929-1930 for the Tugendhat House in Brno, Czechoslovakia. In appearance, the Tugendhat chair is somewhat of a hybrid of Mies van der Rohe’s 1929 Barcelona chair and 1929-1930 Brno chair. 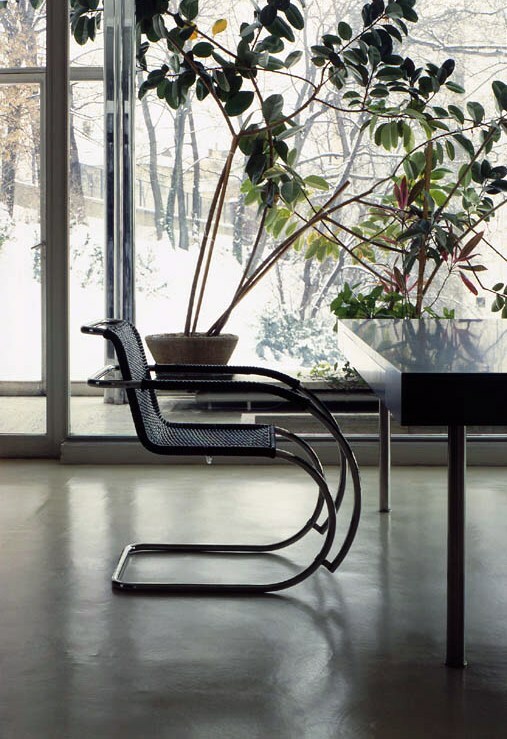 Like the Barcelona chair, the Tugendhat chair has a large padded leather seat and back, supported by leather straps mounted on a steel frame and legs. However, like one variant of the Brno chair, the frame is flat solid steel, formed under into a C-shape under the seat to create a cantilever. Versions exist with or without leather-padded steel arms. The metal was originally polished stainless steel; modern examples are often chrome-plated. 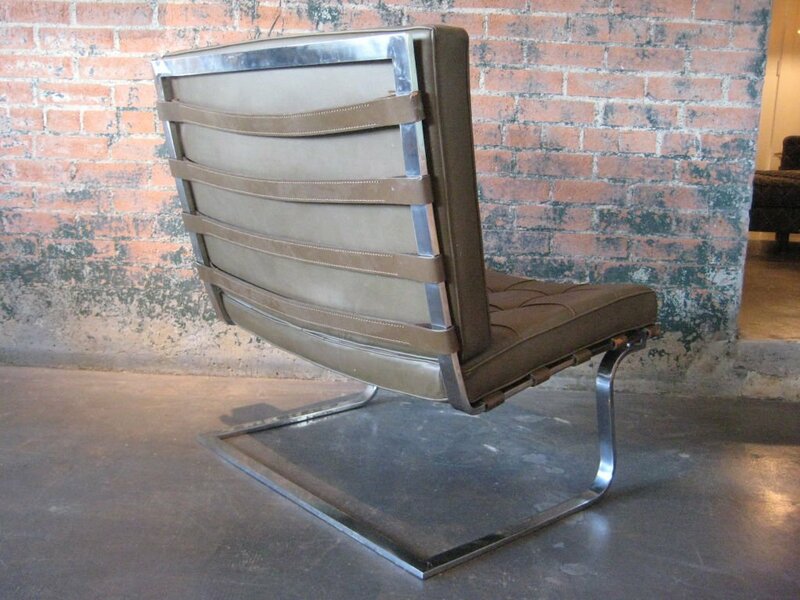 It was first produced by Josef Mueller Berliner Metallgewerbe and was later licensed to Knoll Inc. (USA) who produced a limited number of the chairs with and without arms from 1948. 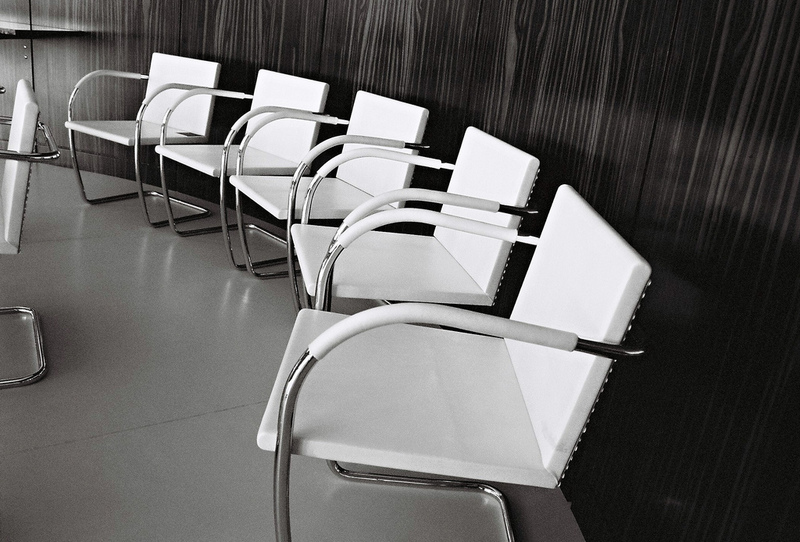 Gerry Griffith in Chicago created examples in the 1960s for use in the United Airlines Executive Office Building designed by Bruce Graham of Skidmore Owings and Merrill. The new museum replicas are clearly distinguishable from contemporary production. Existing pieces were studied in the USA, Germany, Austria and the Czech Republic – these were basically all existing or related pieces of furniture from the villa. The furniture was physically measured, drawn, original general drawings were traced and the furniture was X-rayed thoroughly. 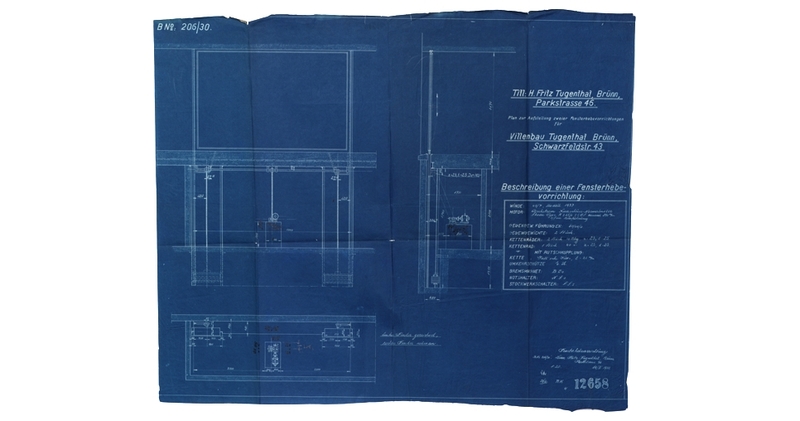 These were truly detailed 1:1 drawings, while the detailed research materials and unique comparative drawings compared the current and the original production of metal furniture. 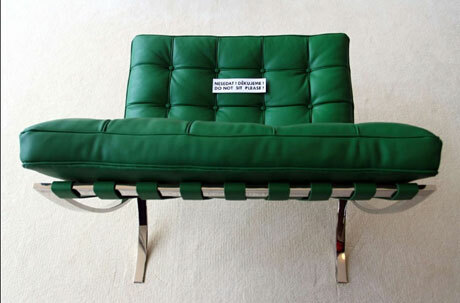 As a result, the furniture in the villa is not a poor copy of the contemporary furniture by Mies van der Rohe, but rather furniture in its original appearance, and we could even say, with a slight exaggeration, that these replicas are the only existing original furniture. 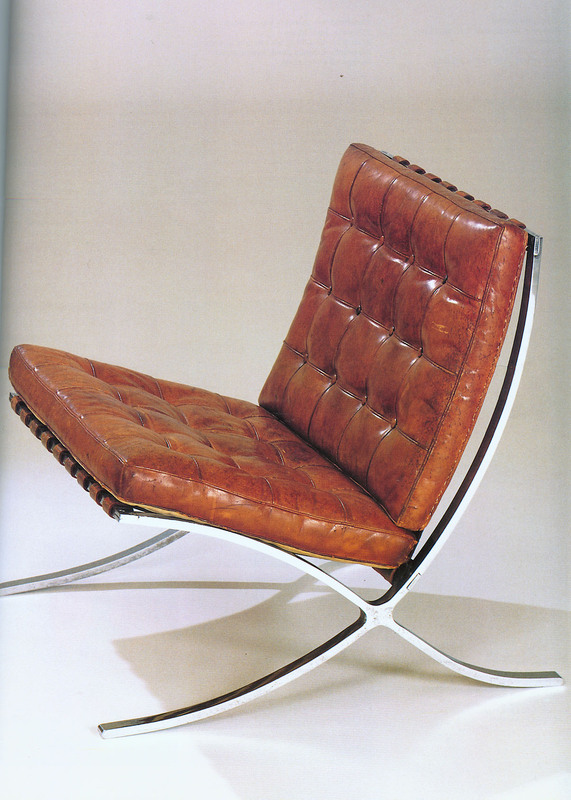 And like the Barcelona chair, many are museum replicas of chairs owned by the same entity that operates the Villa Tugendhat. He was the youngest of five children of the stonemason Michael Mies and his wife Amalie. He attended the general and Catholic cathedral school and industrial school in Aachen from 1892-1902. He trained as a bricklayer and worked as a sketcher. He left for Berlin in the year 1905 where he worked up until the year 1907 for Bruno Paul. 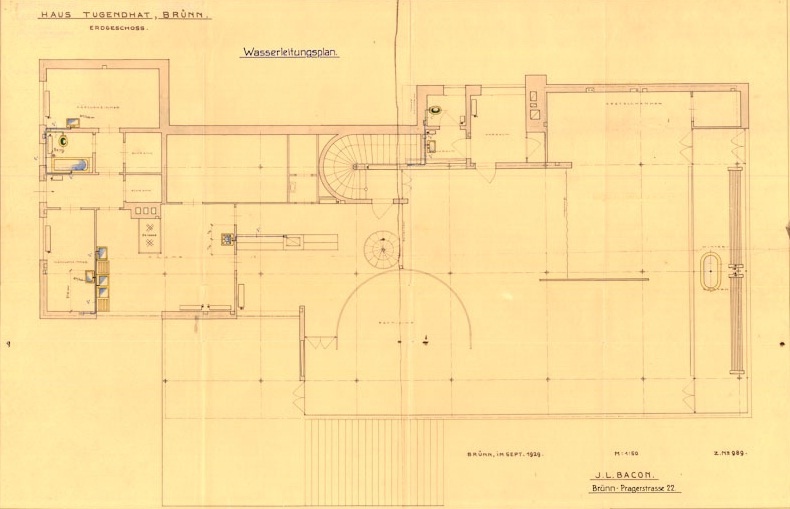 Here he prepared his first independent realized project for a house for Alois and Sophie Riehl in the villa colony of Neubabelsberg in Potsdam (1906-07). He worked for Peter Behrens over the years 1908-11 through whom he seemingly developed an interest in Schinkel’s Classicism. 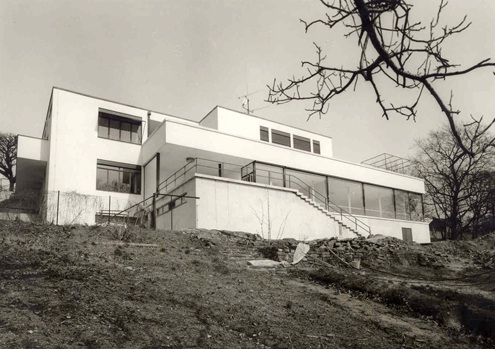 He designed a home in Berlin-Zehlendorf for the art collector Hugo Perls (1911-12; 1928 the addition of a gallery for the art historian and collector Eduard Fuchs). 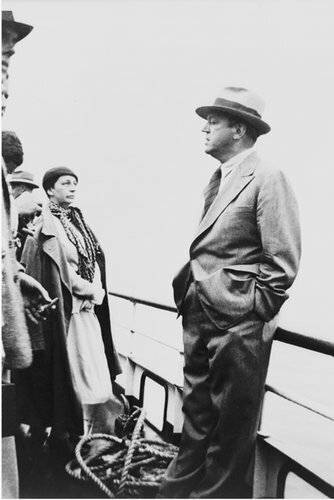 He married Ada Bruhn (1885-1951) with whom he had three daughters: Dorothea (1914, known under the name Georgia van der Rohe), Marianne (1915) and Waltraut (1917; that same year while in Romania where he served as a soldier Mies had a son born out of wedlock). 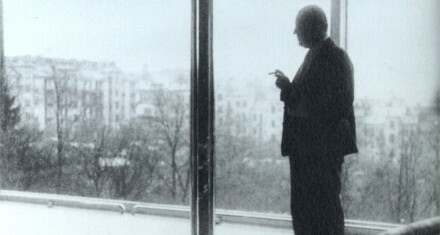 He left his wife Ada in the year 1921 who he never divorced and added his mother’s maiden name to Mies. Over the years 1921-24 he created fantastic projects for glazed skyscrapers with constructions based on the principle of “skin and bones”. 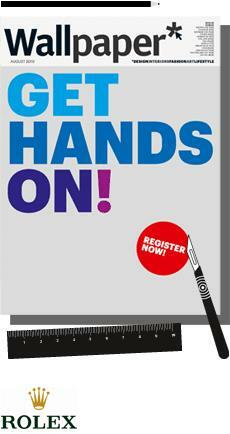 He became a member of November Gruppe and co-founder of the association of architects Der Ring. Over the years 1925-27 he realized apartment blocks in Berlin-Wedding, significantly making use of modern principles of function and hygiene. 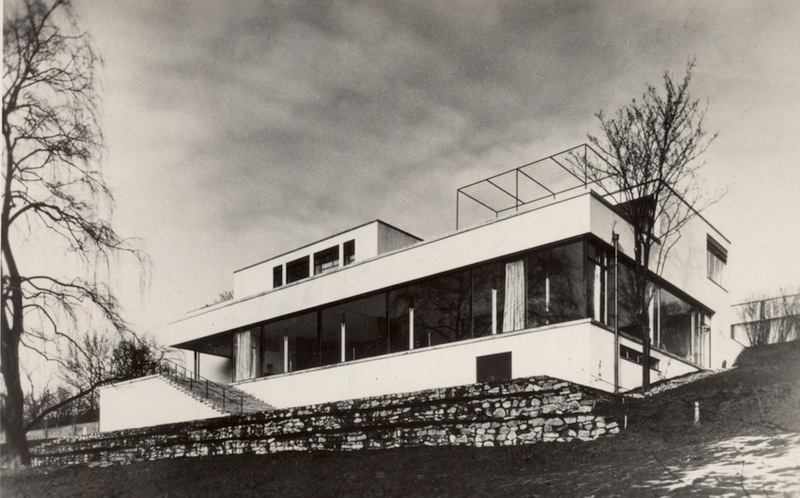 Mies’ working and life partnership with Lilly Reich (1885-1947) became an important turning point in his life, working together on the exhibition of the German Werkbund “The Dwelling” carried out in the form of the housing estate Weissenhof in Stuttgart (1927). 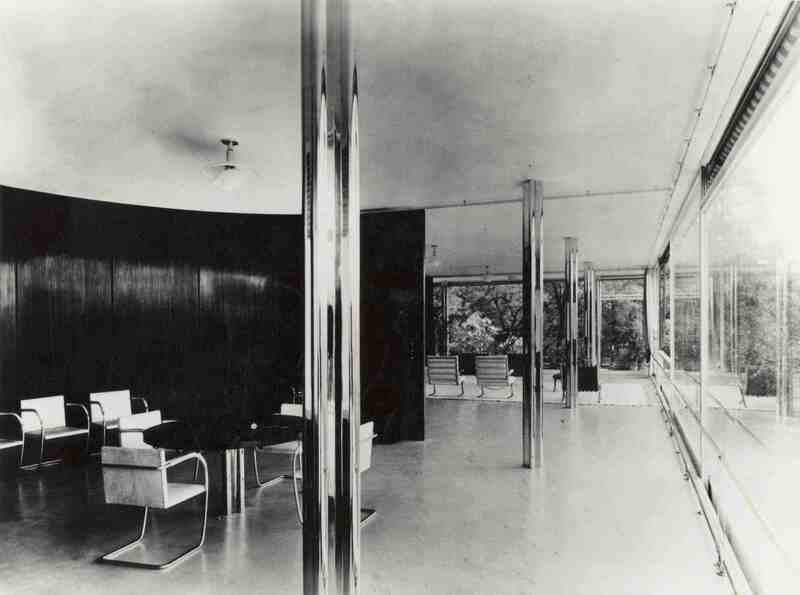 Here and once again at the Berlin fashion exhibition (1927), the central theme of which was silk, Mies and Reich presented their concept of “flowing” or “unrestricted” space which was further developed in the Barcelona pavilion (1928-29) and in the Brno Villa (1928-30). They also both cooperated on the projects for the “brick” houses for Erich Wolf in Guben (1925-27) and Hermann Lange and Josef Esters in Krefeld (1927-30). 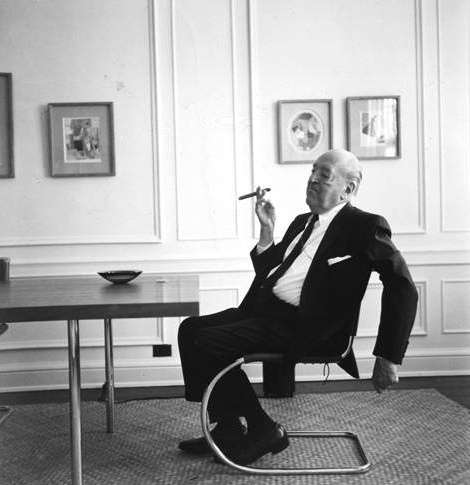 Mies was the final director of the Bauhaus over the years 1930-33. 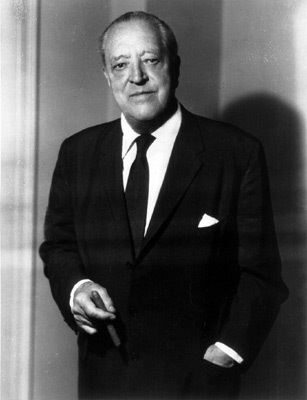 Mies van der Rohe, whose work did not meet Hitler’s taste for monumental architecture, also fled the Nazis, purportedly using his brother’s passport to get out of Germany. He left for the USA in the year 1938 where he took up the directorship of the the Illinois Institute of Technology (IIT) in Chicago where he also established his own office. In the year 1940 he met Lora Marx, his companion during his American years and obtained American citizenship in 1944. 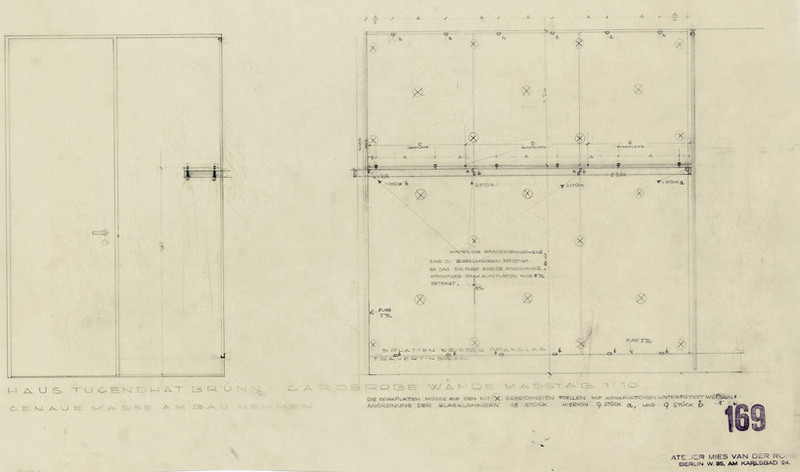 Mies worked on the plans for the university grounds for IIT over the years 1939-58. He designed his most radical domestic design for Edith Farnsworth in the form of a glass pavilion (1945-51). He realized the high-rise Lake Shore Drive Apartments in Chicago (1948-51) and the administration skyscraper Seagram Building in New York (1954-58). Mies designed the New National Gallery in Berlin back in his native Germany (1962-68). 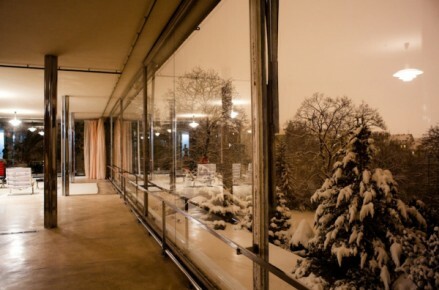 At the beginning of the year 1969 Mies’ Chicago office promised to assist in the restoration of Tugendhat Villa initiated by the Brno architect František Kalivoda and Grete Tugendhat. 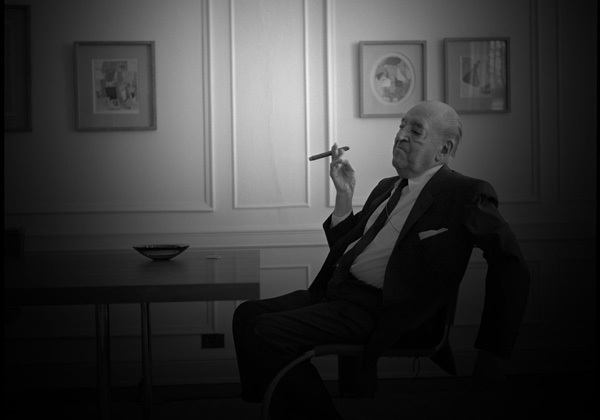 Ludwig Mies van der Rohe passed away, however, on the 17th of August 1969 in Chicago. 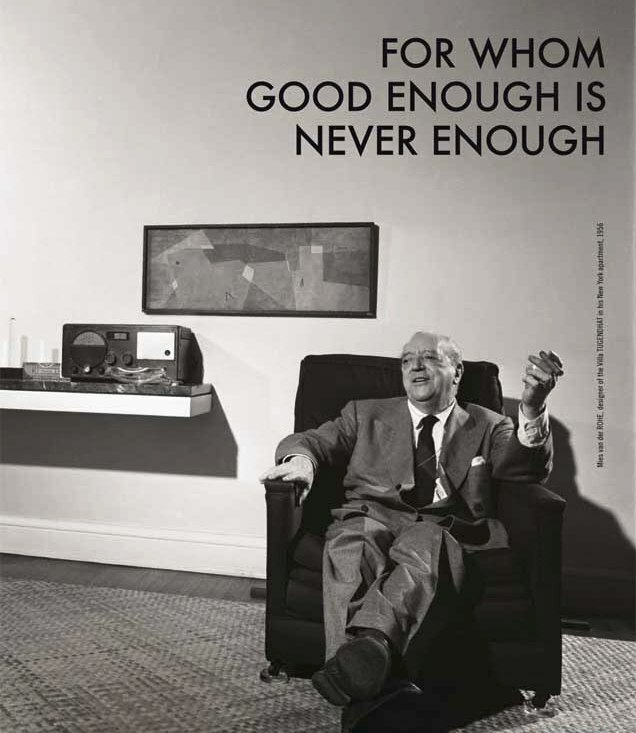 Mies’ statement “less is more” is characterised by his pure forms and work with material. Glass, steel and concrete are the attributes of his distinct “International Style” which has influenced architecture up to the present day. Fritz Tugendhat (1895-1958) and his wife Grete, maiden name Löw-Beer (1903-1970) both came from Jewish German families of industrialists and traders who had lived in Brno for several generations. The Löw-Beers had settled in Moravia starting in the 17th century and contributed significantly to the industrialization of Czechoslovakia during the between-the-wars period. They owned and operated a range of textile factories, sugar refineries and cement works within the territory of the former Austria-Hungary Monarchy. The factories for woollen fabrics in Brno and nearby Svitávka, where the Löw-Beers had two family villas (the so-called, Small Villa was built at the instigation of Grete’s father Alfred Löw-Beer according to a project by Josef Nebehostený in the year 1906) ranked among the most significant of these. Grete Löw-Beer married the industrialist Hans Weiss in the year 1922 after interrupting her studies of economics in Vienna. Grete spent the majority of her less than happy marriage, which fell apart after six years, in Germany. The Tugendhats did not have their own companies but were the co-owners of the Brno wool factories Feldhendler et Co. and Max Kohn. They were mainly involved in trade with cloth. 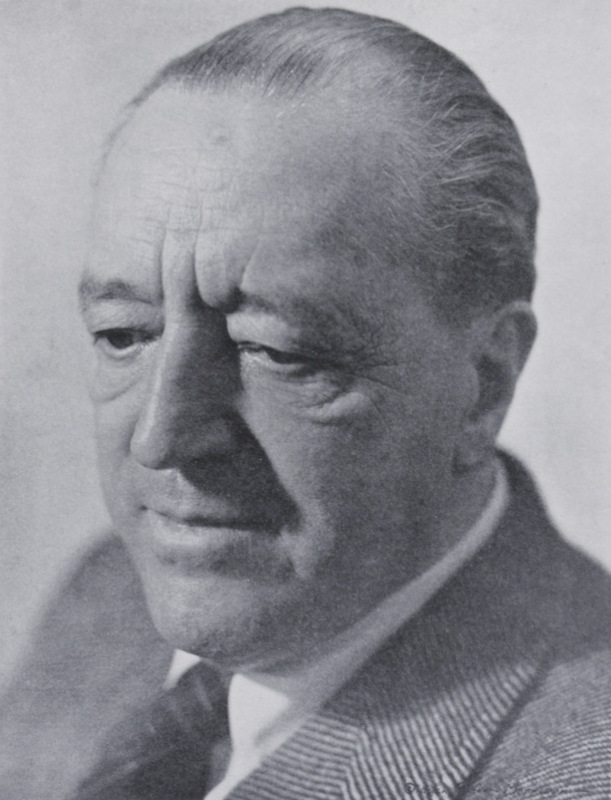 Fritz Tugendhat originally wanted to study medicine. He was more interested in the technical side of textile production and the designing of quality fabrics having found himself not particularly successful as a businessman. Soon after her divorce Grete remarried Fritz Tugendhat who she had known practically from childhood. 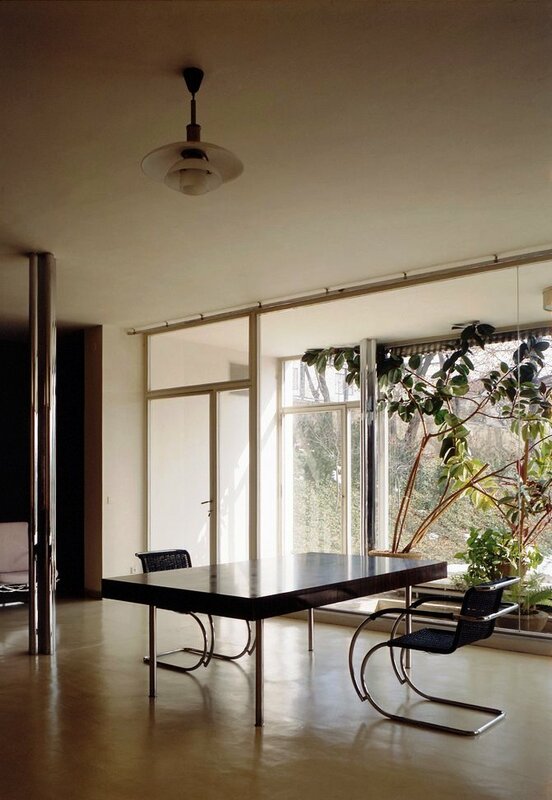 Both of them decided to settle permanently in Brno and prior to their engagement commissioned a project for a family house from Ludwig Mies van der Rohe. Contact with the architect had apparently been provided by Eduard Fuchs or Mies’ colleague Lilly Reich who would frequent the company in Fuchs’ house. Mies arrived in Brno in September 1928 and was impressed by the exclusive plot of land which provided a marvellous view of the historical panorama of Brno, finally accepting the commission. Surprised by the high level of Brno architecture and construction work he did not hesitate to entrust the realization into the hands of a local construction company. The locality in the Brno residential neighbourhood of Černá Pole was given ahead of time as the property was part of Grete’s parents’, so-called Löw-Beer, Villa. 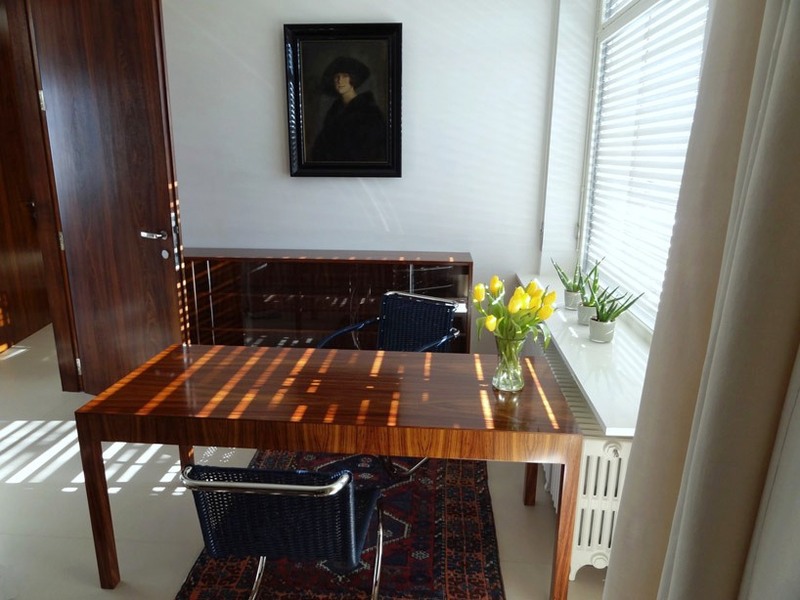 Her father gave the plot to Grete in March 1929 and also financed the construction of the new house. 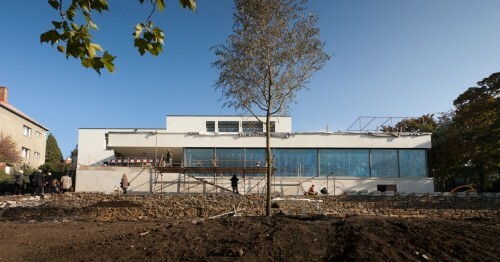 In April 1929 Grete Tugendhat officially requested building permission which was granted in October of that same year. The construction company of Artur and Mořic Eisler began with the construction of the house in the summer of the year 1929 and completed it in fourteen months. After completion of the interior, the family could move into the house in December 1930. The Tugendhats lived in the house with their three children, Hana (Grete’s daughter from her first marriage), Ernst and Herbert up until May 1938. They left for Switzerland in order to escape the threat of the outbreak of the War and in January 1941 consequently to Venezuela where their daughters Ruth and Marie-Daniela were born in Caracas. 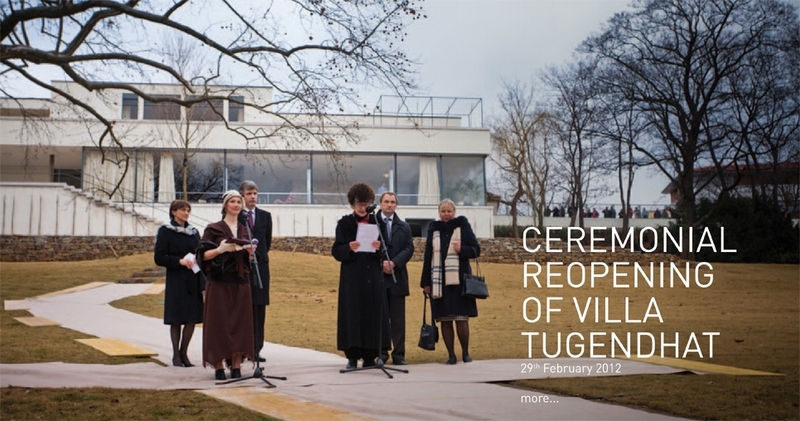 Grete Tugendhat gave a speech in Brno in the year 1969 regarding the circumstances and course of construction of the villa. 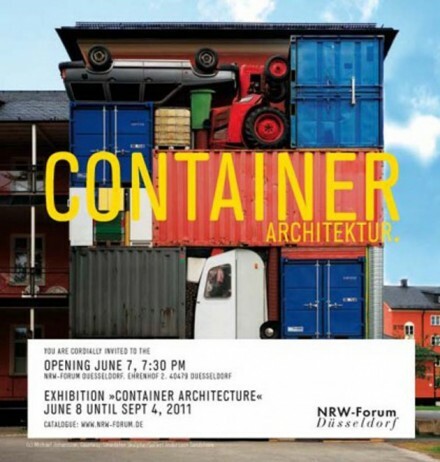 This talk is a unique source of information about the house for art historians and architecture theoreticians. It was additionally a moving personal communication for art lovers by the woman who had made possible, perhaps unknowingly, the emergence of a work of art which she completely identified with and which became the embodiment of her views of freedom. Modern Brno began to come about starting in the 1830s when the fortifications were gradually torn down. The city rapidly grew with new construction activity, primarily connected with the building of the local ‘Ringstrasse’, lending Brno the typical features of a city of the 19th century Vienna type. The urban development of the Moravian capital, known as the Austrian Manchester primarily thanks to its textile industry, began to move outside of the centre, creating both working-class suburbs as well as residential quarters. At the turn of the 19th and 20th centuries Brno began to change into a modern city. Extensive redevelopment to the historical core occurred and late Historicism and the Art Nouveau of the Austrian and German provenance became the architectural expression of the new structures. Along with construction of the Brno ‘Ringstrasse’ the urban planning of Černá Pole (Black Field) began. 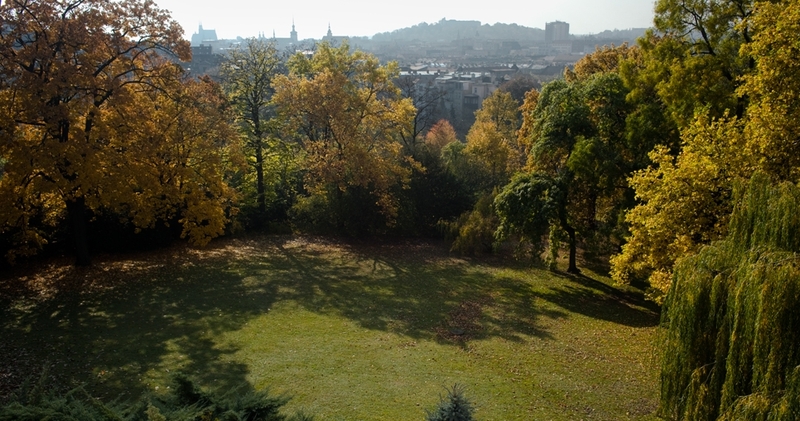 The first villa colony in Brno was established here here on parcels of vineyard land above Lužánky Park in the year 1860. 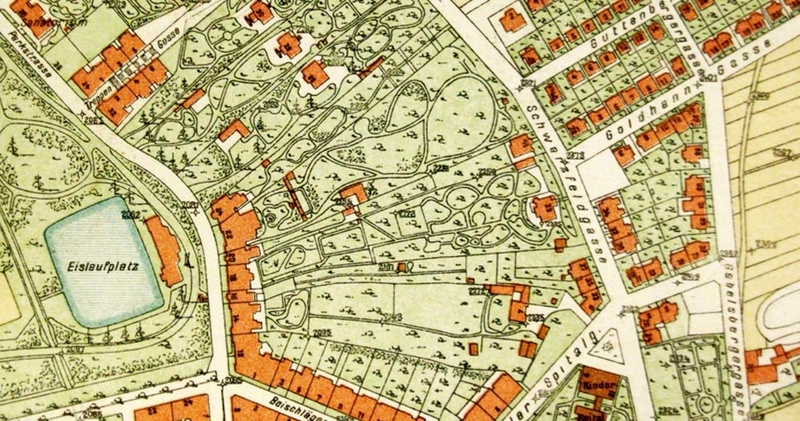 The area between the streets Drobného (originally Hutterova-Huttergasse later Sadová – Parkstrasse) and Černopolní (Schwarzfeldgasse) was part of Lužánky Park up to the second half of the 19th century with the public greenery here freely overlapping the private gardens. The first villa in this locality was designed by the Brno builder Josef Arnold, in all probability according to urban planning by Heinrich Ferstel, one of the main architects of the Vienna Ringstrasse. 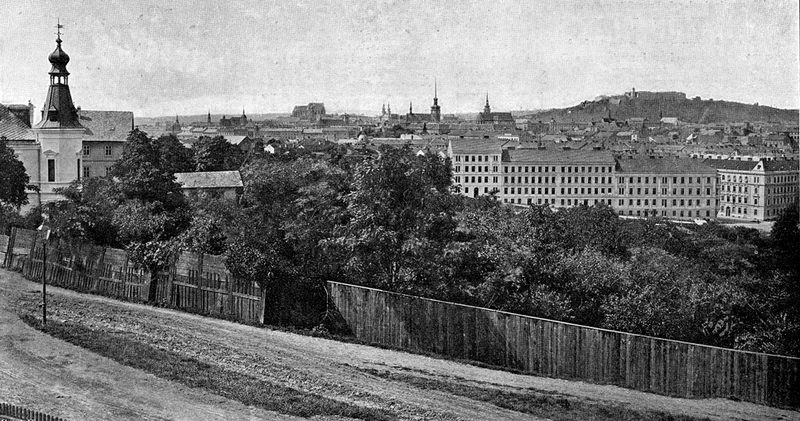 At the beginning of the 20th century the construction development of this land was supplemented by tenement buildings on Antonína Slavíka and Helfertova streets and the monumental composition of Schodová street. Černá Pole became one of the most sought out Brno residential neighbourhoods during the period prior to World War I and consequently up to the end of the 1930s thanks to the supply of both individual and cooperative family housing. The oldest, the Kaiser Villa, was built in the year 1860 at Černopolní street while the second came about, the builder Josef Arnold’s own villa, in the year 1862 along with at practically the same time, the neighbouring villa for the Brno lawyer Karel Giskra. The final of the three homes ‘hidden’ in the depths of the gardens was, the now demolished, Adamčik Villa. The placement of these structures is clearly apparent on old maps of Brno. Cecílie Hože, the sister of Grete’s father Alfred Löw-Beer became the owner of the Arnold Villa in the year 1909. She was married to Kornelia Hože a well-known Brno lawyer and co-owner of the cement works in nearby Maloměřice. 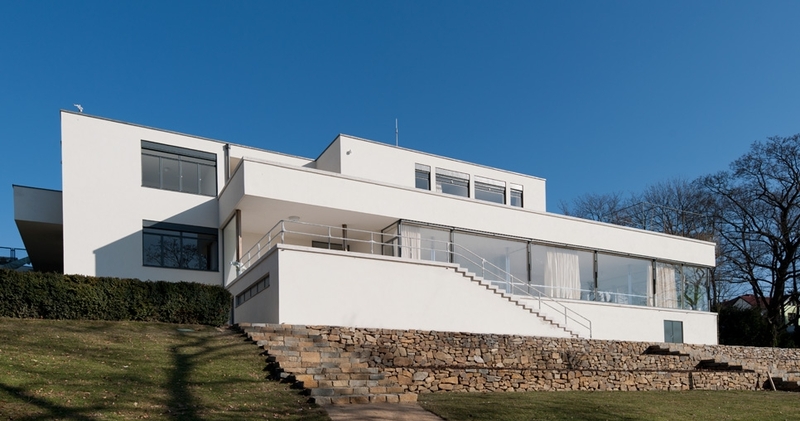 The house with its extensive land which can be seen from the living space of Villa Tugendhat, was renovated in the Art Deco style with elements of the Art Nouveau by Grete’s aunt over the years 1909-1915. 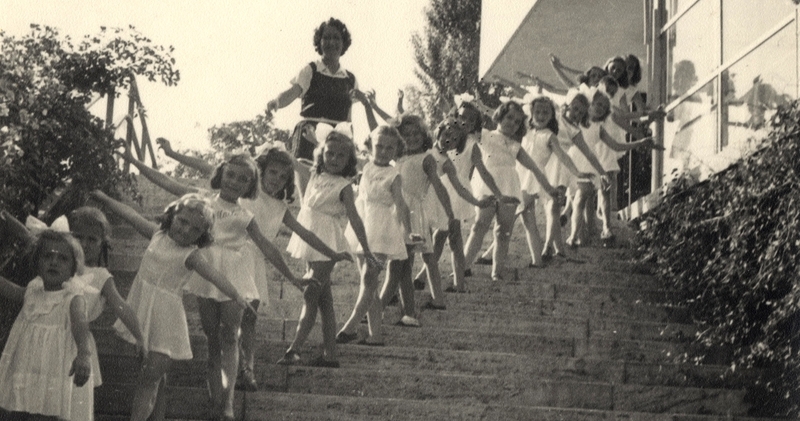 In October 1939 the property was confiscated by the Gestapo, only to be nationalized by the state, serving as a kindergarten from the year 1952 (at present the land is the property of the city of Brno). 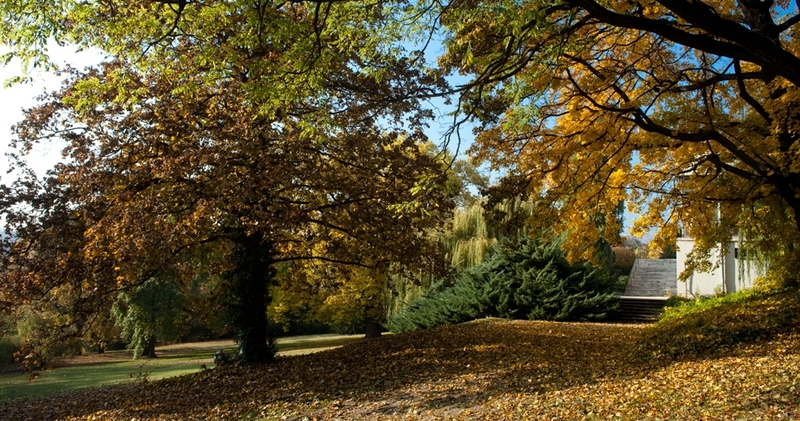 Members of both the Löw-Beer and Tugendhat families began to settle on more property in the immediate surroundings starting from the beginning of the 1920s and contributed to a significant extent to the ‘cultivation’ of this part of the city. Grete’s father, Alfred Löw-Beer, purchased an Art Nouveau villa on a practically neighbouring plot of land on Drobného street 22 in the year 1913 built over the years 1903-1904 by the Brno textile industrialist Moritz Fuhrmann. The author of the building was in all probability the Viennese architect Alexandr von Neumann. The house included extensive land with a vineyard and garden which expanded and led all the way up to Černopolní street. 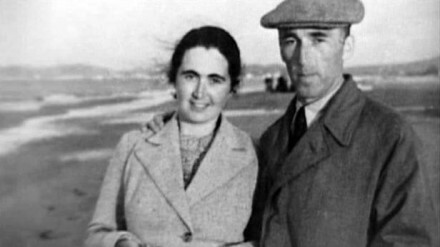 After Grete’s marriage to Fritz Tugendhat, she received the upper part of the plot of land from her father as a gift for the construction of a house for her family. The Löw-Beer Villa, which Grete grew up in, was also confiscated by the Gestapo in October 1939 and later transferred to the property of the state. 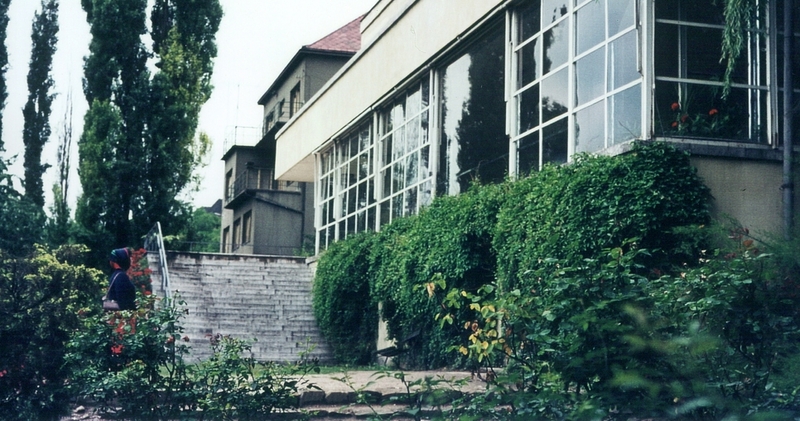 It served as a boarding facility starting in the 1960s (at present the property belongs to the South Moravian Region). 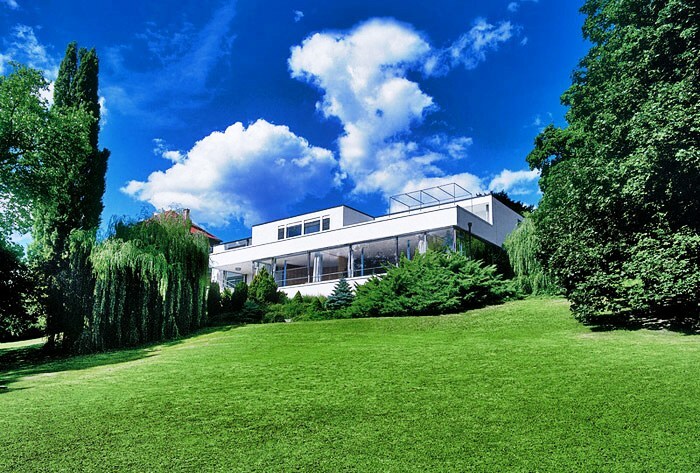 There are plans to once again unite both houses along with the land into one whole with Villa Tugendhat as an installed monument to Modern architecture and the Löw-Beer Villa as a living centre for Modern architecture. Apart from Mies’ personality and his original conception of space, the Tugendhats were also particularly impressed by his feeling for material. 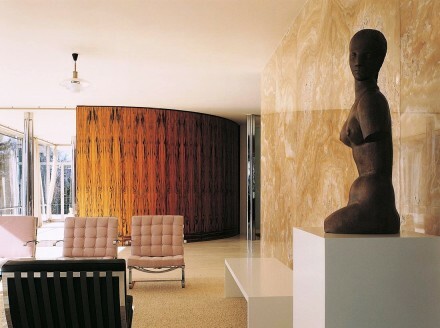 They consequently visited three of his realizations from recent years along with Mies. Not only due to his architectural vision, but also in light of the placement of the building on a slope, Mies finally elected the supporting structure of a steel skeleton with backing masonry. The delicate supporting columns of a cross-section with riveted angles are from German steel. 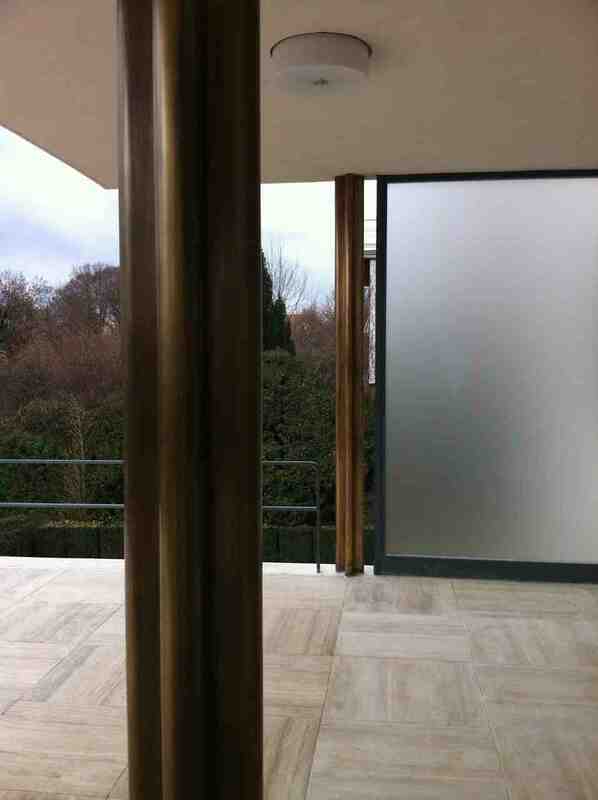 The columns on the terraces have brass cladding with patina coating to a bronze in copper colour, the columns in the main living area have brass chromium plating with a bright lustre. All of the window frames and a number of the doors are made from steel. All of the plastering was carried out in the natural colour tone of sand (they did not have a white coating). The internal plaster had a velvet lustre thanks to the final layer (stucco lustro). The Italian almost white travertine (Tivoli locality) ranks among the original stone elements. 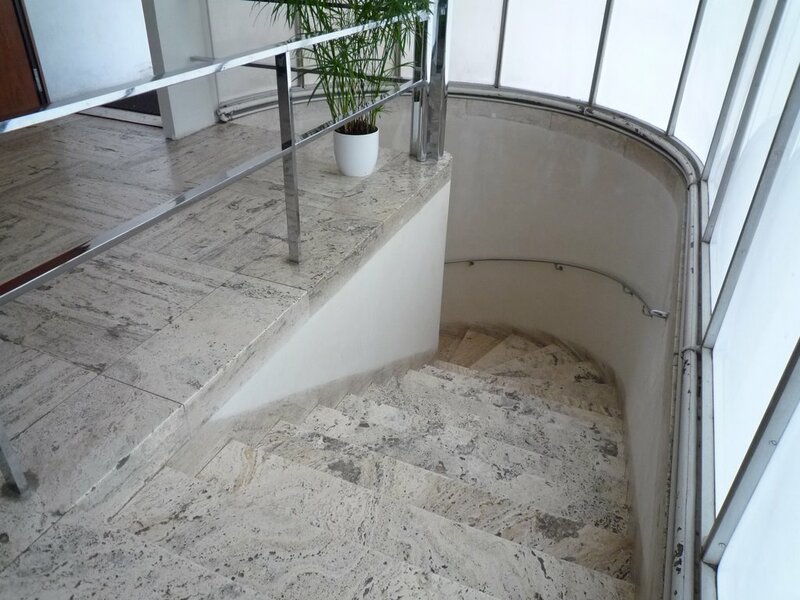 This was employed in the interiors on, for example, the floors of the entrance hall and the staircases, and in the exteriors on the parapet and the bases of the upper terrace and the garden terrace with the stairs (this was replaced during the restoration of the Villa over the years 1981-85 with Spiš travertine from Slovakia). The so-called onyx wall is a truly remarkable decorative and at the same time functional stone element in the interior of the Villa. The honey-coloured, yellow rock with white veins was mined from the Atlas Mountains in former French Morocco in North Africa and is actually aragonite sediment (calcium carbonate). The exclusive exotic woods came from south-east Asia. 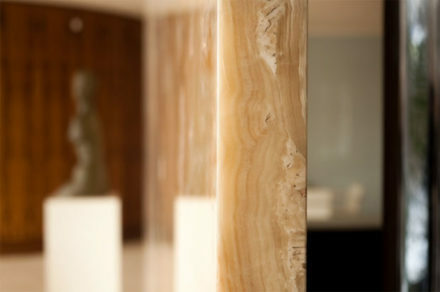 The wall cladding in the entrance hall, doors and built-in closets in the parent’s rooms were from veneered palisander. The children’s rooms made use of zebra veneer. 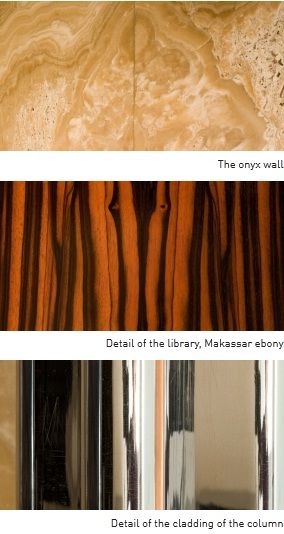 The main living area contained the impressive ebony veneer from the region of Makassar on the island of Celebes. 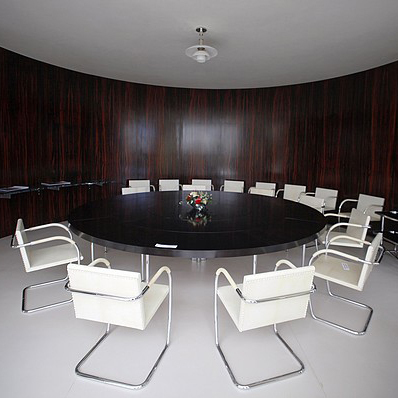 The dark brown and yellow veined ebony wood for the half-cylinder in the dining room and for the built-in library (preserved up until the present in its original state) was apparently chosen by Mies in Paris where he found sufficiently long veneer which would reach from the floor all the way to the ceiling. 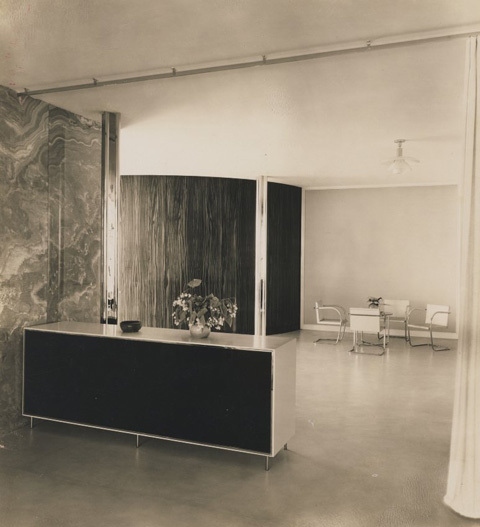 The half-cylinder wall divided the space of the dining room and was destroyed in the year 1940 and over the years 1981-85 and replaced by a new construction of zebra veneer. The working desk and the table in the main living area as well as additional pieces of furniture were also made of Makassar ebony. 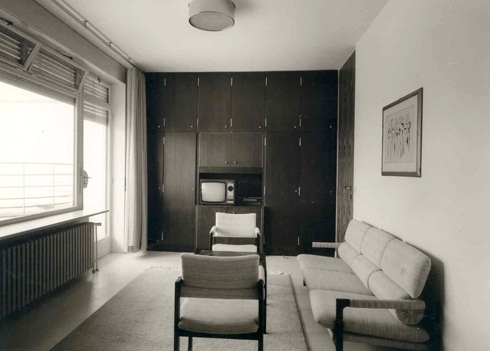 White DLW linoleum (Deutsche Linoleum-Werke) was laid on the floors in the main living area and in the bedrooms. 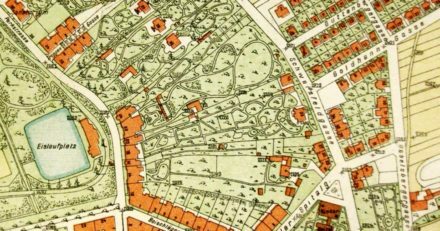 The plot of land was part of the property adjoining the Art Nouveau villa of Grete’s parents and had the form of an English park from the 19th century. The garden of Villa Tugendhat along with the lower garden of the Löw-Beer Villa had always formed a territorial although not an architectural whole. 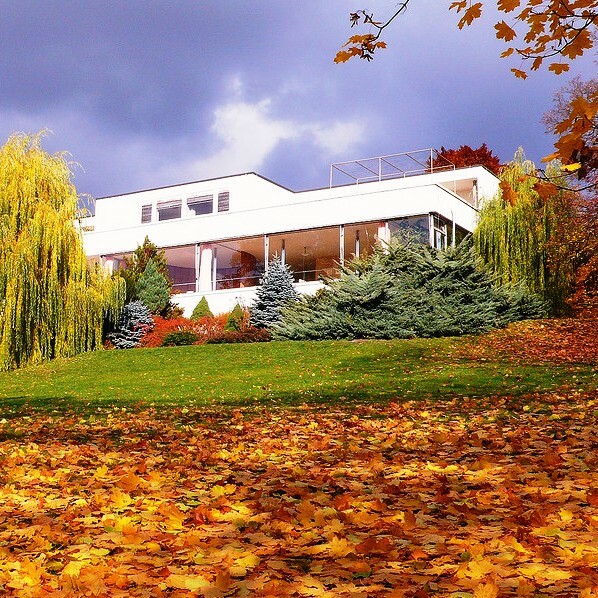 The existing paths, a circular trail linking up both villas and a number of woody plants, primarily an overgrown weeping willow were incorporated by Mies van der Rohe into the project for the house. The placement and incorporation were designed in connection with the natural framework and in relation to the particular views outward and through to the historical centre of Brno. The façade of the house contained climbing greenery evoking “the optical disappearance” of the mass of the building in plant life, this being further enhanced by the ideal linking of the interior and the exterior. 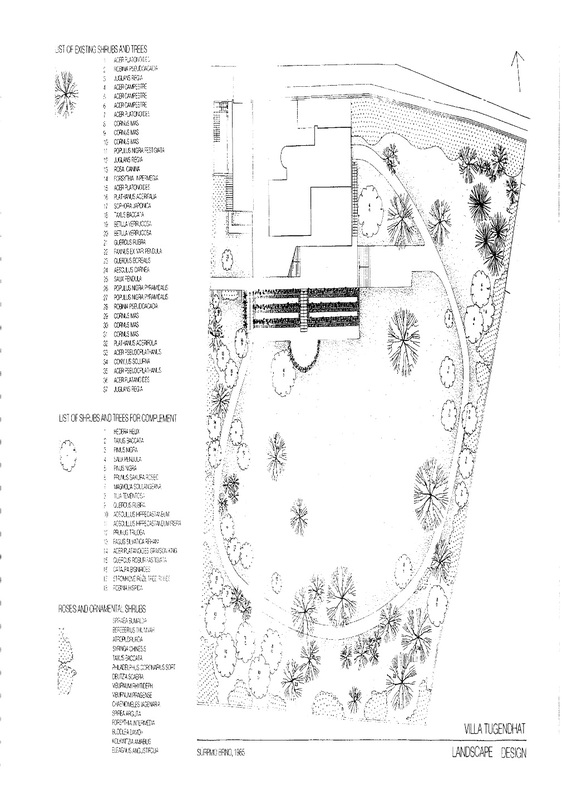 The actual arrangement of the garden with compositional connections with the main living area was most obviously apparent in the continuity of space of the dining area with the elongated half-circular terrace under the weeping window. The dry dwarf wall from variously placed stones planted with perennials created the optical base for the house having been designated for the view of the house from the lower part of the garden. The roses planted in front of the garden façades, evident in family photographs, were not part of the architectural conception. Grete loved them, however, despite the fact that they suffered from excessive sunlight and quickly faded. She would often make mention of the beauty of the blooming roses in the large spaces or strips around the home in later interviews. Plants were placed in pots at the entrance parts from Černopolní street as well as from the garden terrace. The close connection between the house and the vegetation culminated in the interior of the winter garden adjoining the main living area. The winter garden contained a rectangular pond with water plants and greenery in pots. 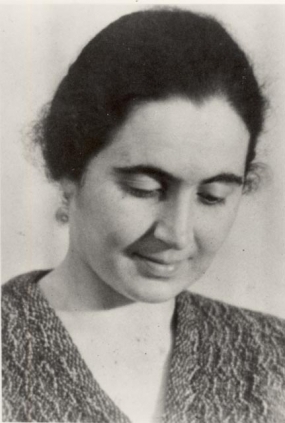 The Brno garden architect Markéta Roderová-Müllerová (1898-1981) contributed significantly to the garden concept, having made Mies’ acquaintance apparently as a result of the realization work by the construction company of the Eisler brothers. Mies was undoubtedly impressed by her having graduated from the gardening school in Lednice na Moravě, her distance studies at the prestigious gardening college in Berlin-Dahlem and finally her German heritage. The layout of the garden was designed under his supervision in the spirit of the so-called “emphasised emptiness” where the main motif consisted of the large grassed spaces with isolated vegetation. 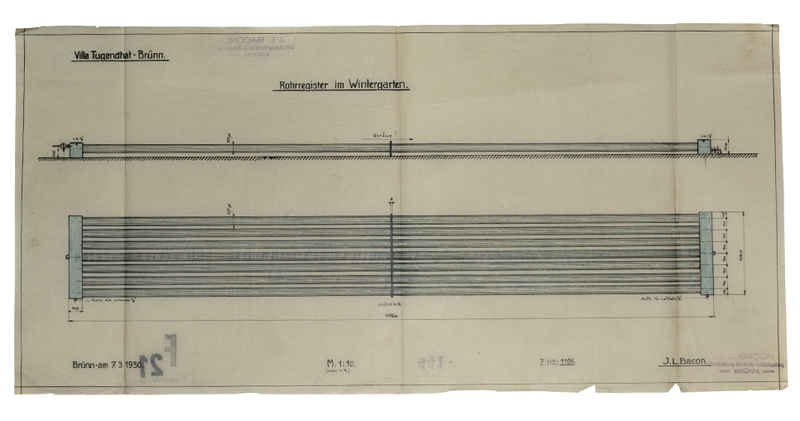 Perspective sketches of the garden and the upper terrace were carried out by Sergio Ruegenberg (1903-1996) who also related that the hemi-cycle bench on the upper terrace came about after a visit to Charlottenhof Palace by Ludwig Mies van der Rohe and Lilly Reich. The guiding principle behind the restoration was to return the house to the state when the Tugendhats lived there. To achieve this end, materials were used which were available at the time of construction. 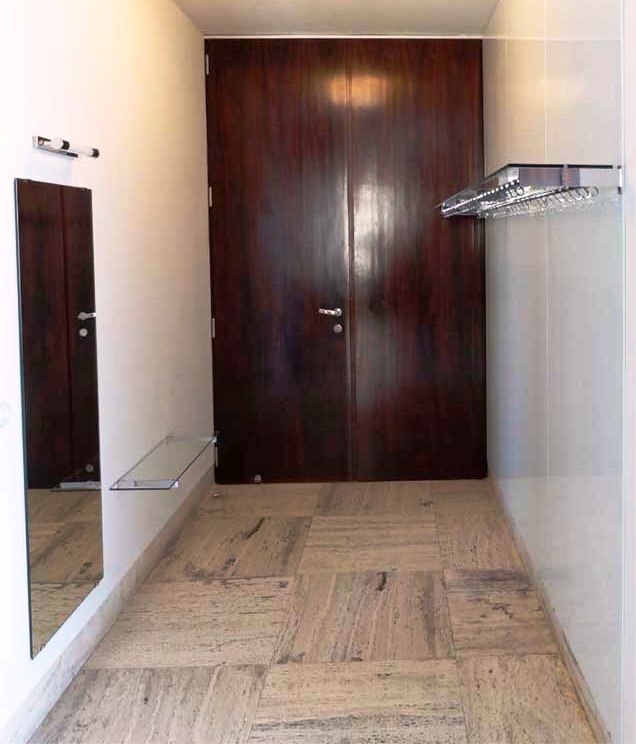 For example, the linoleum tiles on the floor and walls in the wet areas were made by the same formulas used by Deutsche Linoleum Werke, the company which produced the original tiles. 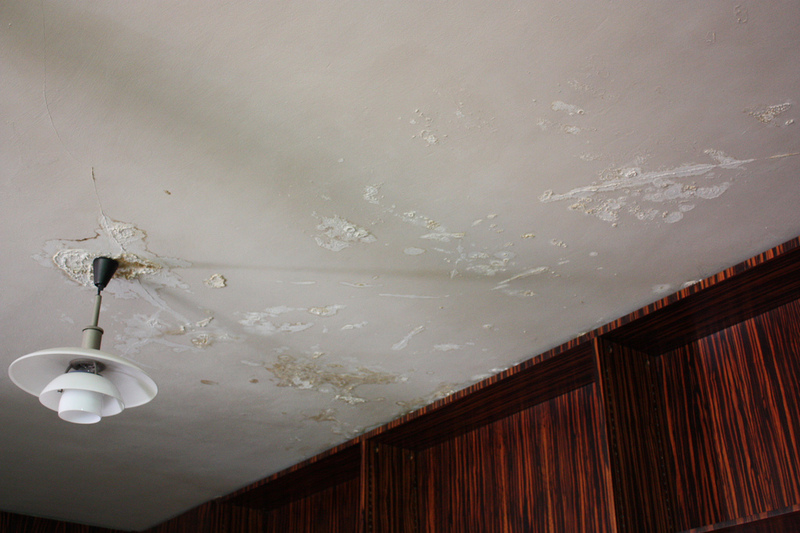 Painstaking care and attention was given to the plaster work. Again, the same plaster as was used in the house the first time was used in the restoration. The restorers even went so far as recreating the plastering styles of the different plasterers and maintaining the characteristic flaws in the original work. Of course given the building’s history, quite a number of fixtures had to be replaced. The glass of the massive windows is not the original, but it was produced to be of top quality, so to be in line with Mies’ philosophy. The furniture also had to be replaced, though again the pieces retain the original design principles of the former items. The total cost of the restoration came to 173.6 million CZK. 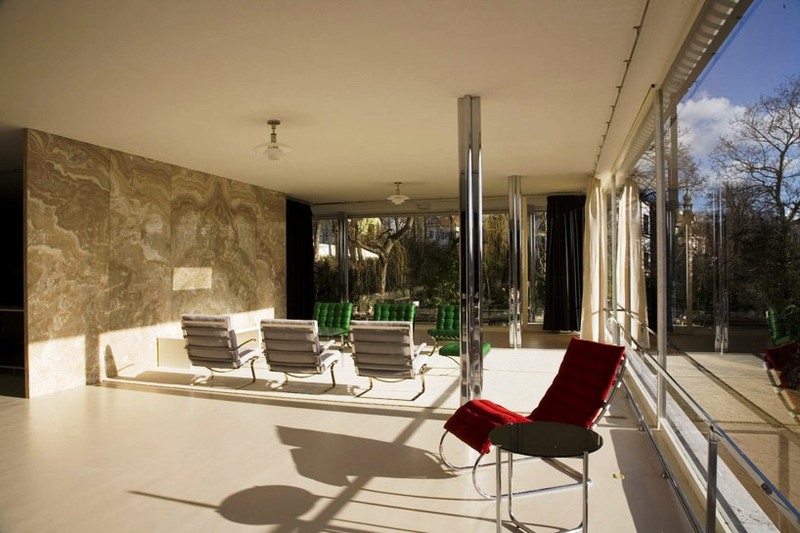 About 80 percent of the villa’s original features have been preserved, making it “the most authentic Mies van der Rohe building on the European continent,” said Iveta Cerna, an architect from Brno’s municipal museum who has looked after the villa since 2002. 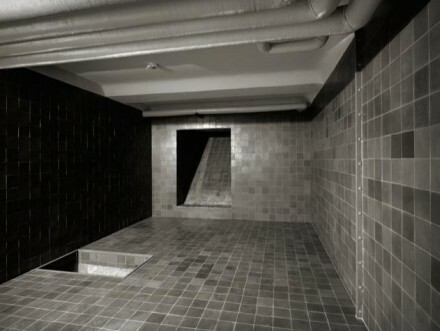 Good fortune played its part: An original bathtub, missing since the 1940s, was found in a nearby house; and a curved wall of Macassar ebony was discovered at a dining hall inside Brno’s Law School, where it had been taken to spruce up a bar built for Nazi officers. Brno experienced a building boom in the late 1920s that reflected the growing confidence of the city in the independent Czechoslovakia, created in 1918. 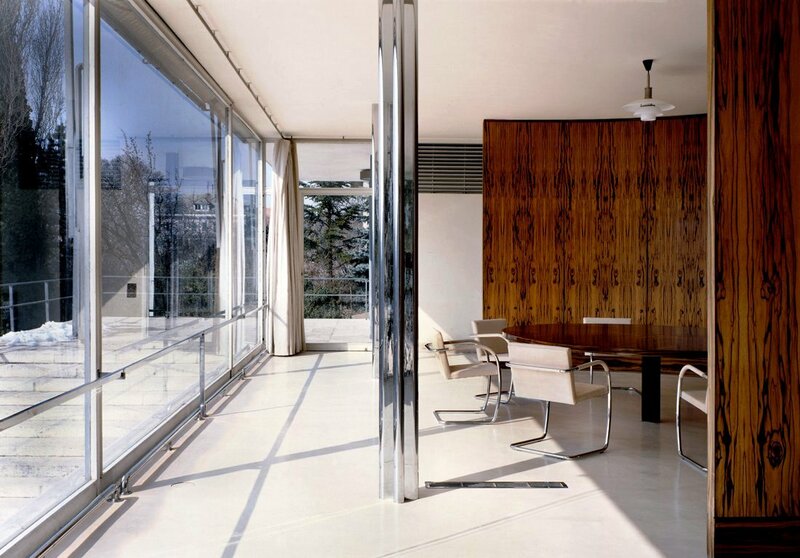 Grete and Fritz Tugendhats, co-owners of wool factories and part of a large German-speaking Jewish community in the city, were able to commission the home of their dreams from Mies van der Rohe. 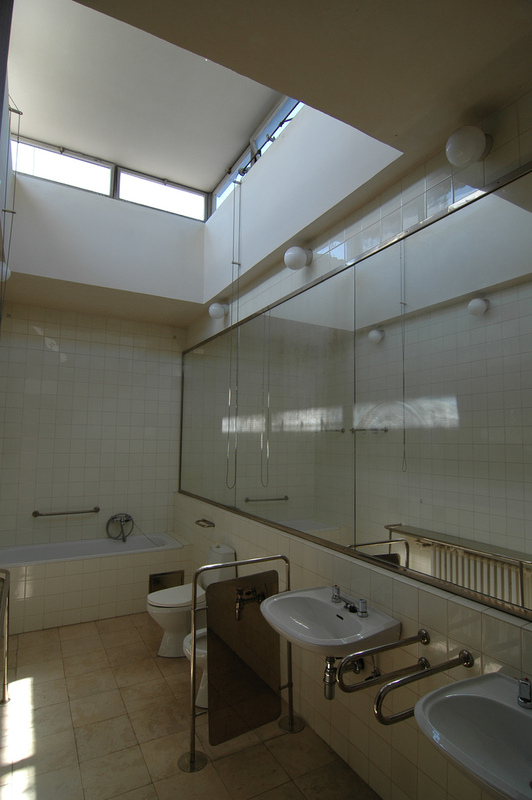 “I truly longed for a modern spacious house with clear, simple shapes,” Grete Tugendhat said in a 1969 lecture in Brno. Her husband died in 1958 and never saw it again after the family fled Czechoslovakia in 1938, a year before the Nazis took power. Grete Tugendhat returned from her home in Switzerland to visit the house several times, first in 1967. She died in 1970. Efforts by the family to claim their former property back after the collapse of communism in 1989 failed. Ms. Hammer-Tugendhat says she doesn’t know how many times she has now visited the house, but each time, the lower-level living room—a 237-square-meter, light-filled array of flowing space—fills her with awe. 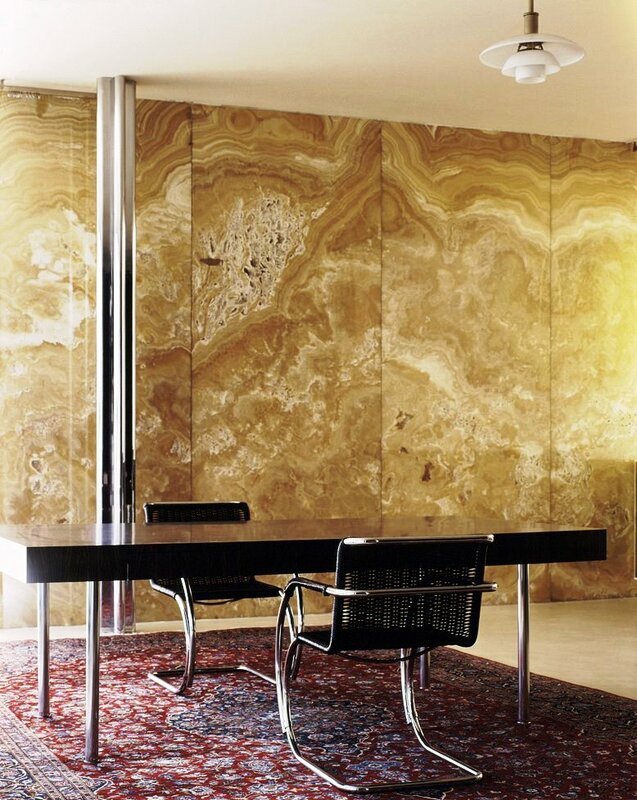 The room, one of Mies’s signature creations, fosters a feeling that “I only know from medieval churches,” she says. 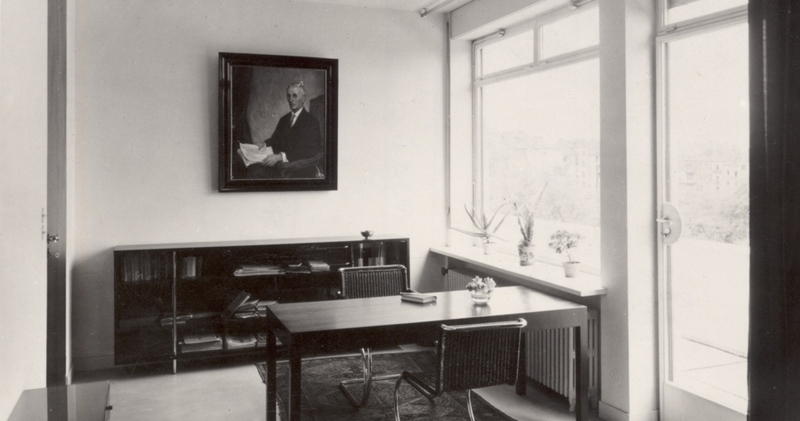 After its 1980s restoration, the room, composed of a patchwork of areas, contained “very bad imitations” of original furniture, Ms. Hammer-Tugendhat says. 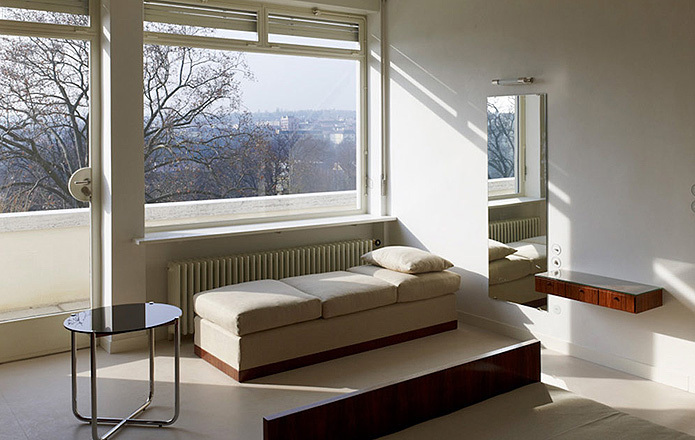 Now, it is filled with precise replicas of the house’s famous Brno, Tugendhat and Barcelona chairs. 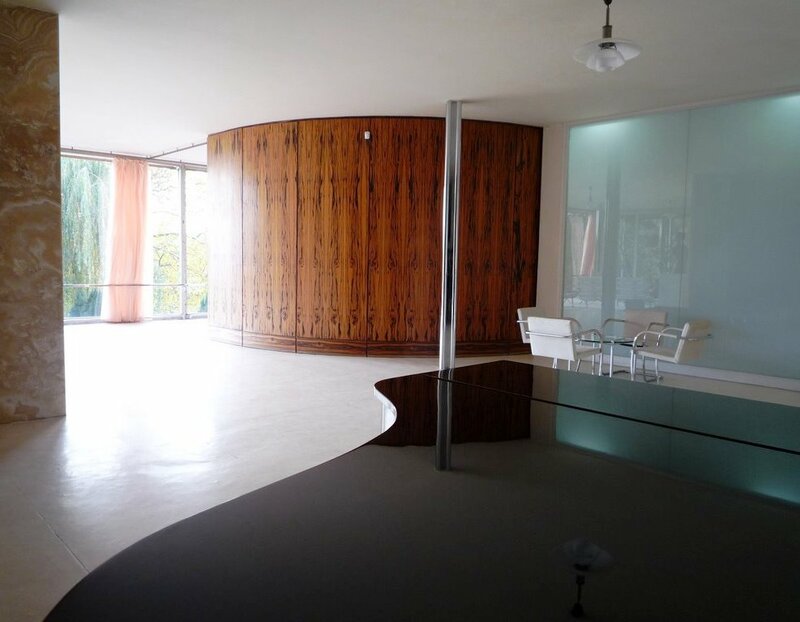 The Tugendhat House’s restoration has benefited from a new approach to preserving Modernist buildings, says Jean-Louis Cohen, a Mies scholar and professor of architectural history at New York University’s Institute of Fine Arts. “A new generation of experts,” he says, now takes an “archaeological” view, yielding superb results. 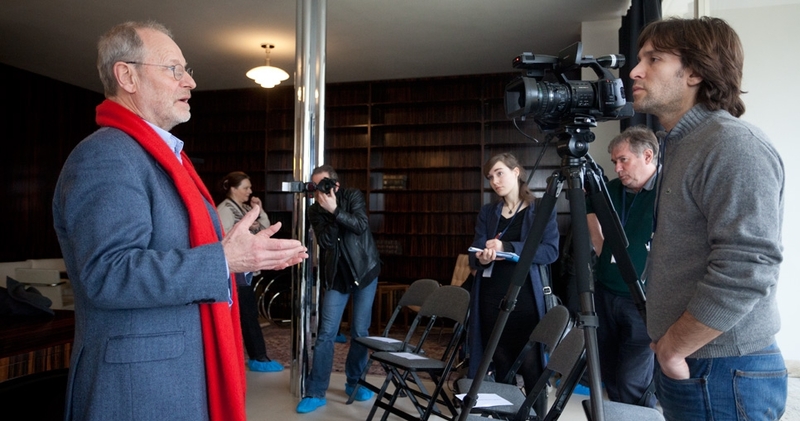 Prof. Cohen remembers visiting the house after work was finished in 1985. Although the building’s trademark flowing floor plan was still evident, he says “the grand atmosphere from the 1930s was not there.” The new interiors are once again marked by opulent elements, like rosewood-veneer doors, an ebony library bench and a round, pearwood-veneer dining table. The restoration required detective work. 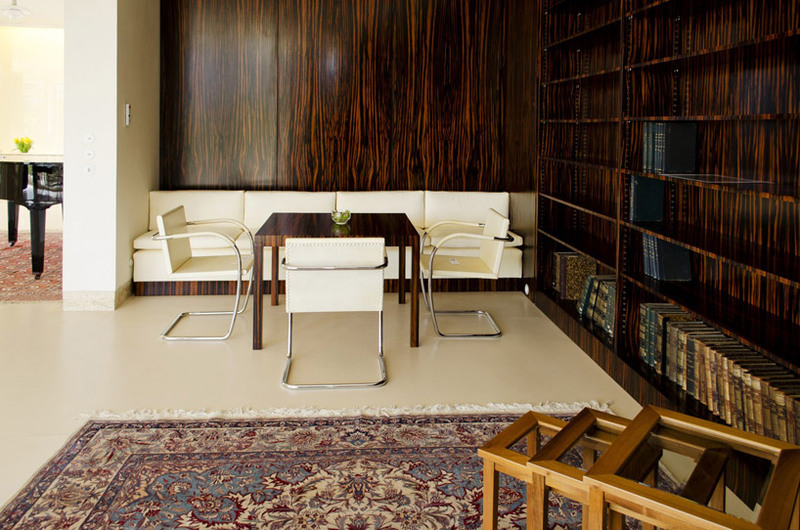 A macassar ebony room-divider disappeared during the war; it was thought lost for good until sections were discovered a few kilometers away at Masaryk University, in a canteen used by the Gestapo as an officers’ club. The hunt for original building materials led to a Moravian sand supplier, found some 20 kilometers away, and an Italian quarry, the source of marble meal used in the plaster. 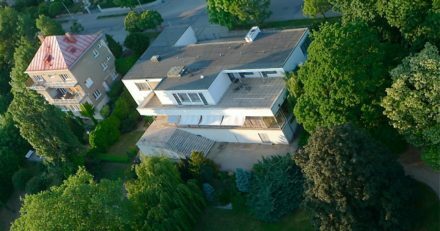 “We were very strict” about the sourcing of materials, says Brno architect Iveta Černá, secretary of the Tugendhat House International Committee, composed of experts who made recommendations about the restoration. Eighty percent of the funding for the restoration came from the European Union’s Integrated Operational Program; the rest came from the Czech Ministry of Culture and the city of Brno. The house was a design laboratory, and some of its innovations have become standard-issue. The living room contained one of the earliest plate-glass coffee tables. Millions of people now live and work with these tables in their midst, but to see the original design in its intended setting is a revelation, says Barry Bergdoll, chief curator of architecture and design at New York’s Museum of Modern Art, which includes the home’s original coffee table in its permanent collection. The table, he says, “is incredibly resonant with the architecture.” The living room’s glass walls and chrome columns are echoed in the coffee table’s glass top and chrome-plated brace. 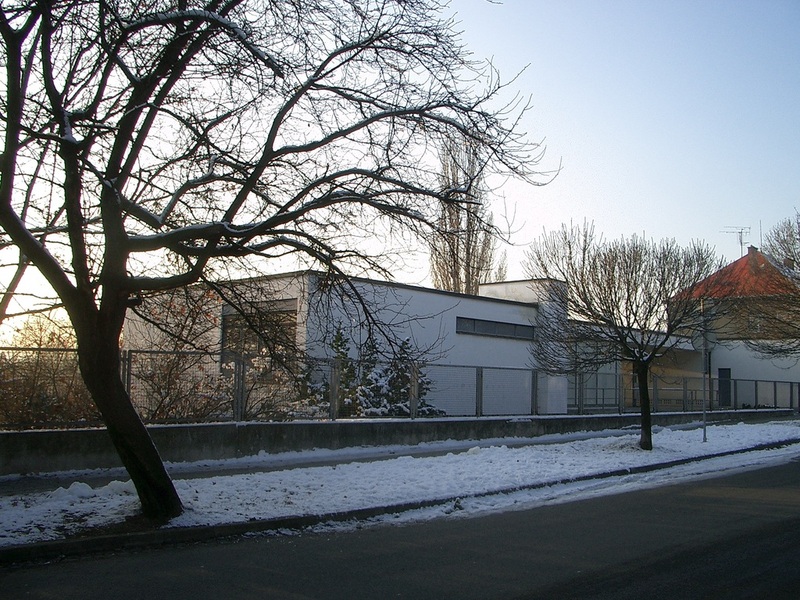 Construction history research on the Brno Villa of Greta and Fritz Tugendhat was prepared in the year 2001. Art history and theoretical analyses by the country’s leading art historians and architecture theoreticians make up separate chapters of the CHR research project. The Villa is also evaluated within the context of world modern architecture as well as from the perspective of monument care with an emphasis on the remarkable authenticity of the building. In light of the exceptional importance of the structure, the CHR research project was prepared on a particularly grand scale. For this purpose, a multi-occupational group of art historians, conservationists, archivists, architecture theoreticians, garden architects and natural scientists was assembled under the leadership of Karel Ksandr. 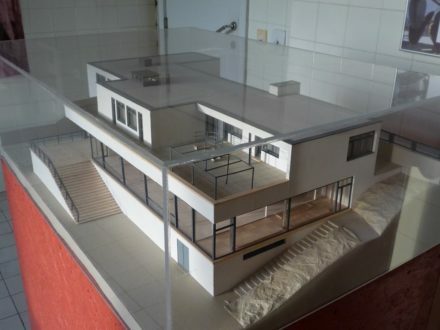 This mainly consisted of the team of specialists which had prepared the CHR research work on the Prague Müller Villa by the architect Adolf Loos. 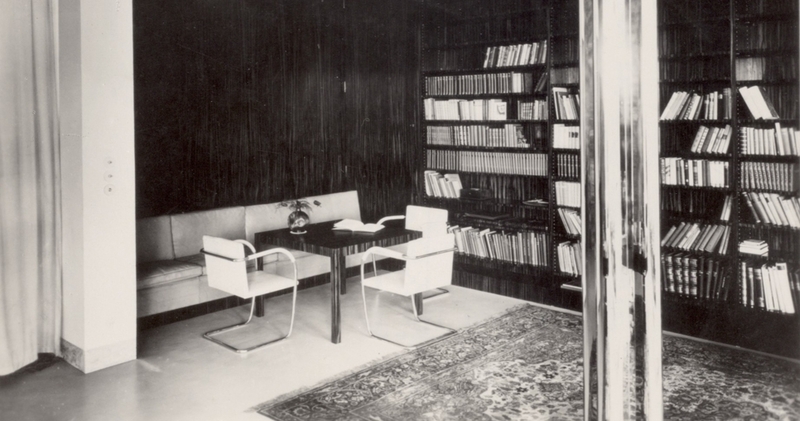 All of the available literature and specialised publications concerning the structure from its initial construction had to be studied when creating the SHP research project on Villa Tugendhat. Apart from the period reception of the Villa in publications by W. Riezler, J. Bier, L. Hilberseimer and the commissioners themselves on the pages of the journals Die Form and Der Baumeister in the year 1931, one of the most important sources was the publication The Modern House by F. R. S. Yorke published in London in the year 1934. The detailed archival research was supplemented, checked repeatedly and consequent corrections were carried out to all of the, up until now, facts presented in the relevant literature. 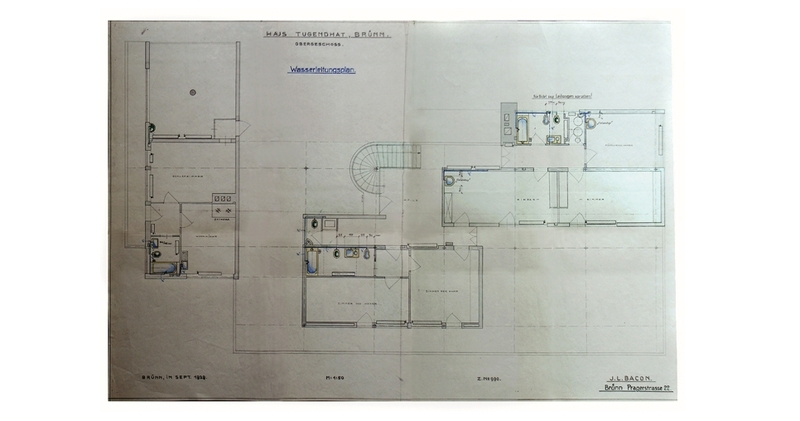 The most important and most novel finding consisted of the discovery of a carbon copy of the construction permission for the Greta and Fritz Tugendhat Villa from the 26th of October 1929 with 36 conditions from the building authority of the Regional Capital City of Brno along with the plans for all the floors of the Villa with the water piping. The drawn furniture items in the archive of the Brno Waterworks and Utilities were also discovered. The materials from the legacy of the Brno architect František Kalivoda stored in the Brno City Museum were also of particular interest. Practically all of the available planning materials in the country, first and foremost the plans stored in the Brno City Museum as well as the informative style plans located in the Mies archive in the Museum of Modern Art in New York, were also assembled. 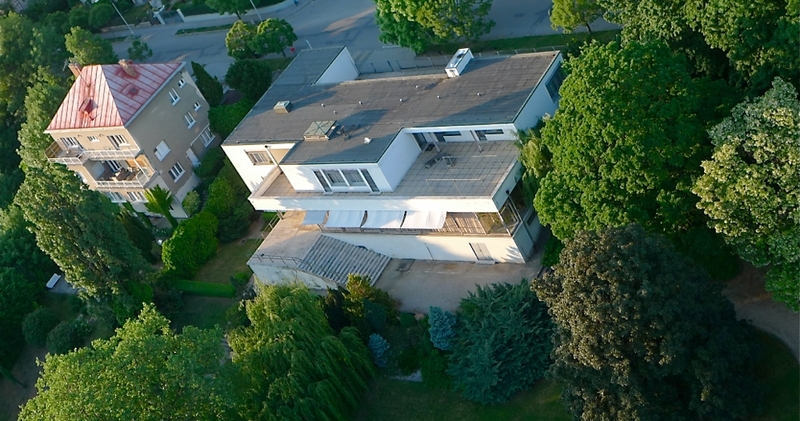 The detailed geodetic alignment of Villa Tugendhat, carried out in the spring of the year 1969 and stored in the archive of the National Monument Institute – Regional Specialised Workplace Brno, was also a valuable archive source. This alignment is of key importance for the renewal work on the Villa as it includes drawings of the original furnishings, radiators, switches, etc. A detailed description and photo documentation of the present state of the structure was carried out as part of the framework of the actual research work on the house as a material source. All of the available photographs of the Villa from the between-the-wars period were accumulated for this purpose in order to be made use of for essential comparisons with identical pictures of the present state. A collection of photographs from the post-war era, in particular from the end of the 1960s, once again from the year 1980 when the Villa was in a serious state of disrepair, and finally from the year 1985 when the renewal work on the Villa was completed, were assembled. The terrain research also included natural science work, concretely stratigraphy of the most essential layers (the plaster, coatings, etc.) which have been documented in blown up photographs of the particular sections as well in photographs with UF radiation for improved evaluation of the particular layers. Suggestions for the monument-restoration renewal of the structure were prepared in connection with the physical research work. A list and evaluation of the interior furnishings including the documentation of the state of the authentic elements preserved within the territory of the Czech Republic as well as abroad was carried out. 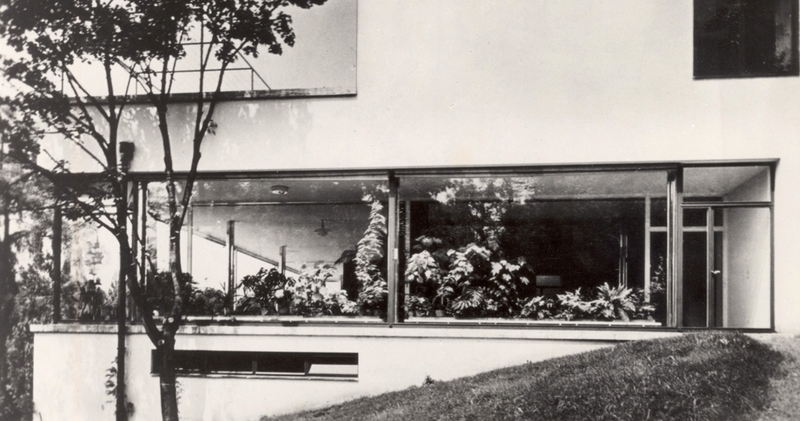 Research work was performed on the garden with an evaluation of the project for gardening adaptations from the year 1930 which the Brno garden architect Markéta Roderová-Müllerová contributed significantly to alongside of Mies himself. The original composition of the plant inventory (including the winter garden) was also determined along with an inventory of the current plant population with an evaluation of the originality, the age and the appropriateness within the context of the planting performed upon completion of the building. The first-hand accounts of still living individuals who had had contact with the Villa in the past was included into the CHR research project. The most important of these was provided by Ing. arch. Jarmila Kutějová and Ing. Josef Janeček, the authors of the project for renewal of the Villa from the years 1981 – 1985, as well as Zdeňka Strouhalová who visited the Villa over the years 1959 – 1961 as part of her health rehabilitation programme. Members of the Tugendhat family themselves have also provided valuable accounts including family photographs. 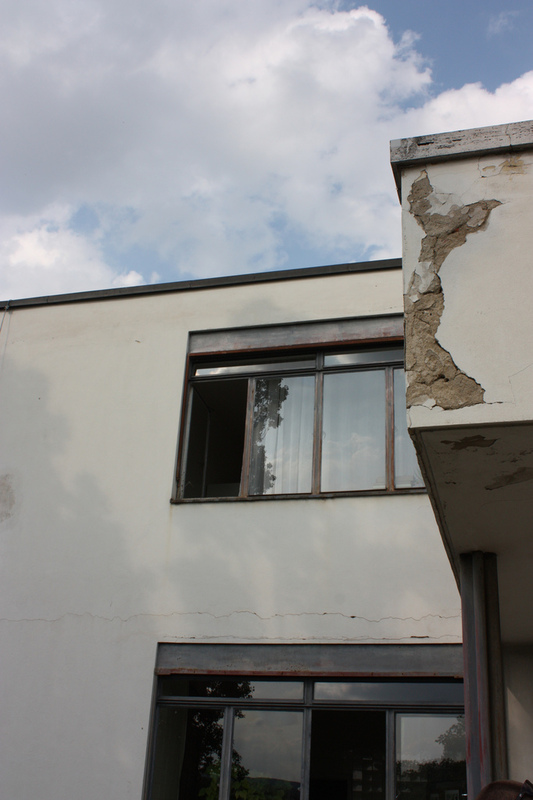 The THICOM is a committee of specialists to advise the City of Brno for the evaluation of the technical issues regarding the preparation and implementation of the restoration of the Tugendhat House according to the principles of the preservation of a monument. 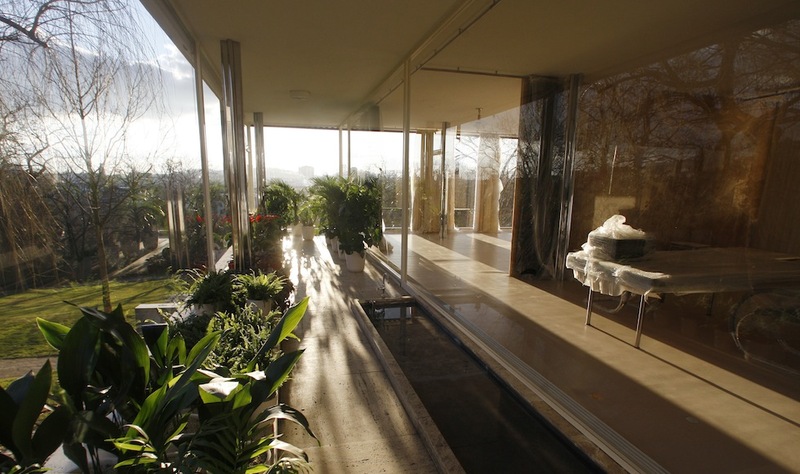 The THICOM comments on basic conceptual, theoretical and methodological issues regarding the restoration of the Tugendhat House – according to the principles of the preservation of a monument – on important processes of preservation and restoration of the building fabric and on refurbishing the interior and the garden. 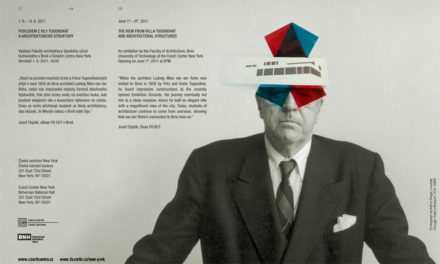 This comparison of photographs came about through a study of the photography archive of Fritz Tugendhat and the DeSandalo Brno studio and photographs taken by Daniela Vokounová and David Židlický. The comparative photographs were taken at the same place as the period ones and can be consequently made use of during the restoration of the Villa. 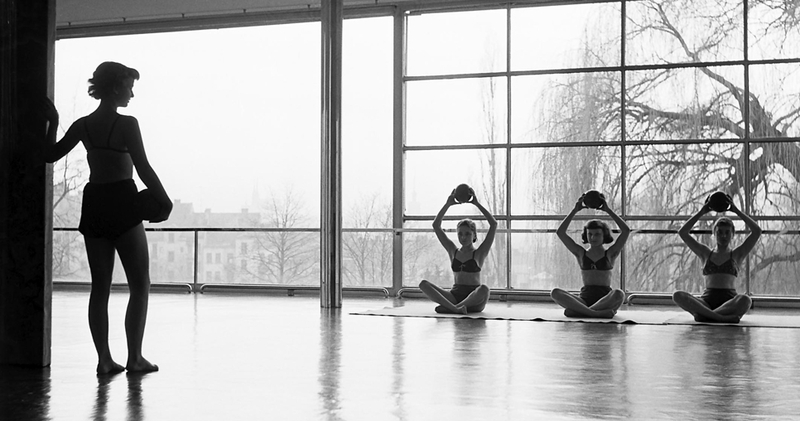 The photographs were carried out with a large format camera Linhof 9×12 cm with a Rodenstock lens. The collection consists of 12 photographs. We chose the period photographs of Fritz Tugendhat as well as the work of the De Sandalo Brno studio as a starting point in order to capture the condition of Villa Tugendhat 2006–2010 in photography. We are carrying out a number of comparative photographs at selected, carefully chosen, points. The comparison of period photography and photographs of the current state are an excellent source of narrative value for the future. We focus on exact and detailed depiction of photographic reality without the addition of temporal light effects or additional emotional aspects. We carefully observe and explore the issue of the employment of appropriate lenses, both from a construction as well as from a focal distance. 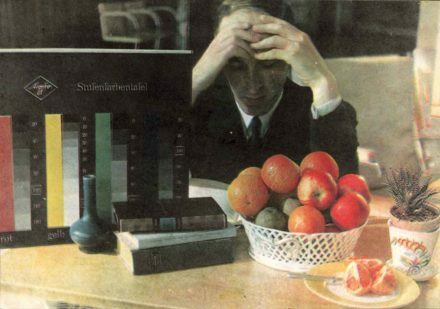 We are interested in the inspiration of possible formats of the consequent photography, the cinema film field of the shots by Fritz Tugendhat and the panel film of studio De Sandalo. We explore the effect of light on the space, the appropriate light atmosphere for capturing certain materials, the suitable means of lighting – where they were placed in the past. We work with the available furnishings of the interior with the furniture placed at the exact period positions. 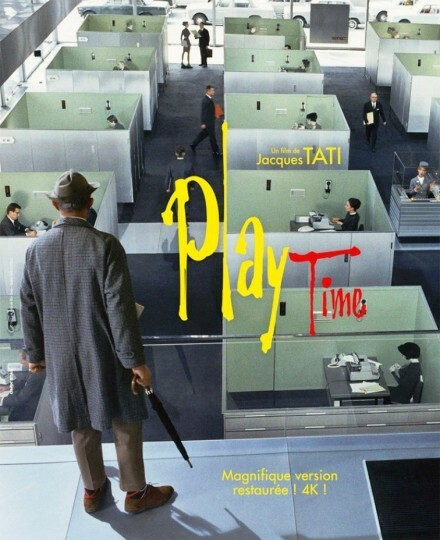 We at the same time make use of the most appropriate classic film and digital technology. The first and, up until now, final overall renovation of the Villa took place over the years 1981-1985. 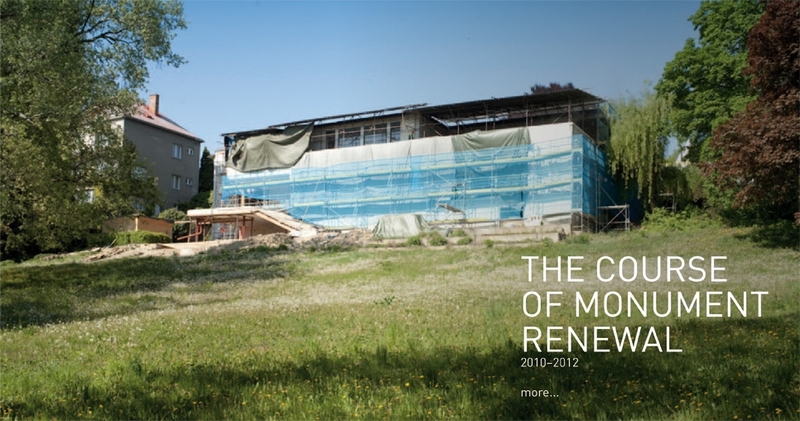 The project was prepared by the State Institute for Reconstruction of Historical Towns and Buildings in Brno. 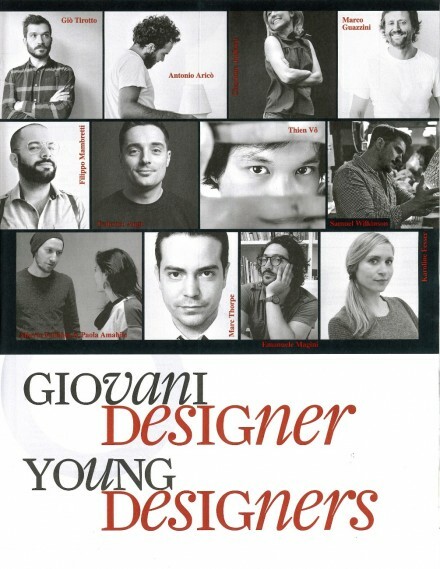 The designing team (Ing. arch. Jarmila Kutějová, Ing. Josef Janeček, Ing. arch. Adéla Jeřábková) was led by Ing. arch. Kamil Fuchs, CSc. (1930–1995), son of the renowned Brno architect Bohuslav Fuchs. 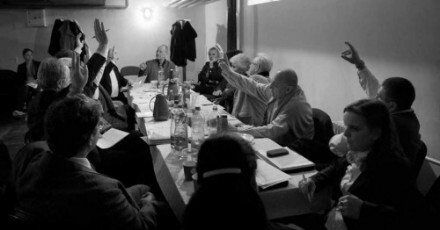 The investor, the department of internal affairs of the National Committee of the City of Brno, established clear guidelines: the house should serve for advertising the city and occasional accommodation of guests. The public was clearly not taken into account. There was no construction-historical, restoration or other research carried out. The only sources of information made use of by the architects were the archive plans and photography from the collections of the Brno City Museum. 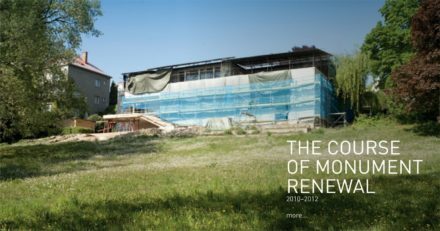 The main ambition of the project was to restore the Villa to a solid construction-technical state and preserve it for future years. 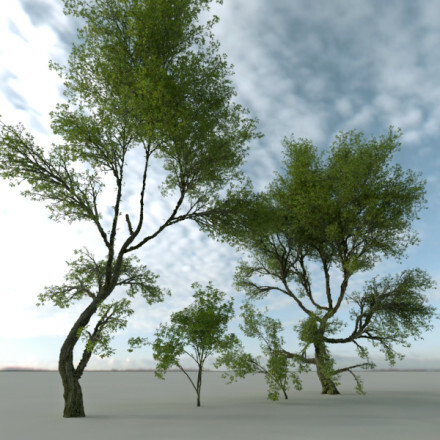 The work of the design team and the actual realization need to be clearly differentiated. The investor carried out minor construction work on the Villa, even prior to receiving the design preparation, wherein certain original elements were destroyed. The project was literally strictly vetoed quite often during the actual construction work with demands for alternative designs. The main supplier of the construction project, the Construction Company of the City of Brno, was also problematic in terms of their participation. There were no actual statics defects to the house apart from the terrace with the stairway down to the garden which had not been sufficiently supported during the initial construction of the Villa. 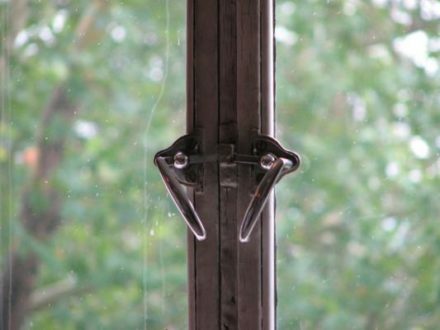 The subtle steel construction of the glazed panels in the main living area, as well as the steel frames of windows and doors on the bedroom floor, showed evidence of considerable levels of corrosion caused by large thermal bridges and condensation. They were only thoroughly cleaned, however, repaired and coated with a readily available paint. Supplies of large-surface glass from a foreign investor were rejected and the glazing was consequently carried out with two pieces with a central dividing joint sealed with transparent silicon putty. The only preserved window opposite the onyx inner wall had to be destroyed at the order of the investor in the final phase of the construction work as its colour and absence of a dividing joint was not “in line” with the new glazing. The original linoleum mark DLW was replaced by the domestic PVC. 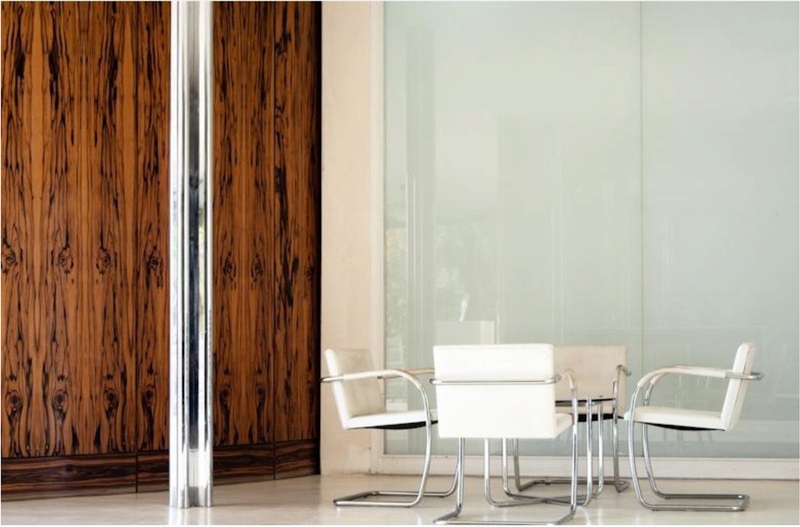 The curved inner wall from Macassar ebony near the dining room was secured with a shorter height dimension with this difference, against the will of the designers, dealt with by an adaptation with a high socle with inappropriate longitudinal veneer work. The preserved sanitary objects in the bathrooms and WC as well as the radiators had been to a great extent disassembled prior to the beginning of the design work by the construction crew of the investor who was unwilling to even discuss leaving them in situ or storing them. 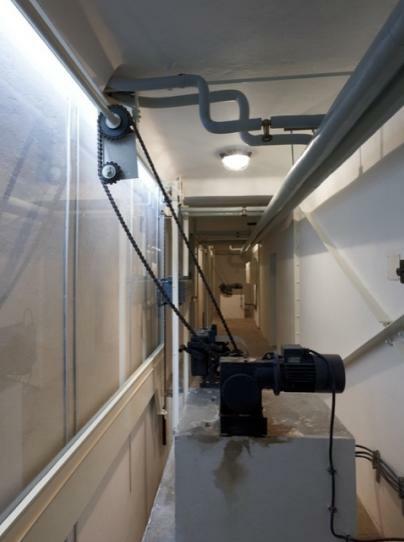 The original supporting construction for the retractable windows was preserved in both engine rooms while the disassembled drive units were newly supplemented. The engine room for the air technology was practically in its original state with only elements added which were needed for the functioning of the system. 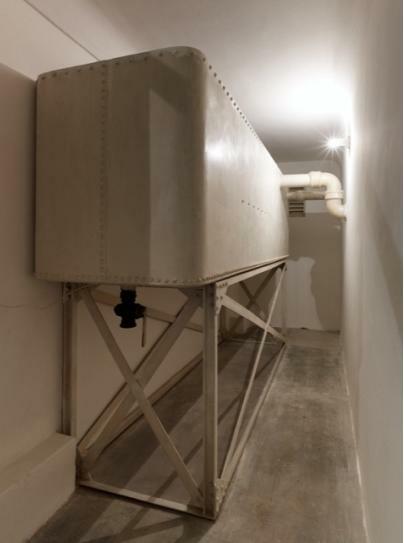 The original boiler room for coke was transformed into a calorifier room connected up to the outdoor caliduct. The upper dwelling terrace was newly paved with replicas of the paving stones created from the same sizes of stone, placed into exact forms and laid in accordance with the original installation drawing. The travertine socles and capitals of the railings of the upper terrace were original as were the constructions of the benches. The partially authentic fencing was supplemented to while the newly introduced roof had bitumen roofing. 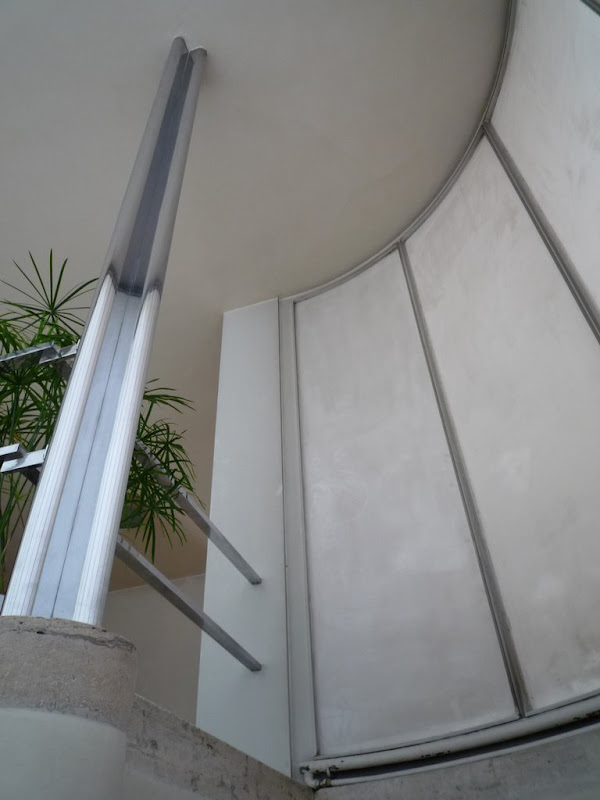 The damaged sections of outdoor plastering were replaced in the original structure with a white façade coat of a silicate base, while the internal plaster was sensitively repaired and treated with a layer of white paint. A team of specialists under the supervision of Karel Ksander carried out construction historical research on the structure in the year 2001. Professor Ivo Hammer, the husband of the youngest daughter of the commissioners of the Villa, Professor Daniela Hammer-Tugendhat, supervised restoration research here over the years 2003-2005. This research along with careful studying of the documentation from the years 1981-1982 has indicated that the project was on a particularly high professional level for its day. The actual realization consequently occurred in line with the financial, technical, material and technological possibilities of the time period. 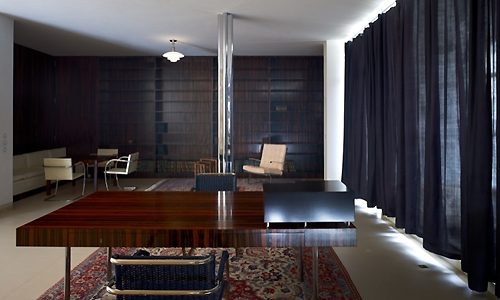 Can the Tugendhat Villa be Lived in ? This provocative question was voiced by the art historian Justus Bier. This was a reaction to an article on the new structure of the Brno Villa in the magazine ‘Die Form’ which was published in the year 1931 by the publisher himself Walter Riezler. 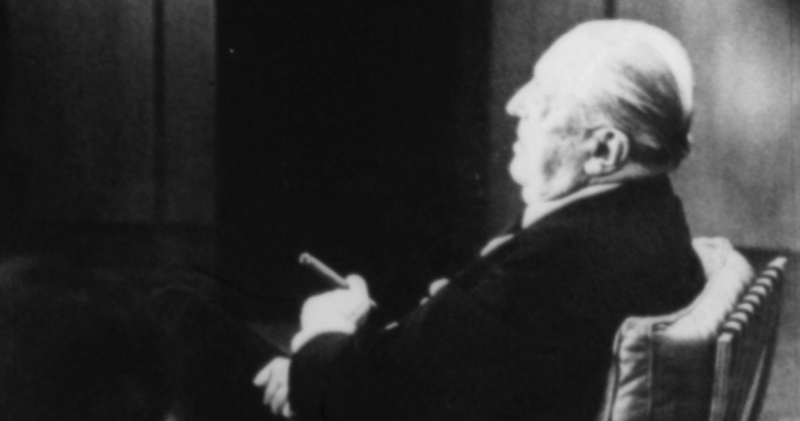 The heated debate between Walter Riezler, Justus Bier, and the architect Ludwig Hilberseimer . At the same time, Die Form presented a debate led by Riezler and the marxist architecture critic Roger Ginsburger, which also started out from the Tugendhat House and examined the ‘origins and goals of modern architecture. 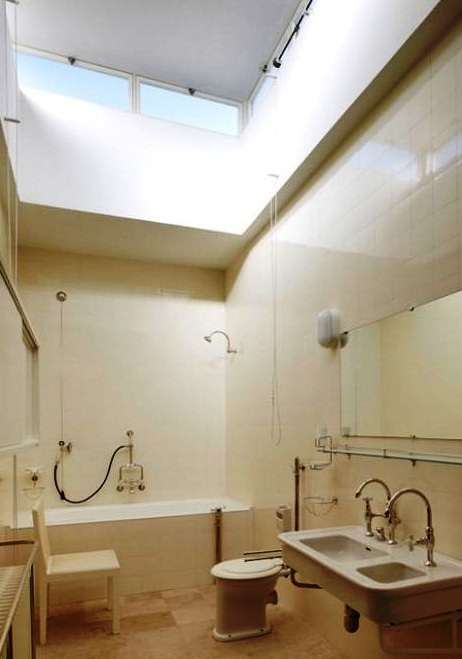 This debate, and it was no coincidence that it was inspired by the Tugendhat House, raised fundamental questions about the architecture of modern residential housing. 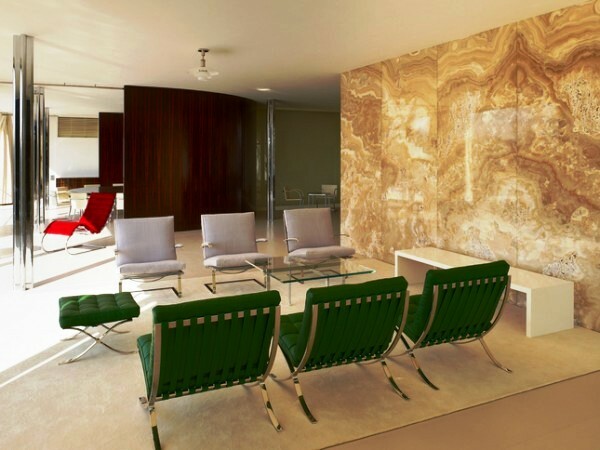 Bier criticized Mies van der Rohe, who had, in his view, transferred the concept of the Barcelona Pavilion to a private house. 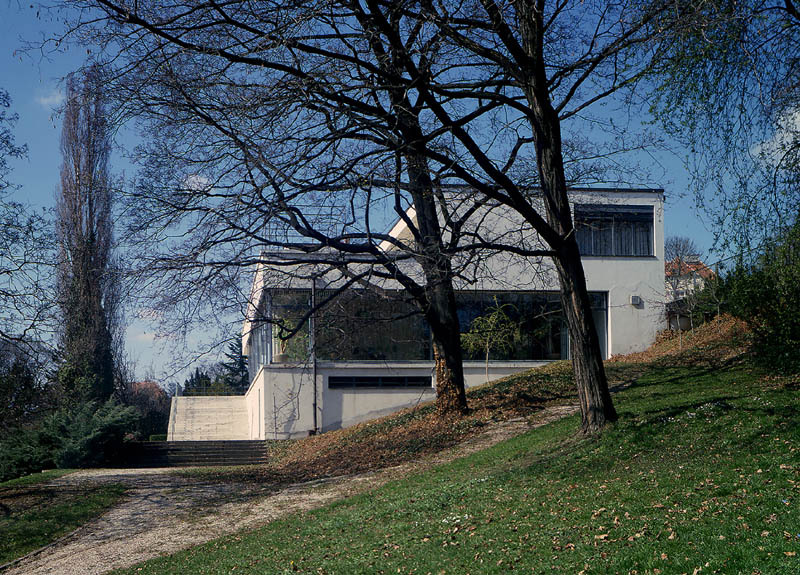 The owners themselves entered into the polemic on the theme as to whether “the Tugendhat Villa can be lived in” with their reactions supplemented with a text by the architect Ludwig Hilberseimer. The Tugendhats rejected the view that the monumental, impassioned living space would only allow for a kind of ceremonial or showpiece housing, and in contrast expressed their complete satisfaction with its variable character. 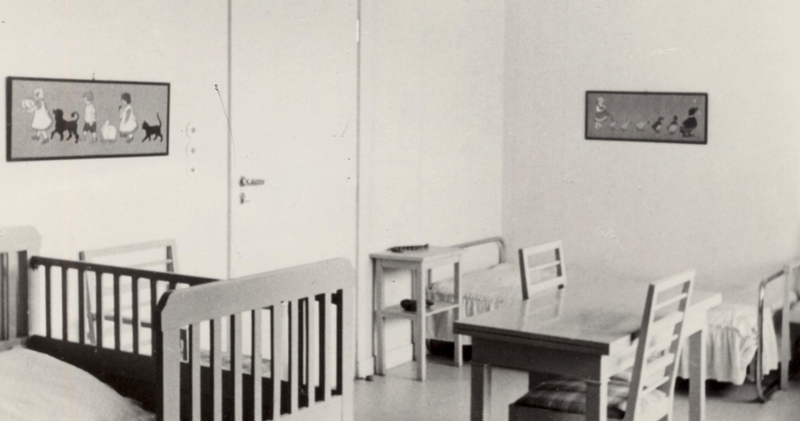 The unforced domestic calm also radiates from the family photographs by Fritz Tugendhat who was a photo enthusiast and amateur filmmaker. 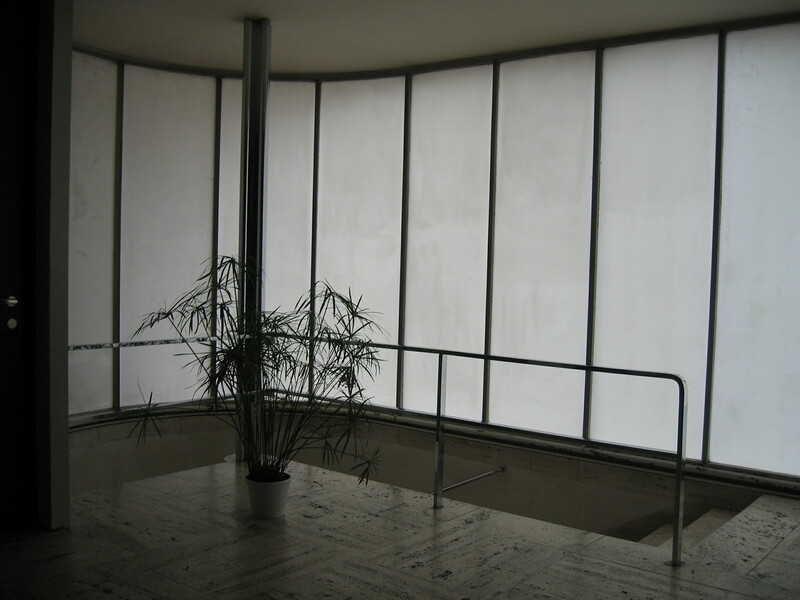 From the philosophical perspective the Tugendhat Villa particularly reflects the influence of the German Catholic Modern movement. The American art historian Barry Bergdoll as well as the Czech art historian Rostislav Švácha have pointed out in this connection the ideas of the philosopher Romano Guardini, one of the most significant figures of German Christian Personalism. 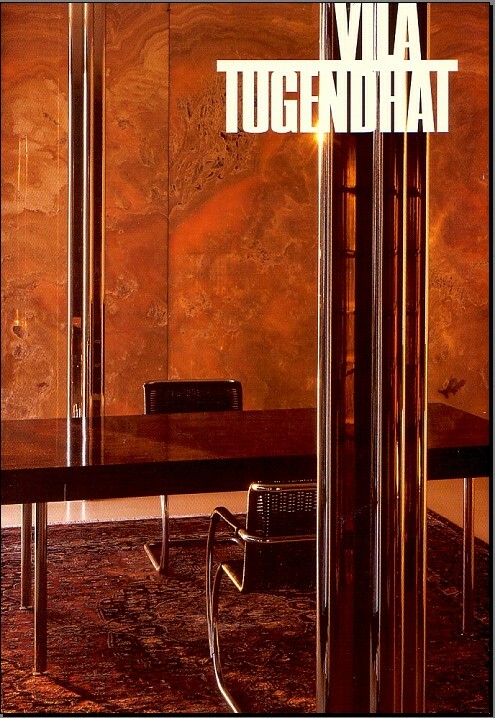 The Tugendhats apparently knew Guardini’s views or at least discussed them with Mies. Guardini’s works, which came about at the same time as the design of the Villa, state that a well-built internal space has levels which lead into depths. 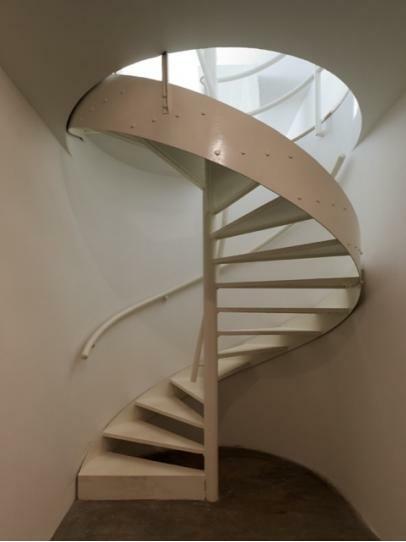 This is precisely the manner in which one enters downward into the space of Tugendhat Villa the intimate character of which is protected by the stern street section of the house. 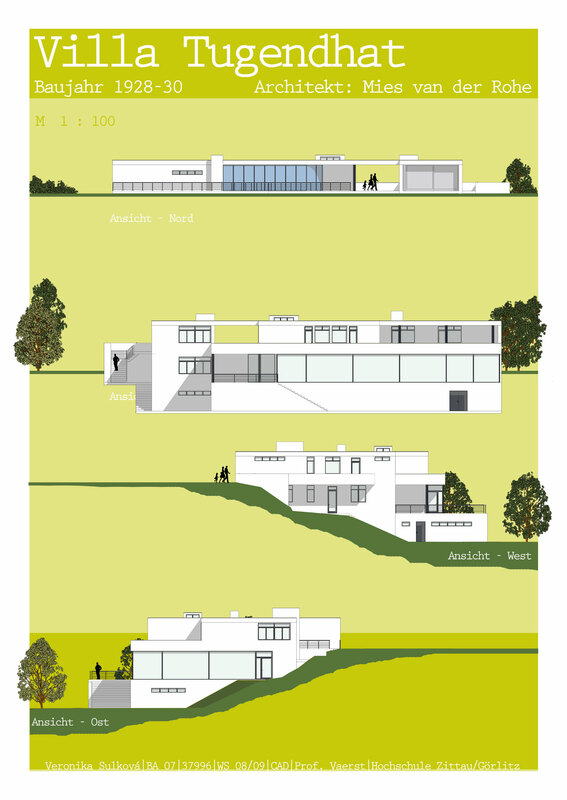 Art historical theories and interpretations of not only Tugendhat Villa but Mies’ work in general will continue to stimulate generations of art historians and architecture theoreticians. Up until now almost all of them have agreed that the essence of the Brno realization was the arrangement of the main living space and its connection up with the external outdoors. One of the starting points was undoubtedly the ideas of F. L. Wright and his “open plan” which at the turn of the 19th and 20th centuries removed the four walls demarcating the rooms allowing for the emergence of a continual space with a connection to the exterior of the structure. Mies van der Rohe himself did not write anything about the Brno Villa, but he did discuss the conception in detail with his educated clients. Czech’s leading art historians view “the loose” and “the open” space of the house as analogical to the architecture of the Middle Ages and the Baroque. Václav Richter compared Mies’ space conception with Santini’s radical Baroque space in the pilgrimage church on Zelená hora near Žďár nad Sázavou. Richter’s student Zdeněk Kudělka has made reference to the Neo-Gothic aspects of this space which is enhanced by a cross-like connected profile of steel supporting columns and the mirror-like gloss of its chrome cladding. These interpretations coincide with Richter’s remarkable periodization of the history of “the open” architectural space which was in his view only fulfilled in the Gothic, in the radical Baroque and in the skeleton architecture of the 20th century. 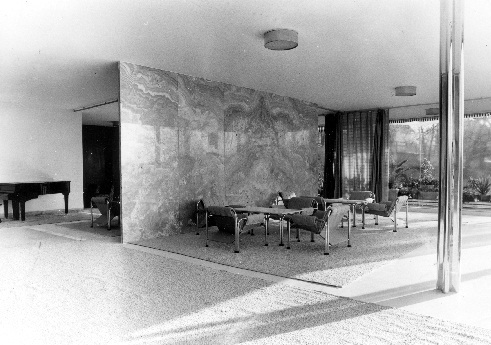 Mies’ student Philip Johnson and after him the Swiss architecture historian Sigfried Giedion have interpreted the interior of the Brno Villa as “a flowing” space whose “flow” is only gently channelled by the lines of the onyx and the Macassar inner wall in harmony with the regular rhythm of the supporting columns and the carefully placed furniture. The period Czechoslovak specialised journals ostentatiously ignored Mies’ realization in Brno. 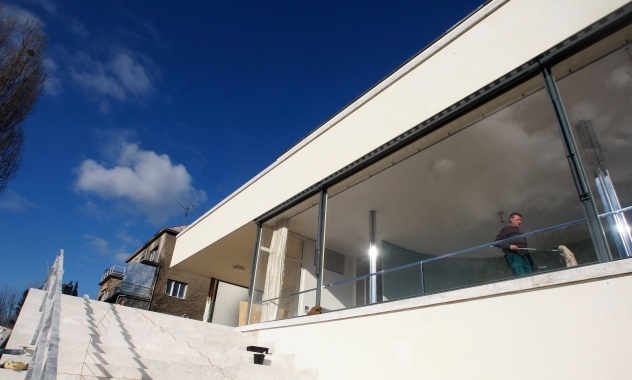 The only positive evaluation of the building in the domestic press came from the exclusive society magazine Měsíc (Month) which presented the Villa as one of the crowning expressions of contemporary aesthetic and technical maturity. The negative attitude by Czech specialised circles would thus seem to foreshadow the painful future of both the Villa and its inhabitants. What would you do if the very grand, rather imperious architect who had designed your house invited himself for a visit? Doubtless, you would want the house to look its best, especially if its design was so radical that it had caused a critical storm. 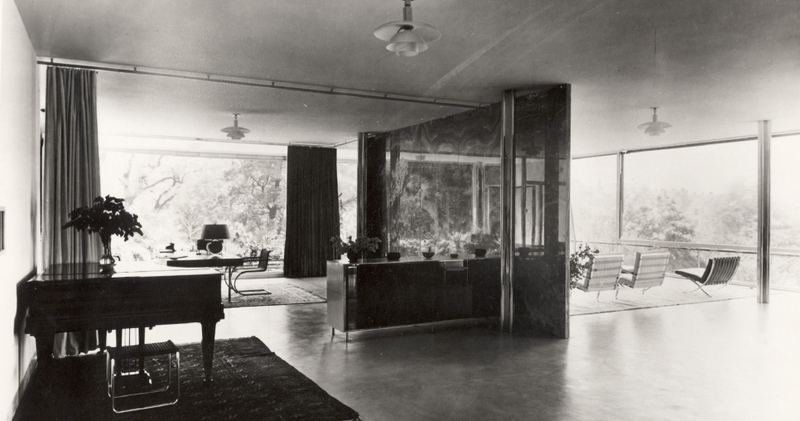 Even so, Fritz and Grete Tugendhat’s response to the news that Ludwig Mies van der Rohe was coming to Villa Tugendhat, the house he had built for them and their three children in the Czech city of Brno during the late 1920s, was rather extreme. They were so worried that he would object to the presence of Grete’s shabby old piano in the room he had furnished for the children’s nanny that they decided to hide it in the basement. Thankfully there was no need, because the visit was canceled. 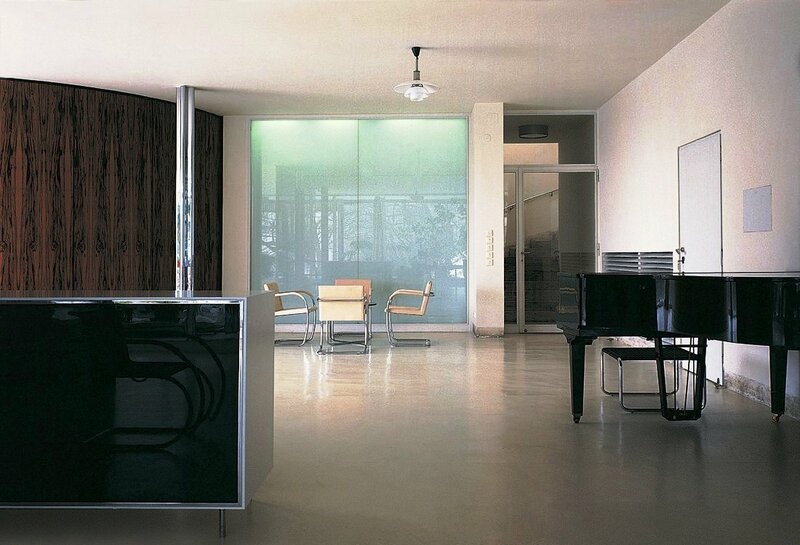 Luckily for Mies, his detractors knew nothing of the piano saga. The gist of their criticism was that his design was undeniably beautiful, but too imposing to live in, at least, not comfortably. 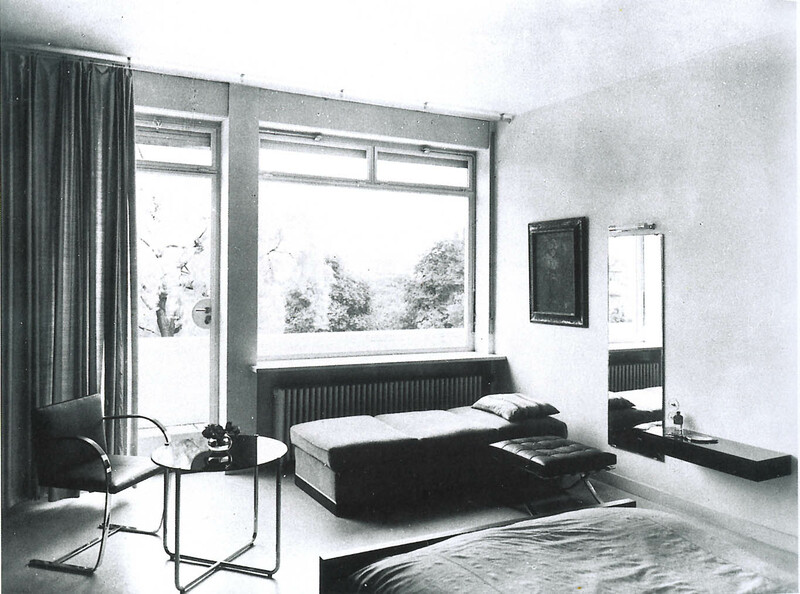 “Can one live in Villa Tugendhat?” was the title of a 1931 essay in Die Form magazine. 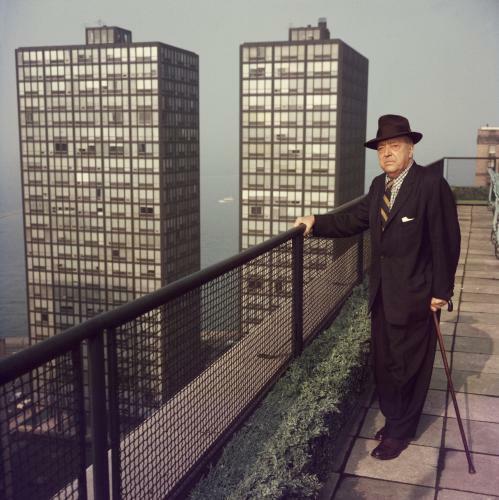 The Tugendhats argued that one could, but they were wonderfully accommodating clients who had told Mies precisely what they needed from their home, then given him carte blanche and a seemingly limitless budget to build it. 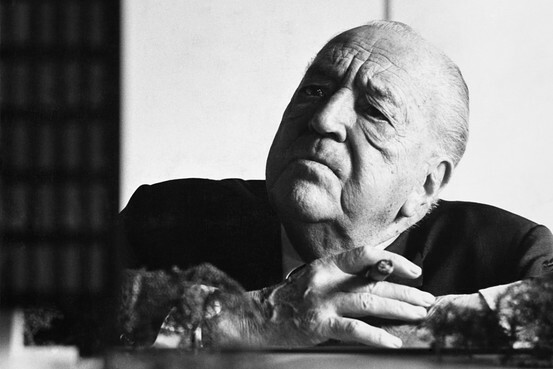 The result is among Mies’s finest works and was hailed as a new model of 20th-century living, at least for those who were as sophisticated and privileged as the Tugendhats, both of whom came from wealthy Jewish industrial families. They moved into the house in 1930, but abandoned it eight years later to flee Czechoslovakia before the threatened Nazi invasion. 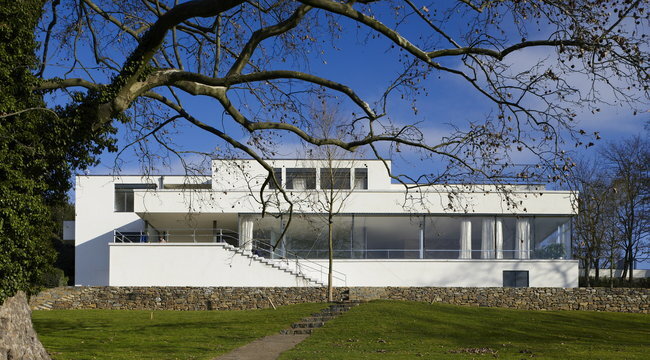 Villa Tugendhat has now been restored, and is to open to the public on March 6, when visitors will discover that, innovative though it is in style and structure, the house is deeply traditional in other respects. Villa Tugendhat is a product of what Mr. Bergdoll calls “the miracle period” of Mies’s prewar career in late 1920s Germany when it was one of a series of commissions he undertook, together with the Barcelona Pavilion or, as it was officially called, the German Pavilion at the 1929 International Exposition in Barcelona. 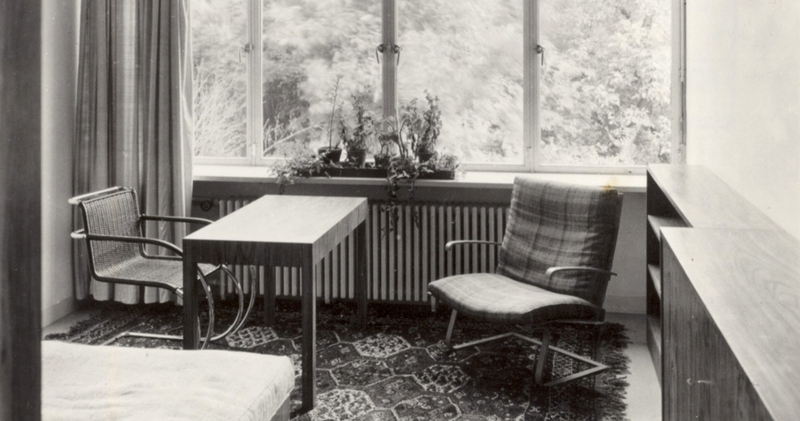 Grete Tugendhat had visited one of his houses when living in Germany with her first husband. 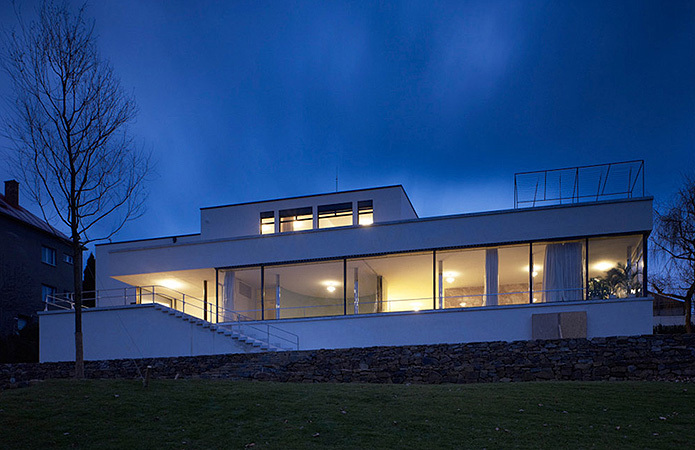 After her divorce, she married Fritz Tugendhat, and they invited Mies, then in his early 40s, to design their home on a site with magnificent views of medieval Brno. 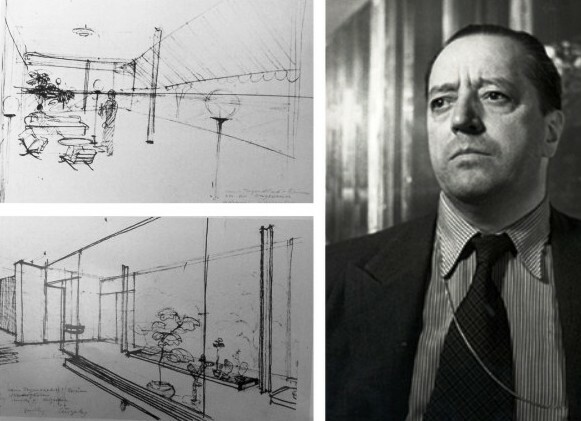 The result was a steel-framed structure in which Mies addressed his clients’ desire for privacy by locating their bedrooms on the upper floor, and most of the services, including Fritz’s photographic studio, on the lower floor. Between those floors is the public space, a sumptuous open-plan room looking out over the garden and across the fields to Brno through an immense glass wall. It is divided into different areas by velvet curtains and an onyx-clad screen, whose colors change with the light throughout the day. Working with the interior designer Lilly Reich, Mies specified all of the furniture and furnishings in opulent woods, stones, velvets, silks and leathers. 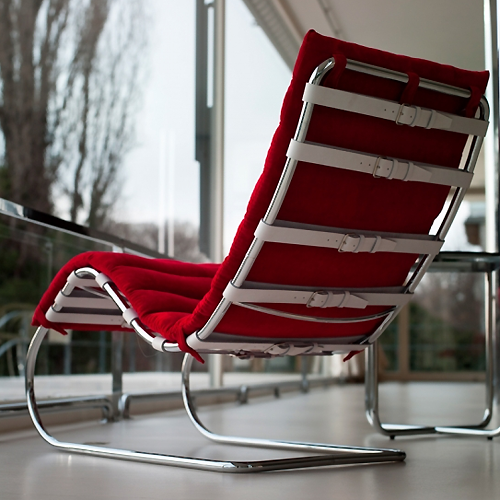 A new chair, the Brno, was designed especially for the house, with white sheepskin upholstery and a flat steel base. Mies insisted that there should only be one work of art in the living space, a 1913 sculpture of a woman’s torso by the German artist Wilhelm Lehmbruck. The contrast of the glass-and-steel structure with its opulent interior and the natural beauty of its surroundings became a template for modern luxury. The Tugendhats loved living there. Grete Tugendhat said that she had “longed for a modern and spacious house with clear, simple shapes,” and insisted that they found Mies’s design “liberating” and the vast glass room to have “a very particular tranquillity.” The family left the house intact when they fled Brno in 1938, a year after Mies’s departure for the United States, where he designed such postwar architectural landmarks as the Seagram Building in New York and the Farnsworth House in Plano, Illinois. 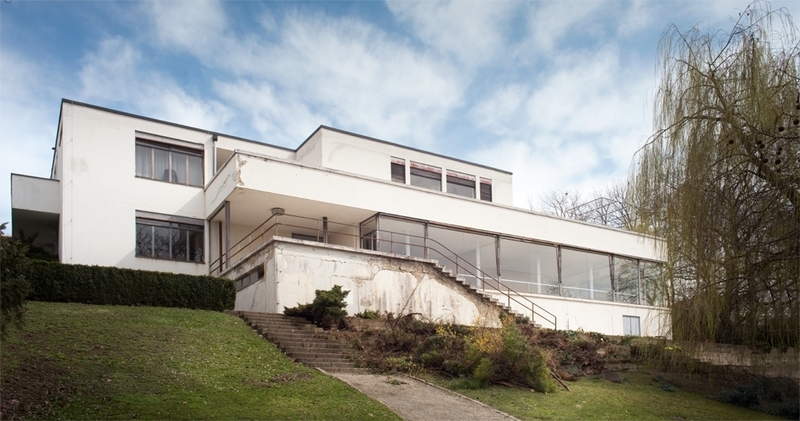 Villa Tugendhat was ransacked during World War II, first by the German Army and then by a Soviet cavalry regiment, which stabled its horses there. 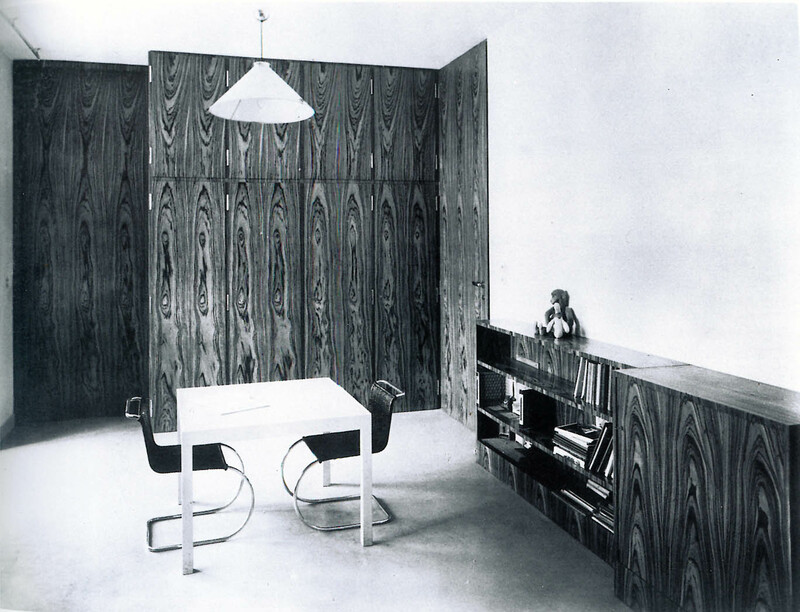 Mies and Reich’s exquisite rooms were in ruins, and their furniture burned as firewood. After the war, the house was used as a dance school and a rehabilitation center for a nearby children’s hospital, before being renovated, albeit clumsily, in the 1980s. 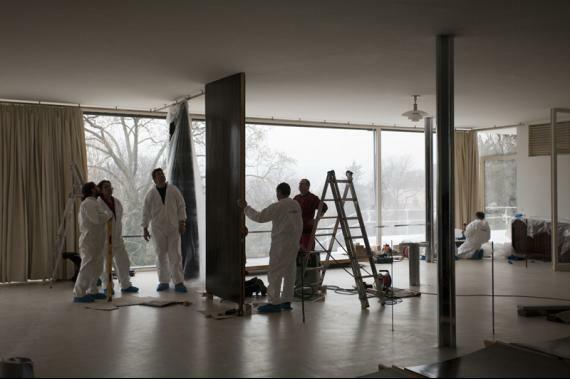 When Unesco designated Villa Tugendhat as a World Heritage site in 2001, the plans for the latest restoration began. 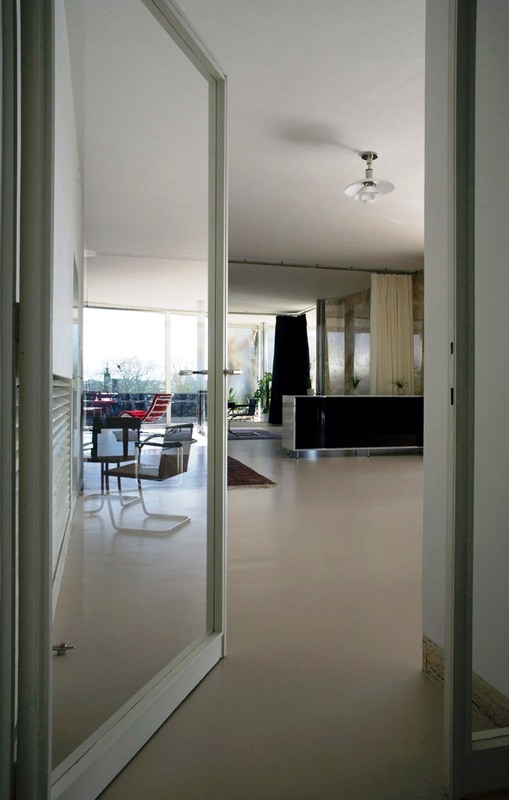 And Grete Tugendhat’s “modern and spacious house with clear, simple shapes” is now very much as Mies envisaged it. 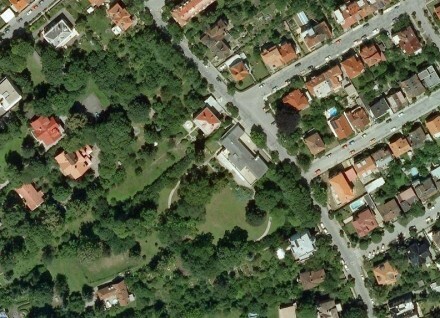 55 years ago I have graduated under the hill (na Porici) so close and in the same time so fare from Vila.